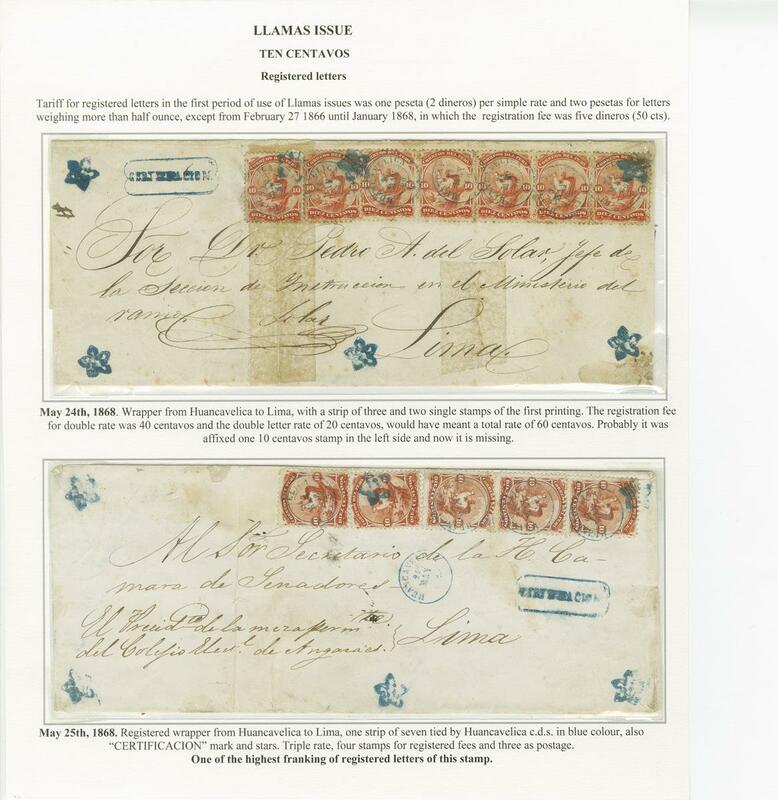 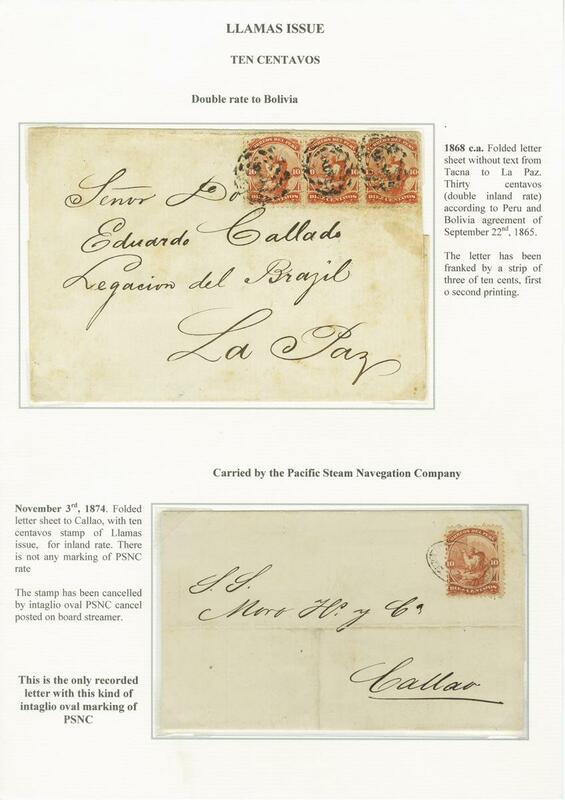 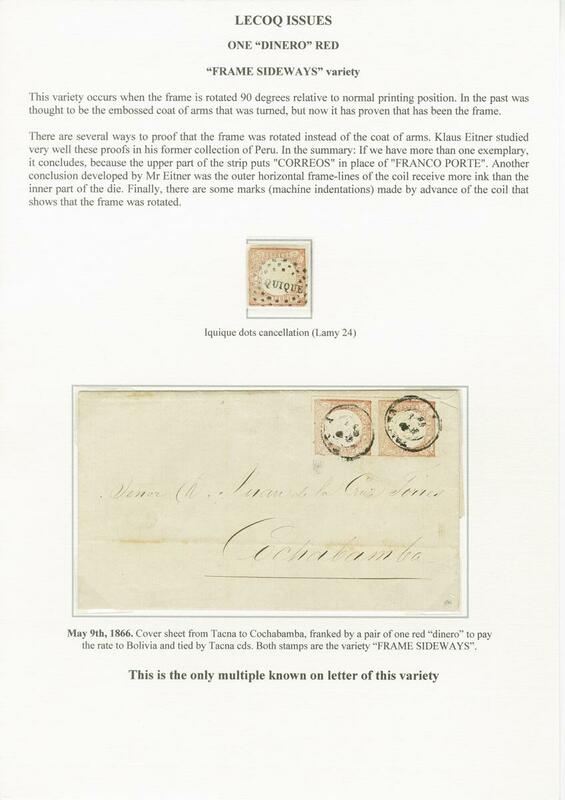 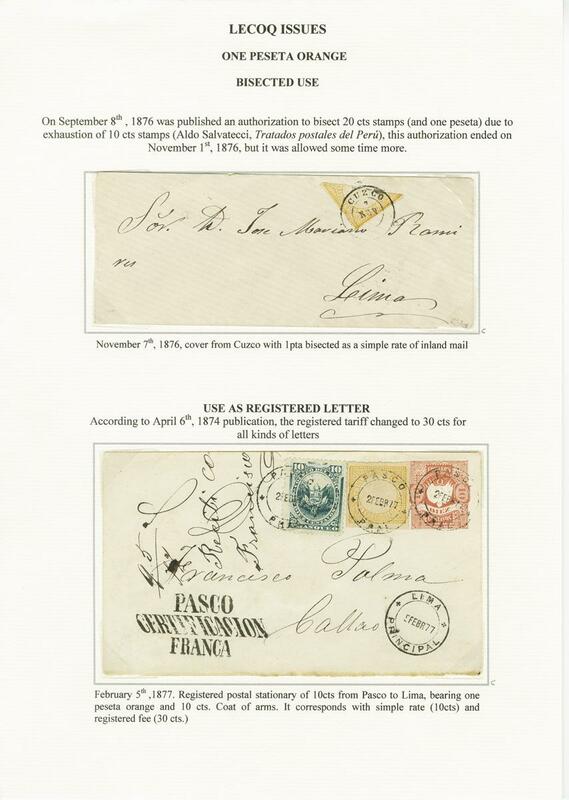 Peru - An Award Winning Private Treaty Collection. 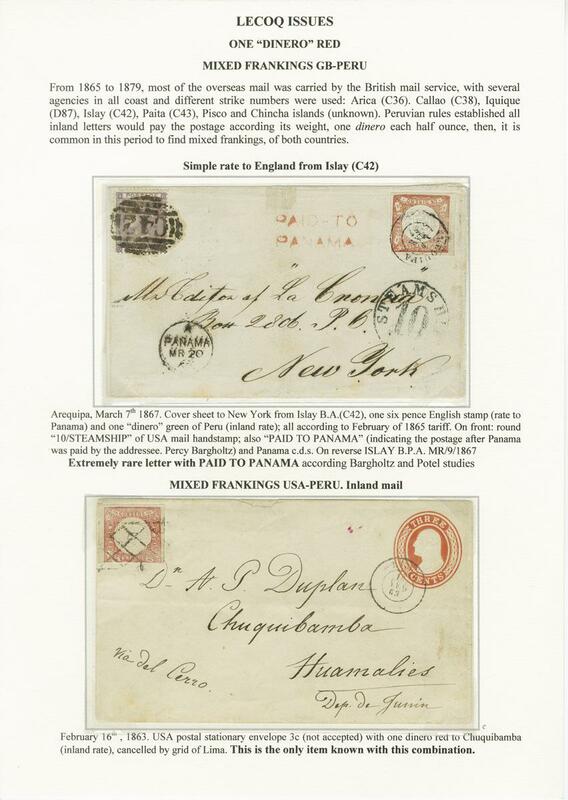 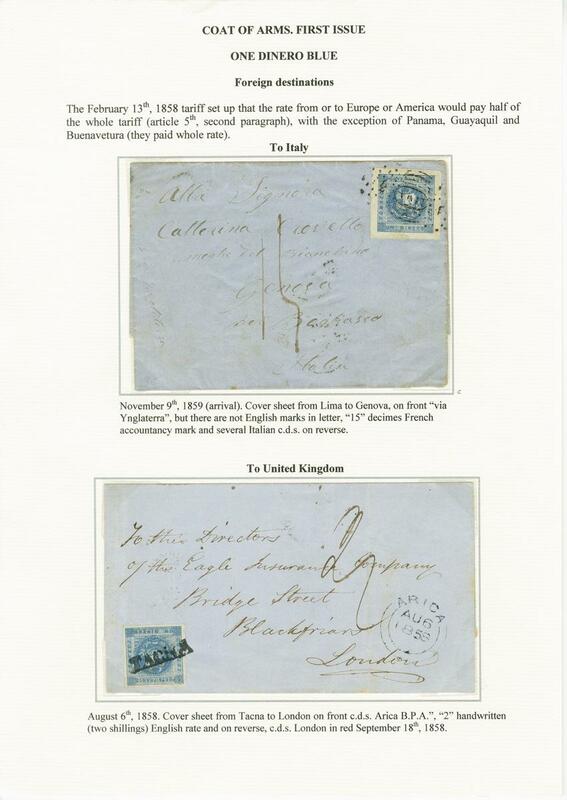 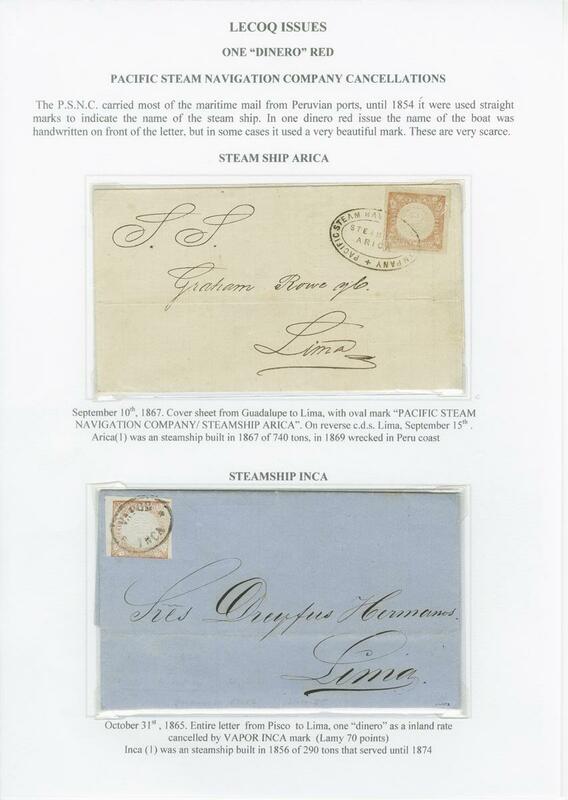 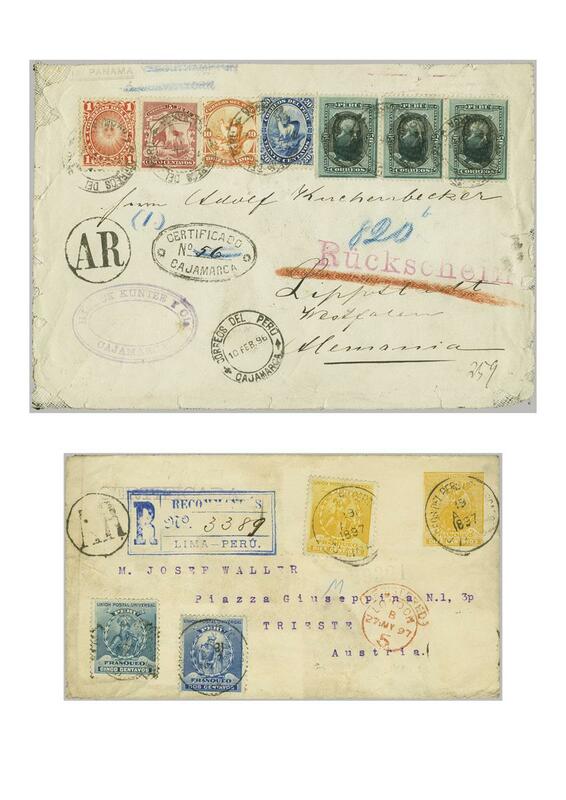 The collection begins with two wonderful covers with the FRANCA yellow labels, the earliest usages of the seven recorded covers; followed by the Pacific Steam Navigation Company issue of 1857 - with two black Die Proofs (ex Steindler & Eitner), a 1 real usage on letter to Valparaiso (one of four genuine covers recorded, ex Bustamente with three RPSL certificates), the extraordinary multiples of the 1 real blue in a mint block of nine (Corinphila 1957 and ex Eitner) and the 2 reales brown in a mint block of ten from top of sheet which is the second largest recorded. 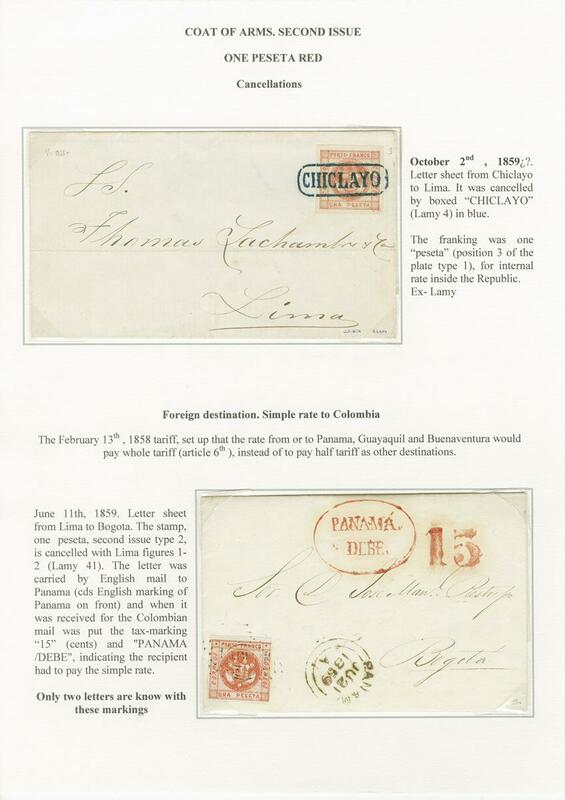 Thereafter the Traditional Exhibit shows the Peruvian national issues from 1858 onwards, with Plating studies, multiples, and outstanding covers and frankings throughout with highlights such as the “Palpa” first issue registered cover, the famous cover with 17 examples of the 1 dinero used from Caxamarca and a combination cover with the 1 peseta red. 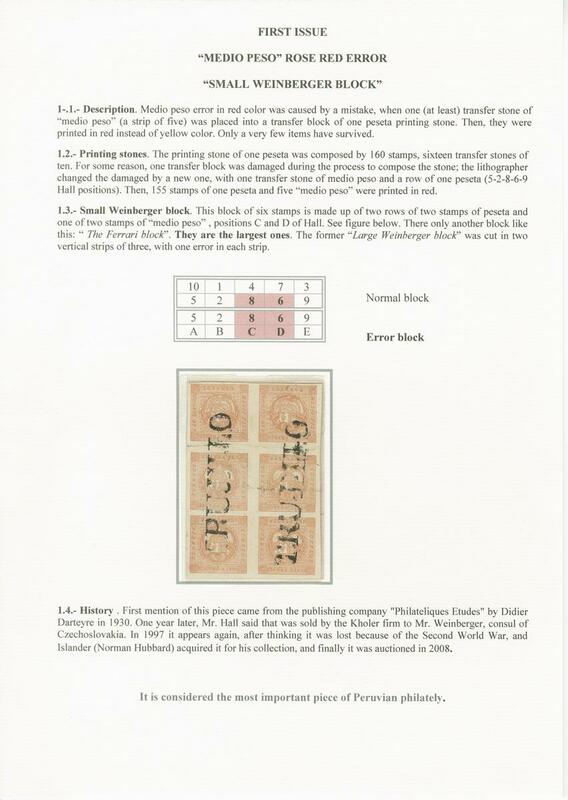 The “Error of Colour” Medio peso in rose is shown with both the “Consul Weinberger” block of six and the matching “Ferrary” block of six both with the two errors se-tenant with normals (unique multiples), the Error on cover (ex Schatzkes, Stork, Gonzalez Garcia and Le Bow), the Error in pair with normal 1 peseta on cover (ex Bustamente and Eitner). 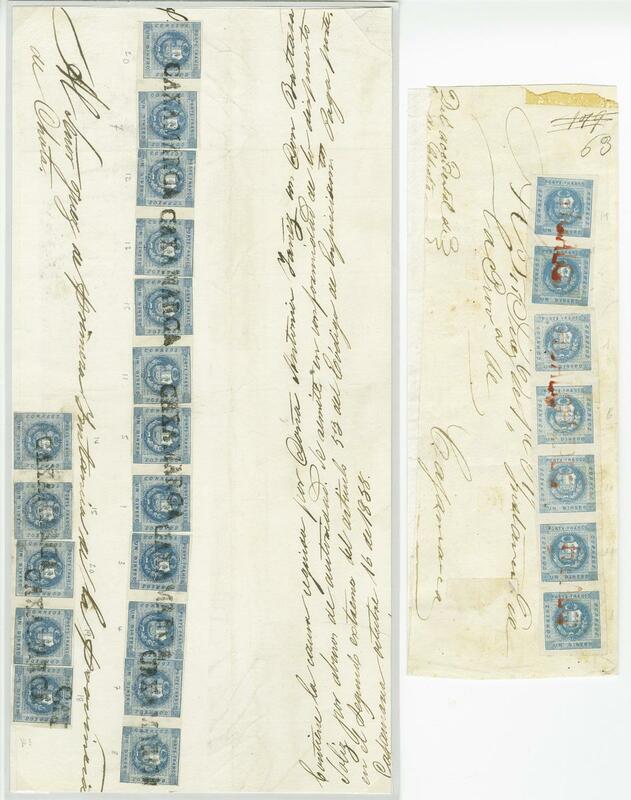 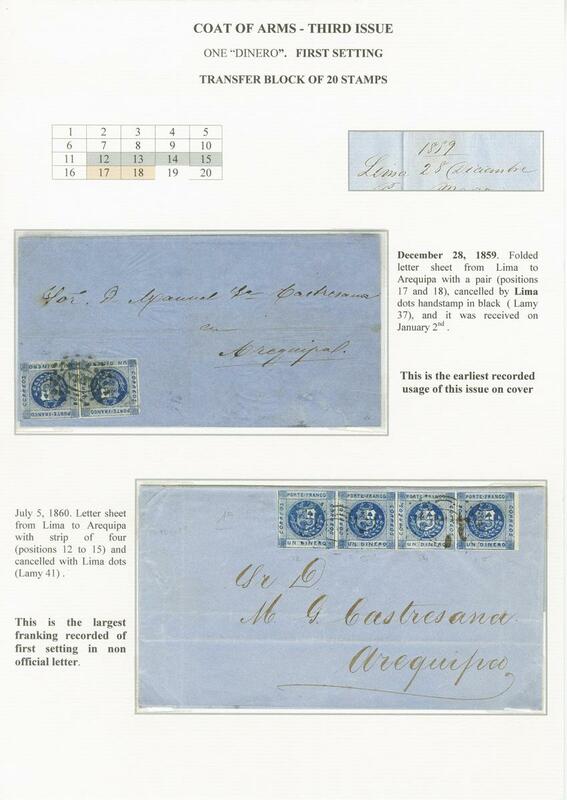 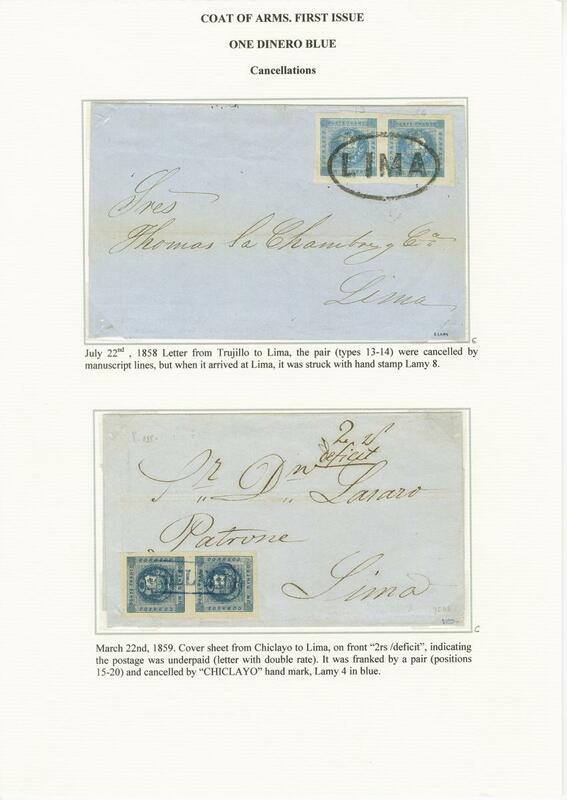 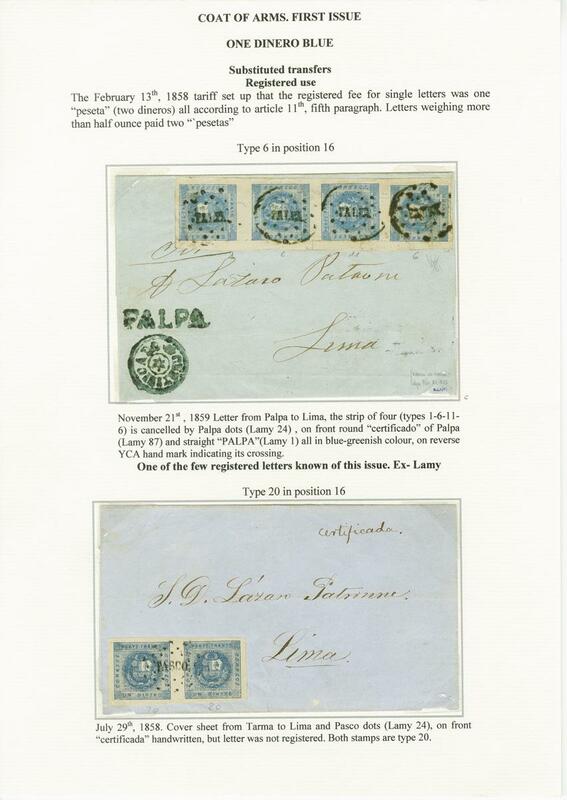 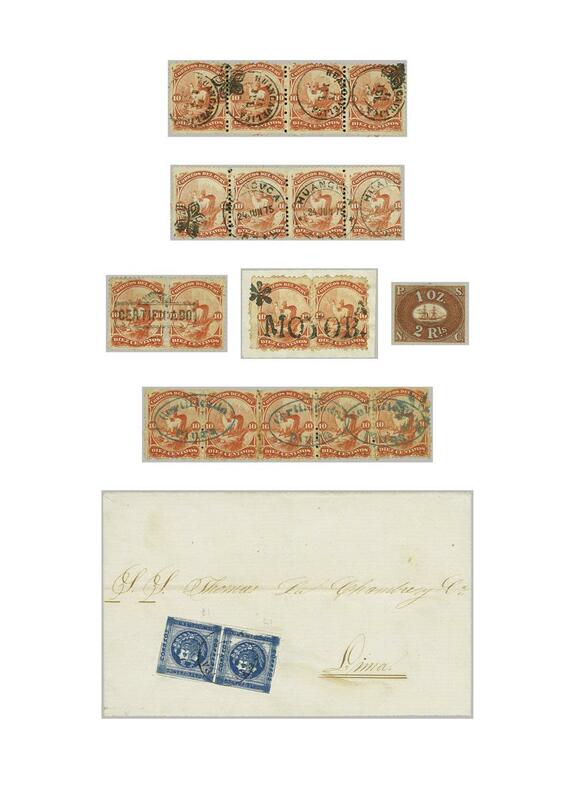 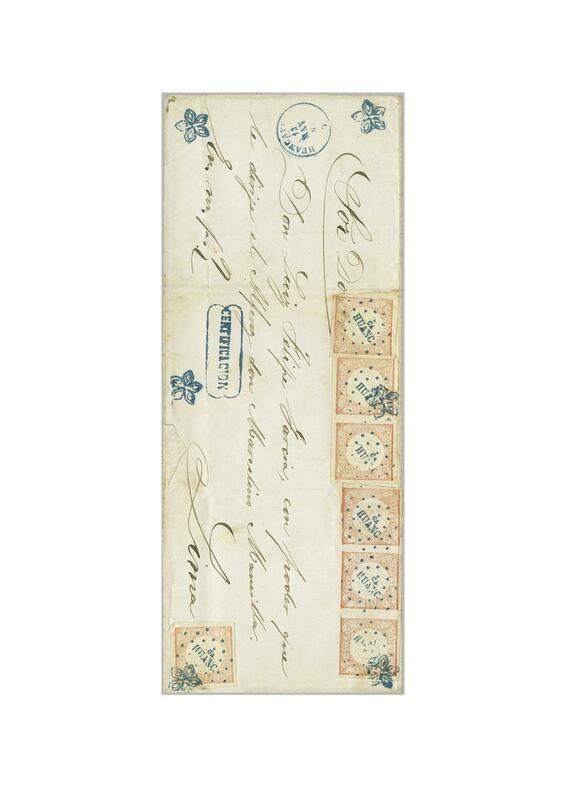 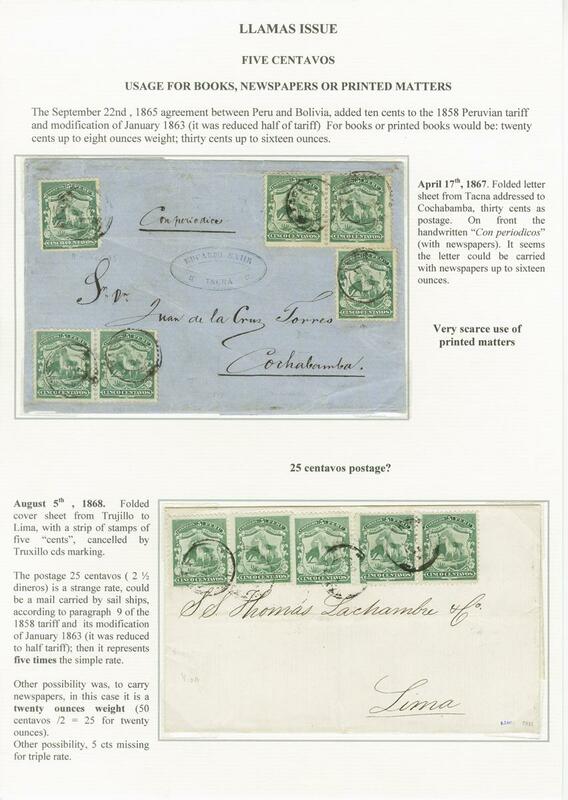 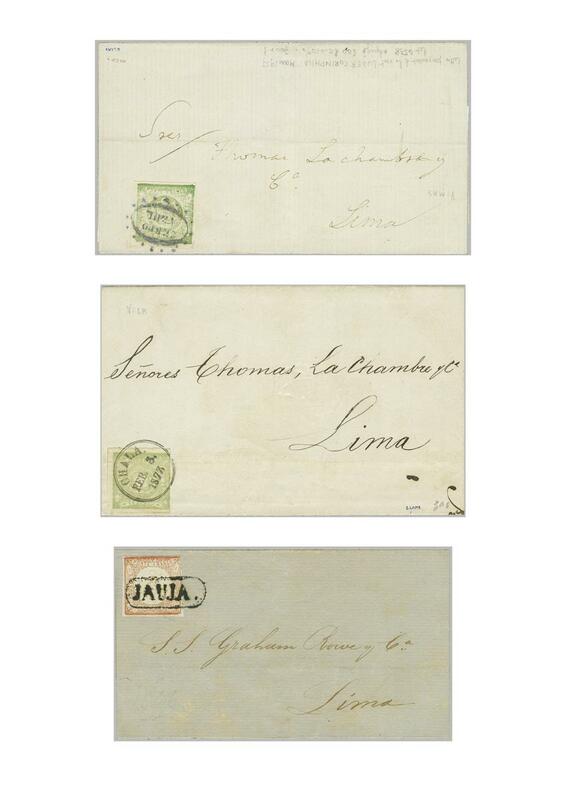 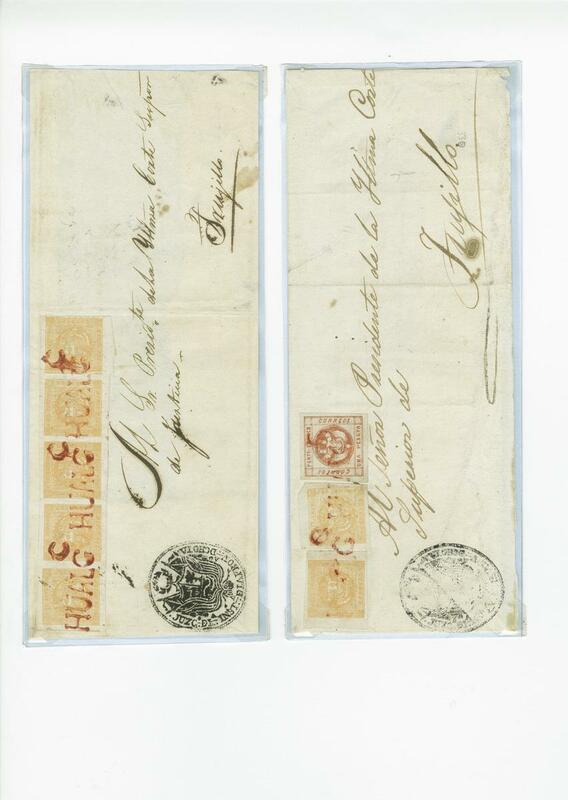 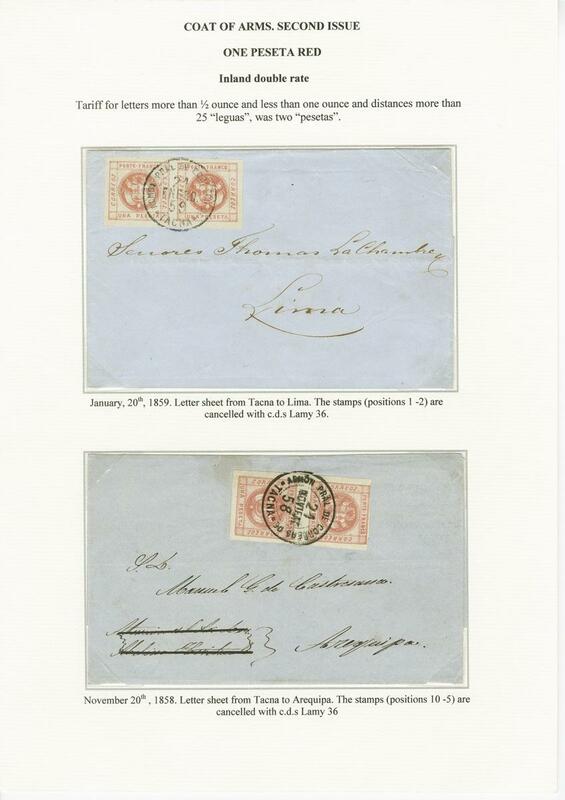 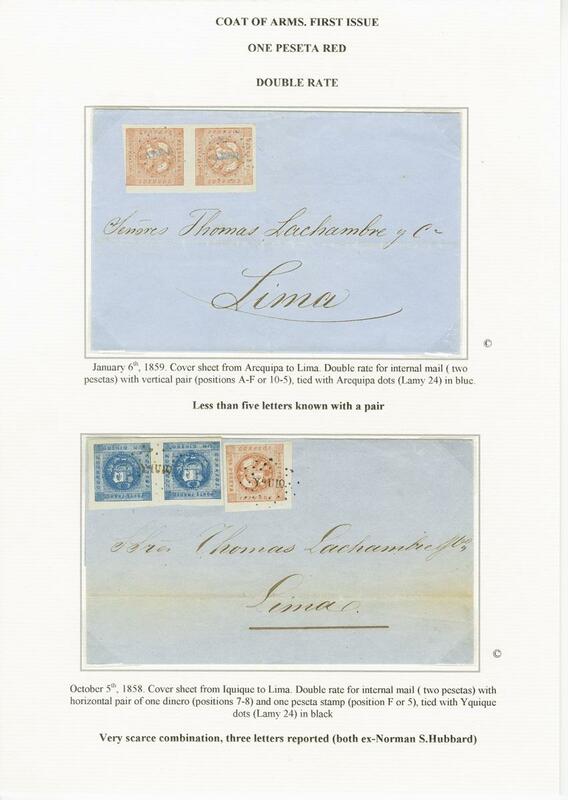 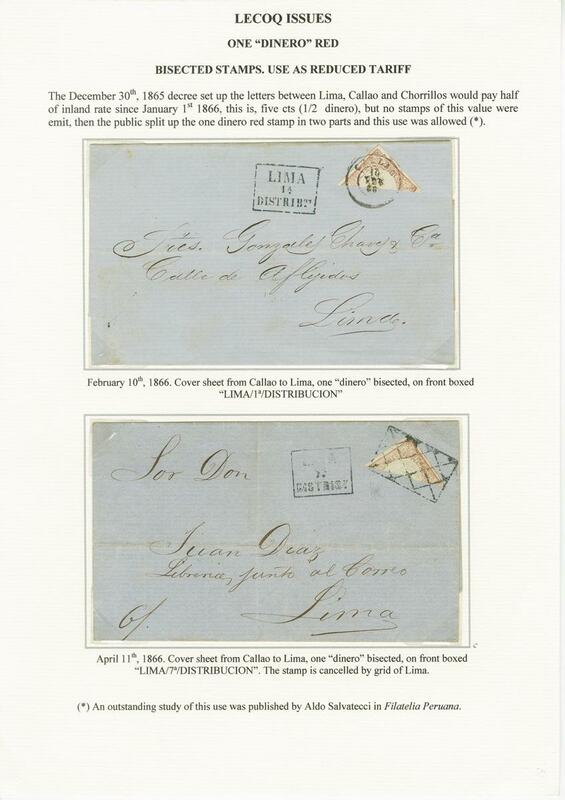 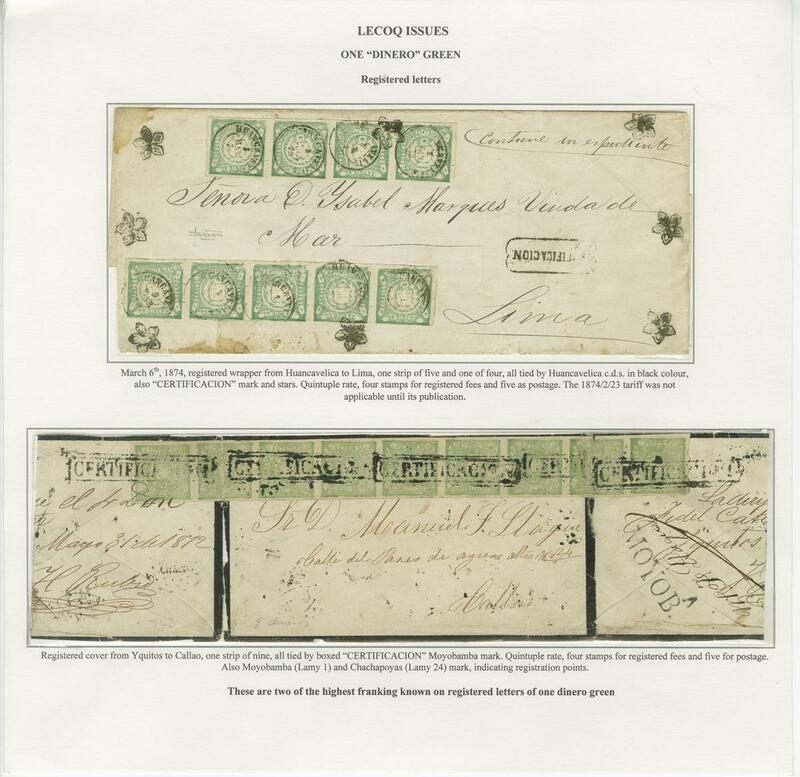 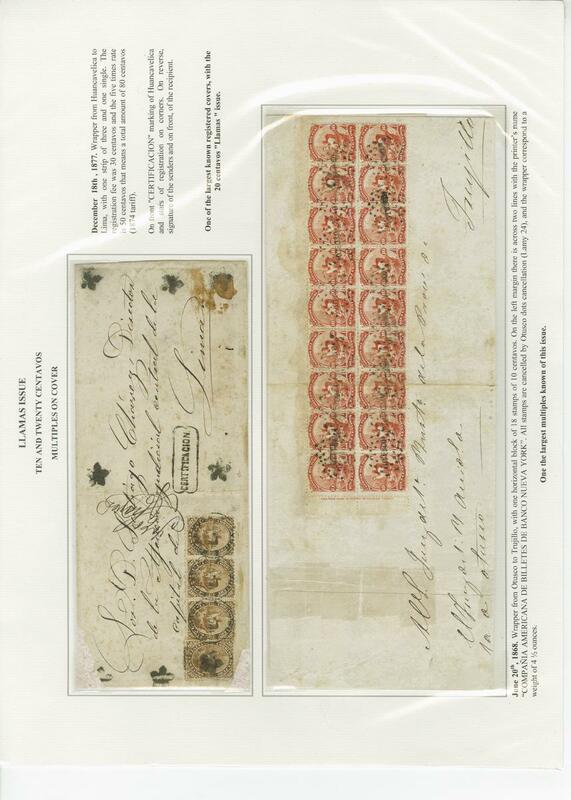 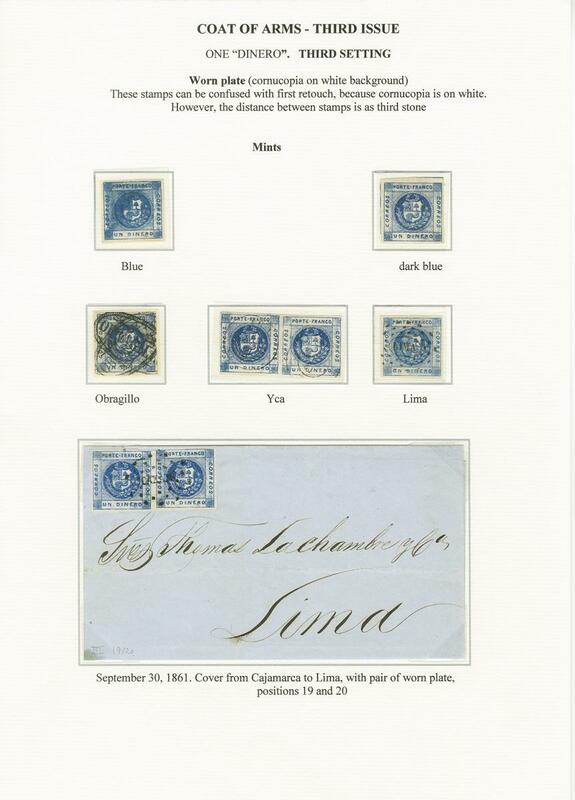 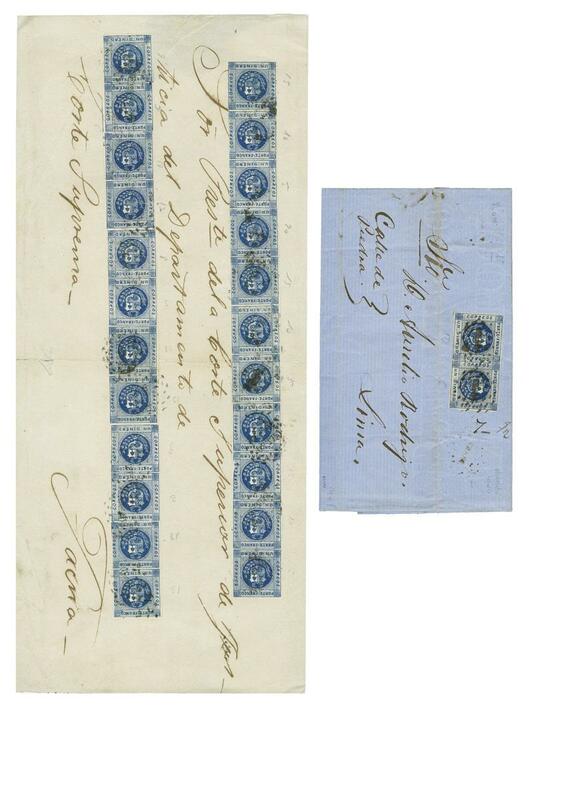 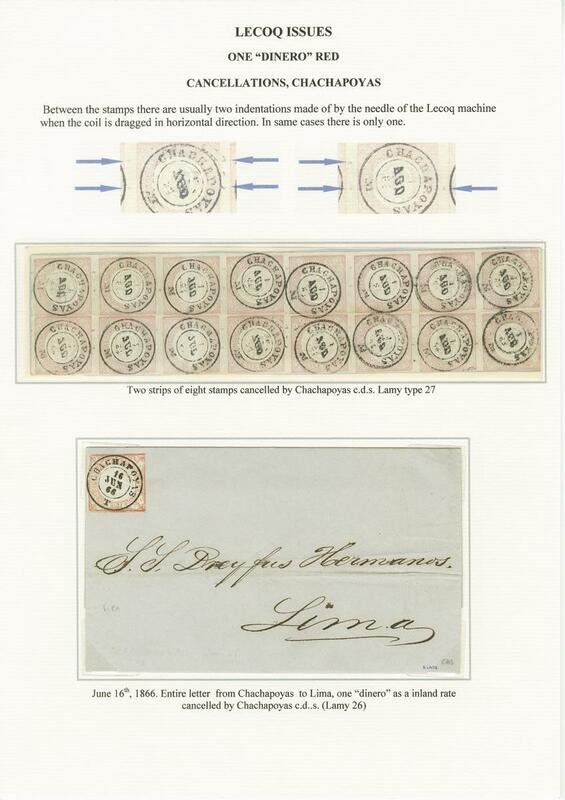 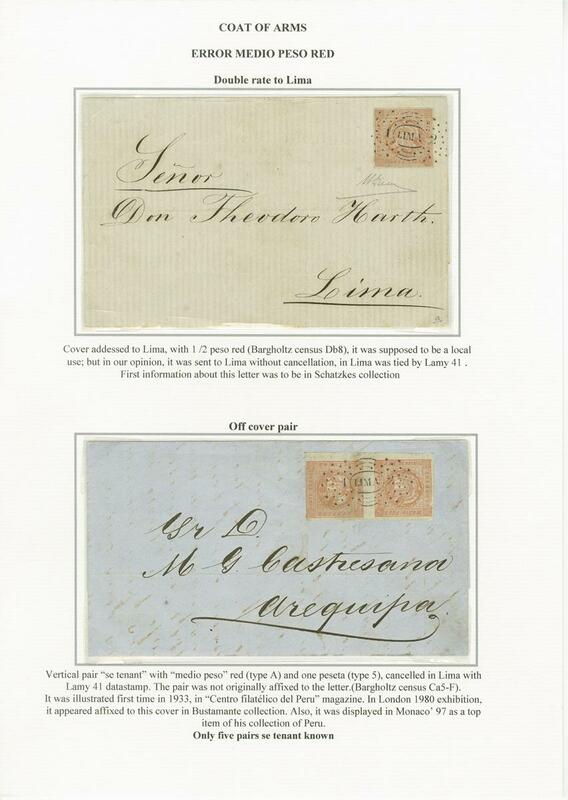 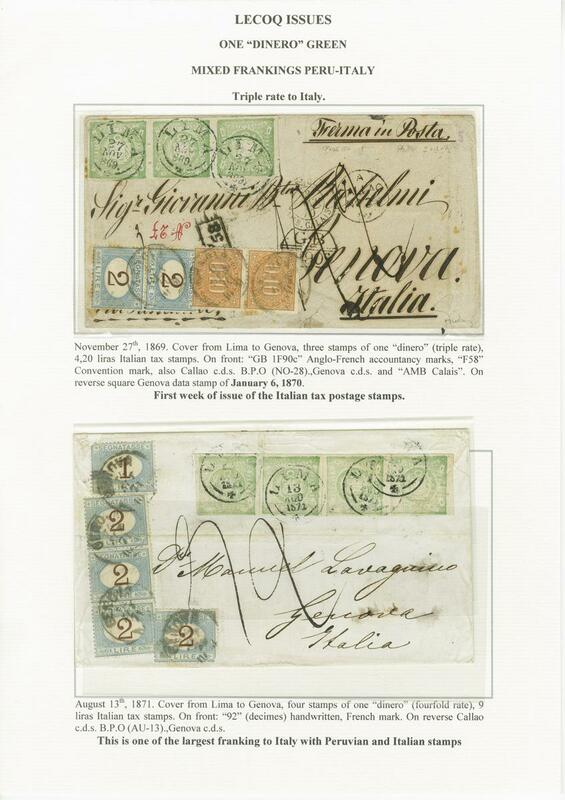 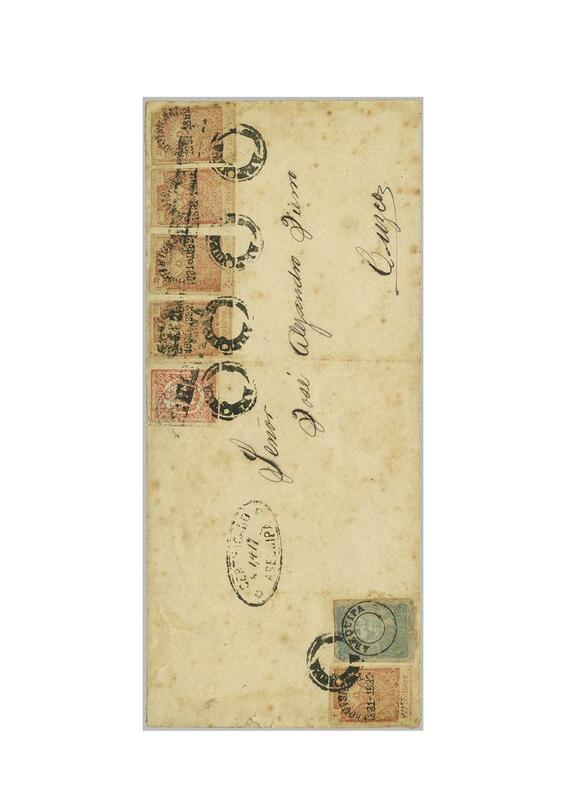 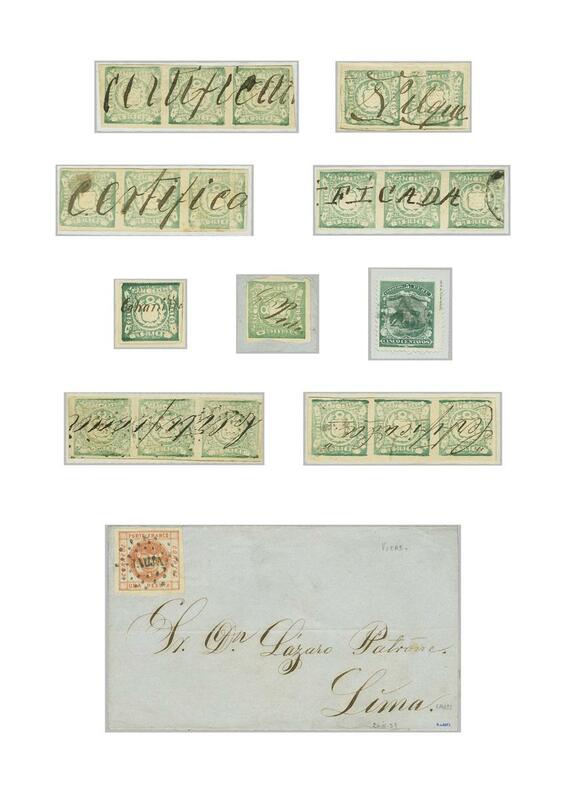 The 1858 Medio peso yellow is represented by a strip of four on letter and two covers to Bolivia, the November 1858 1 dinero blue with two mint pairs and the largest mint multiple of the 1 peseta red - a horizontal pair together with a cover showing a remarkable 21 examples used to Trujillo. 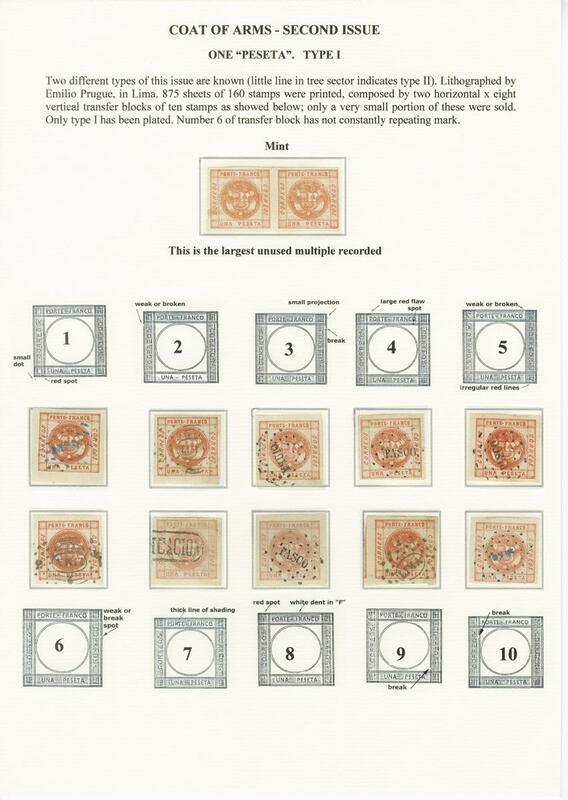 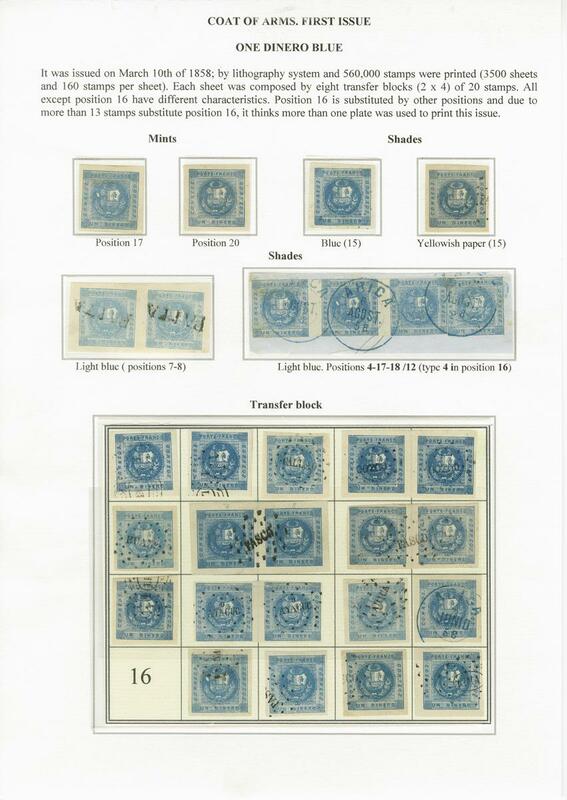 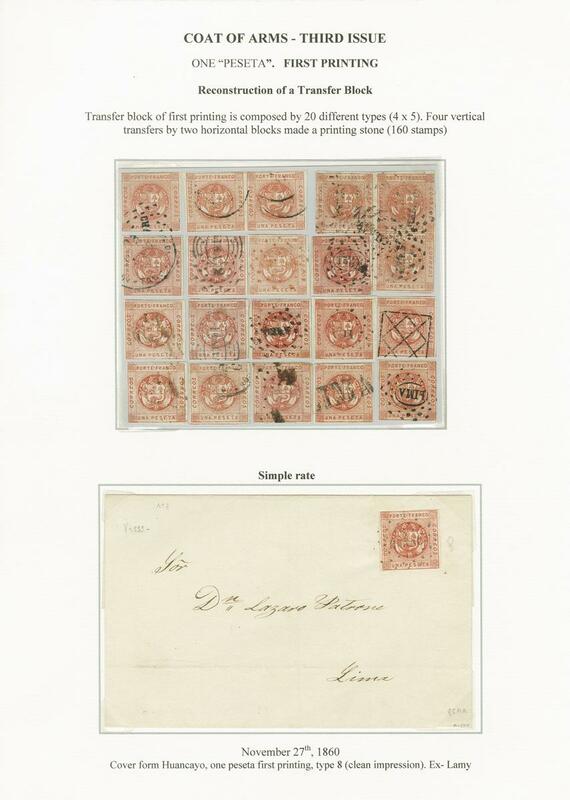 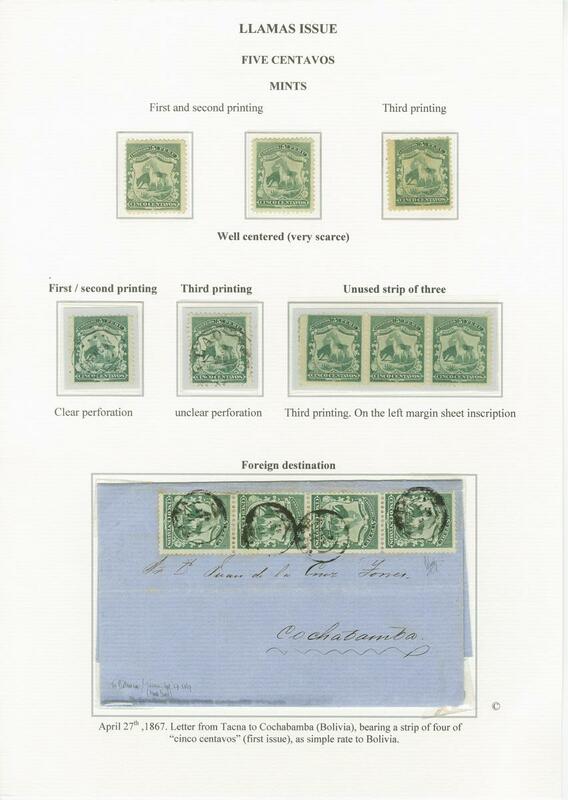 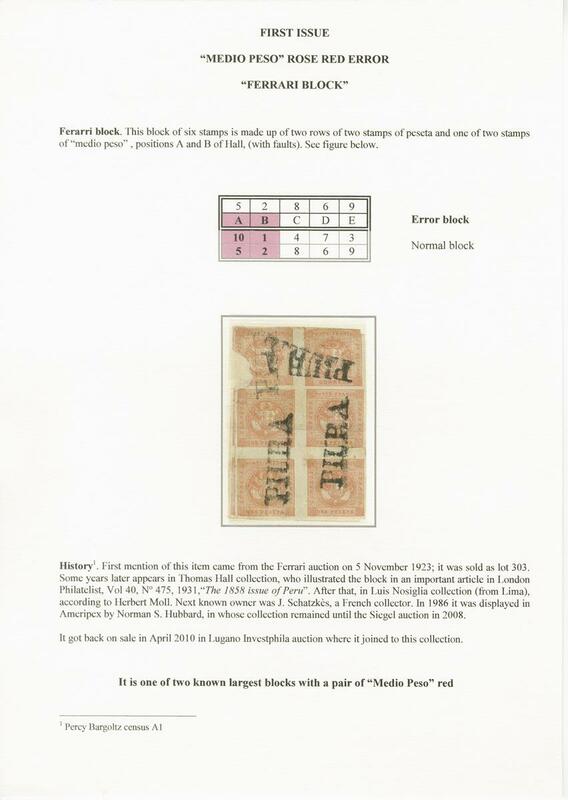 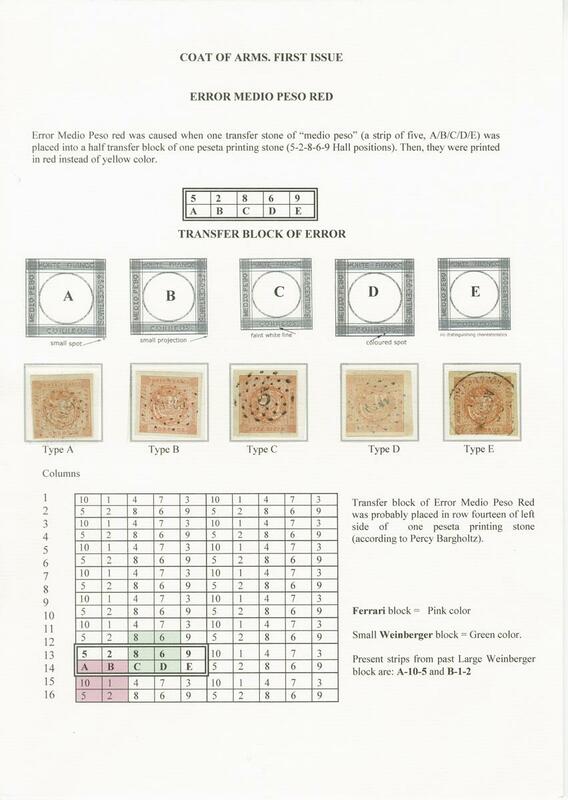 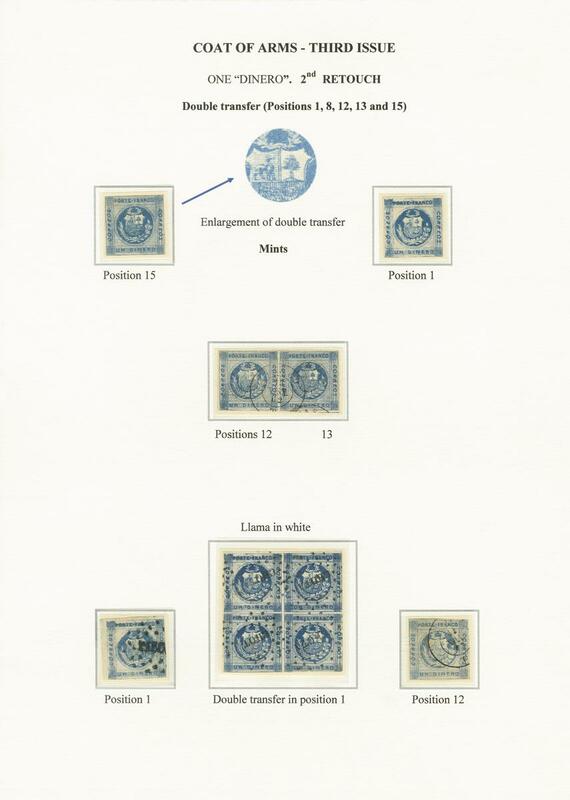 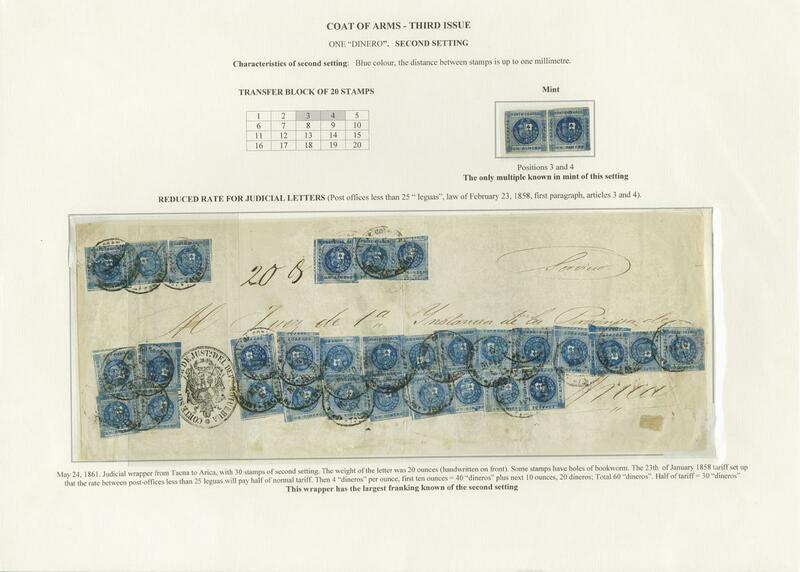 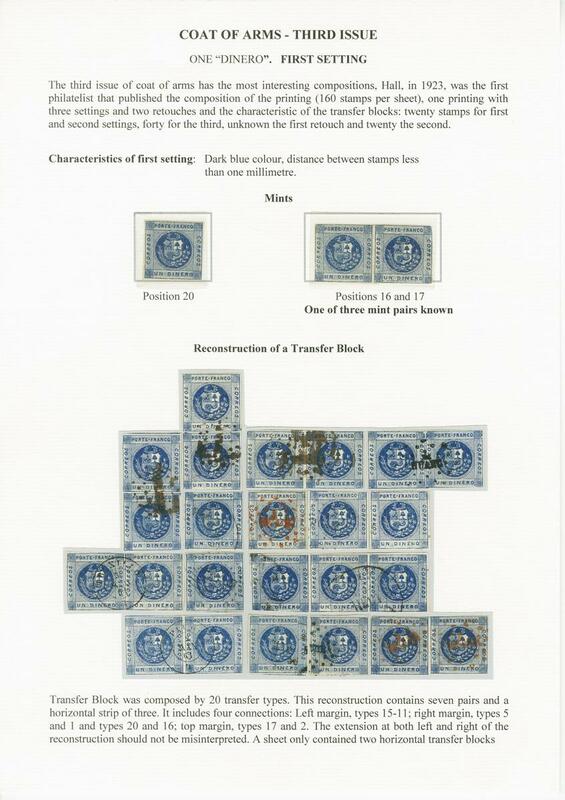 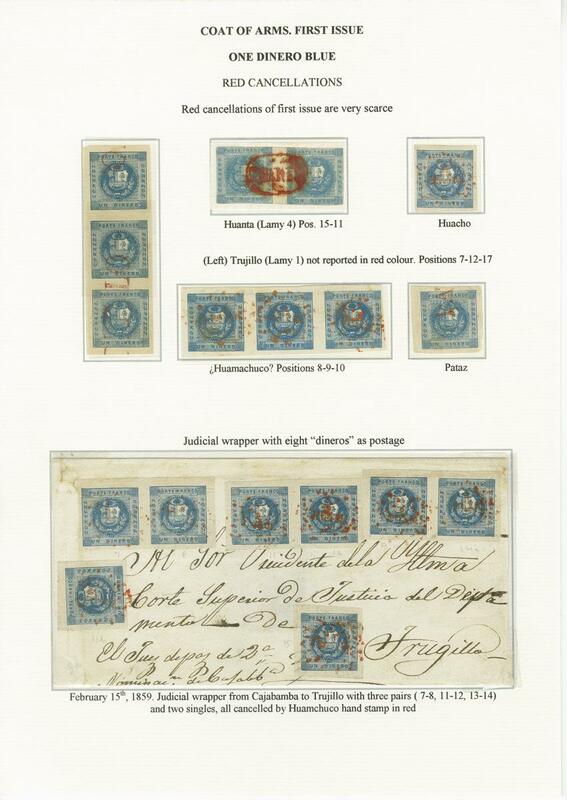 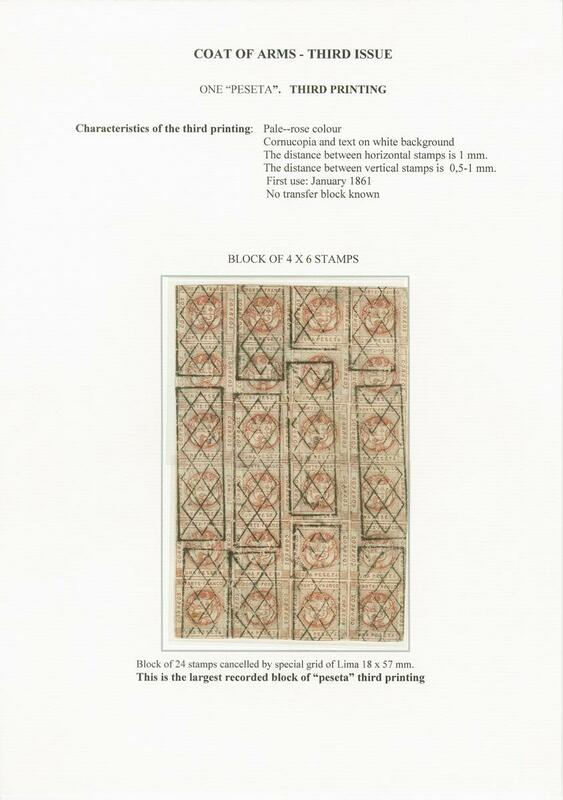 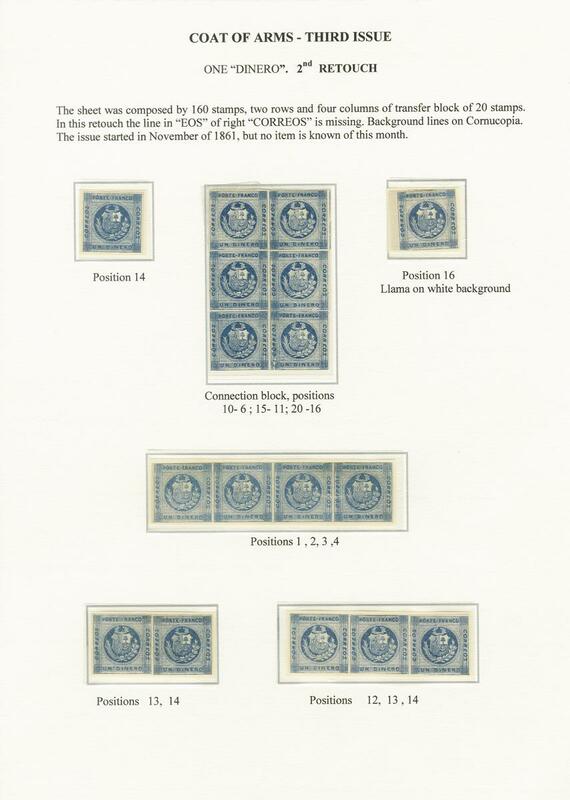 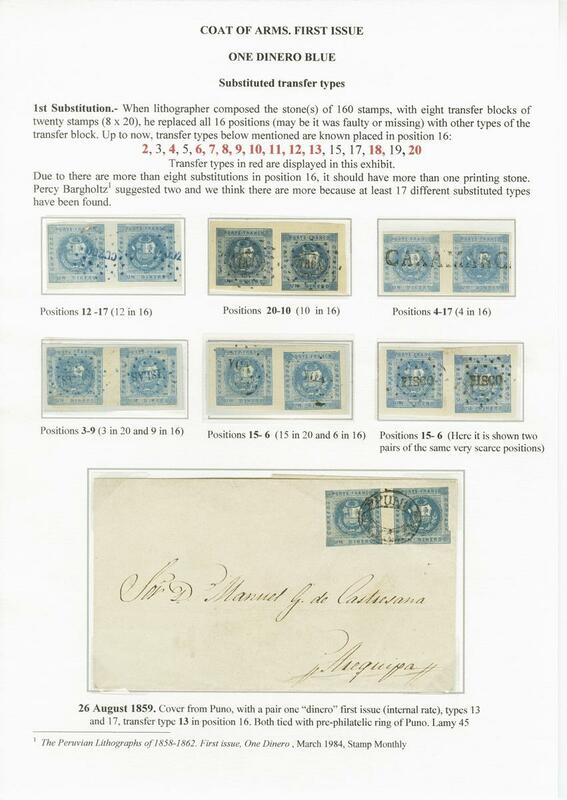 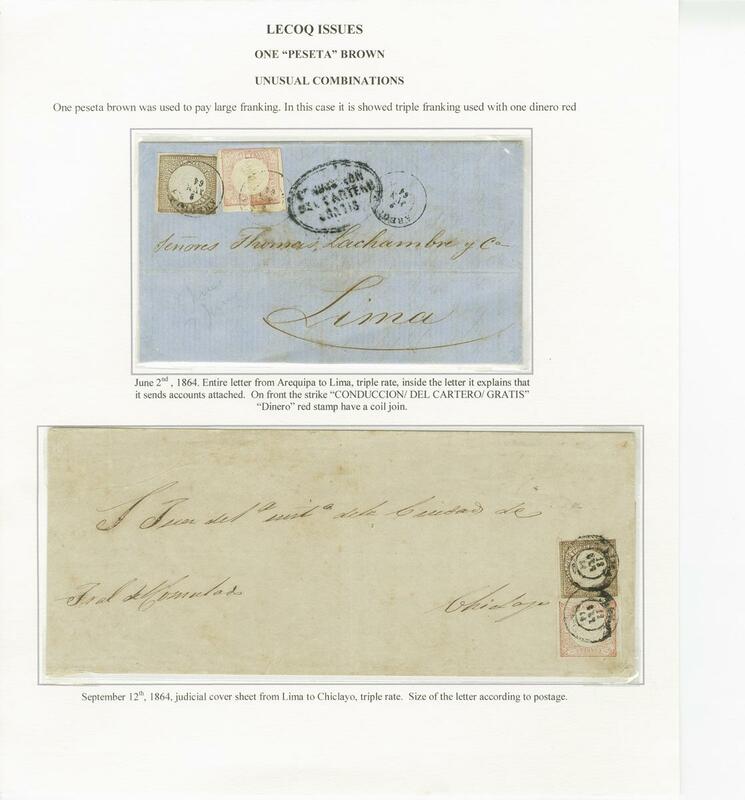 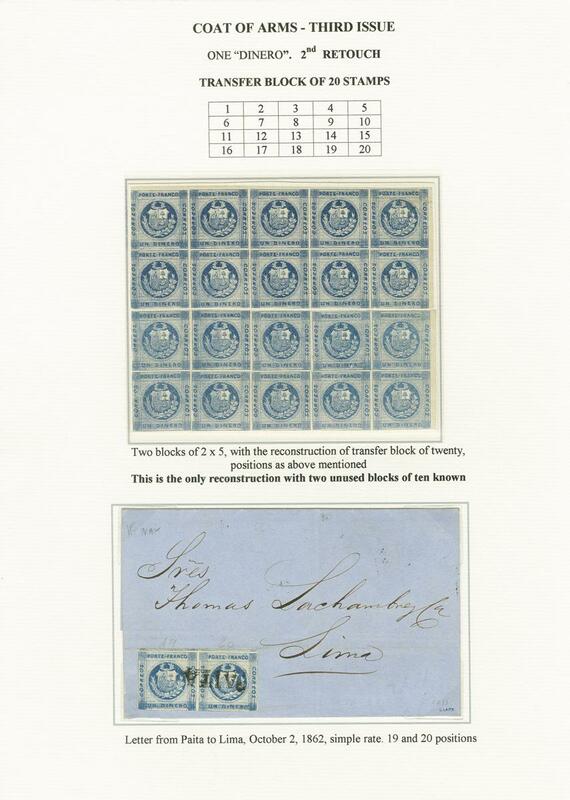 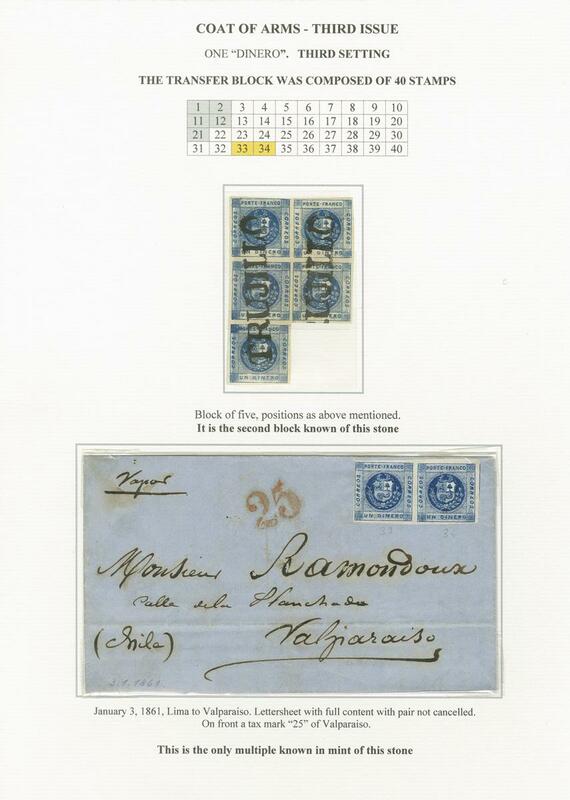 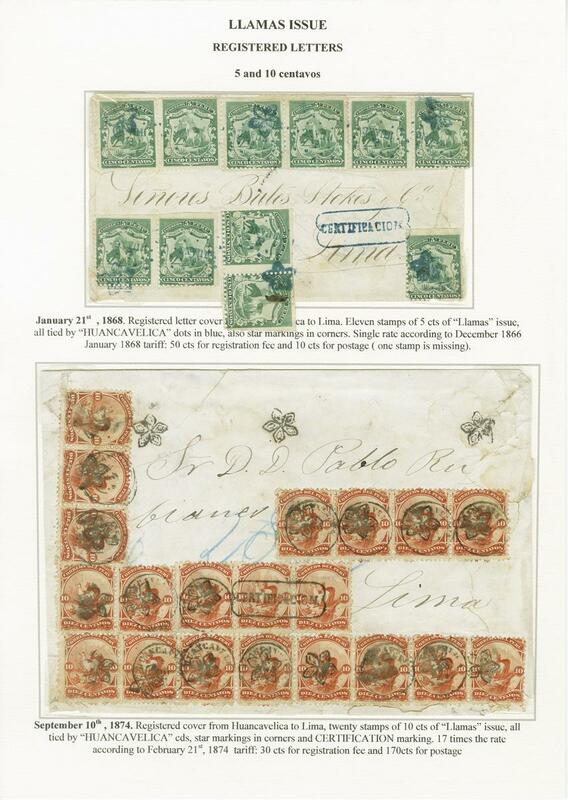 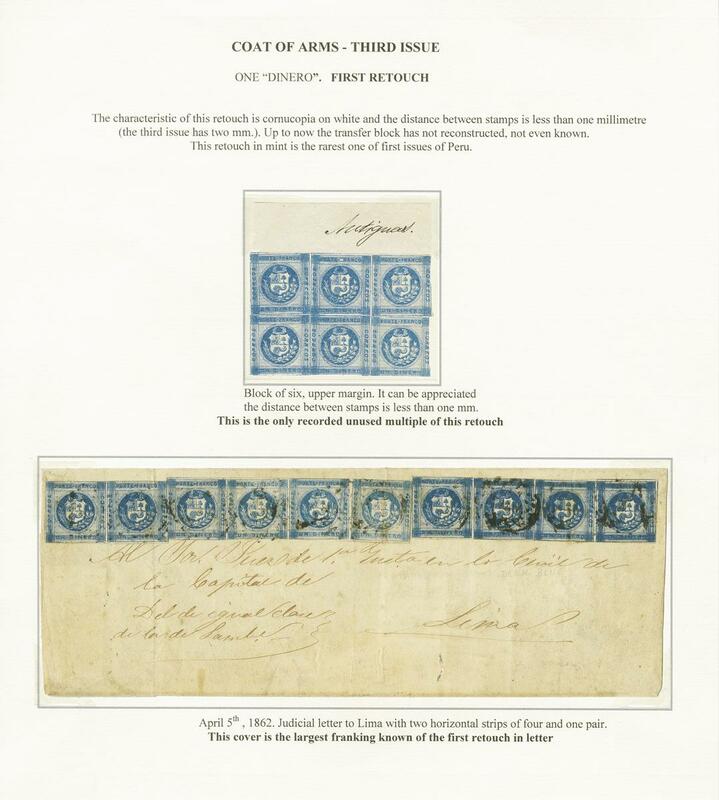 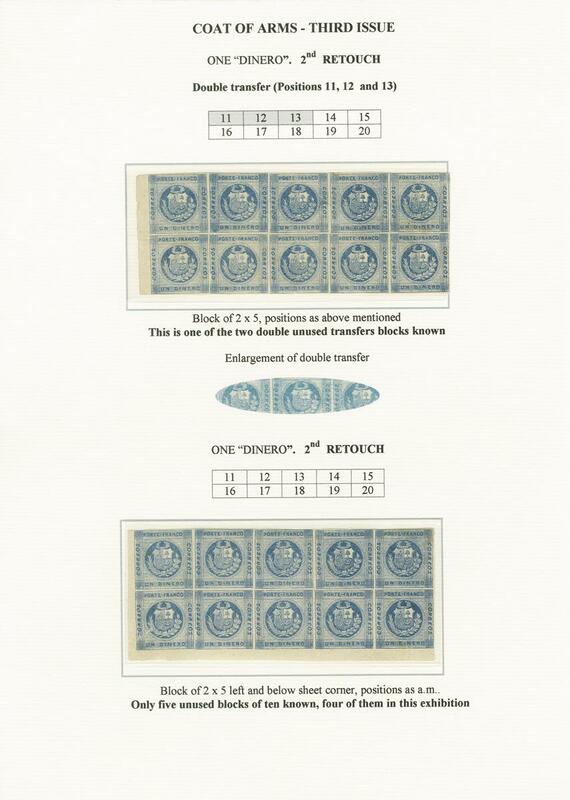 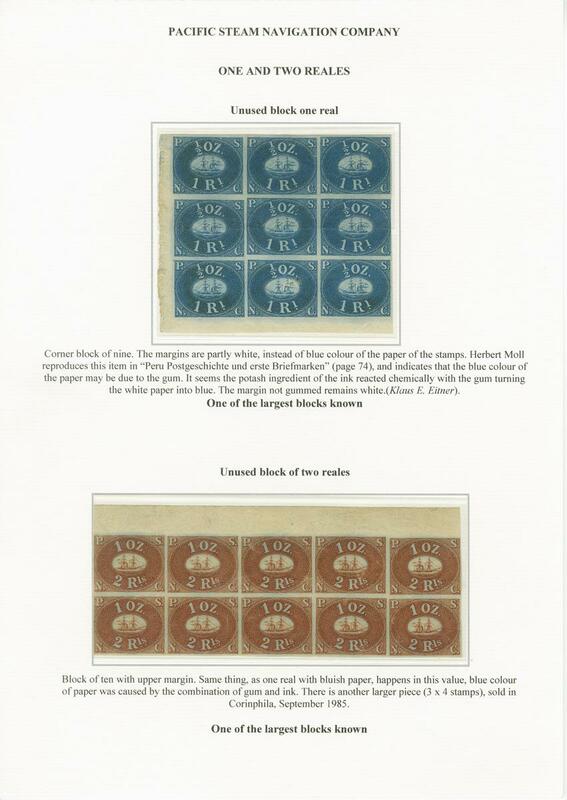 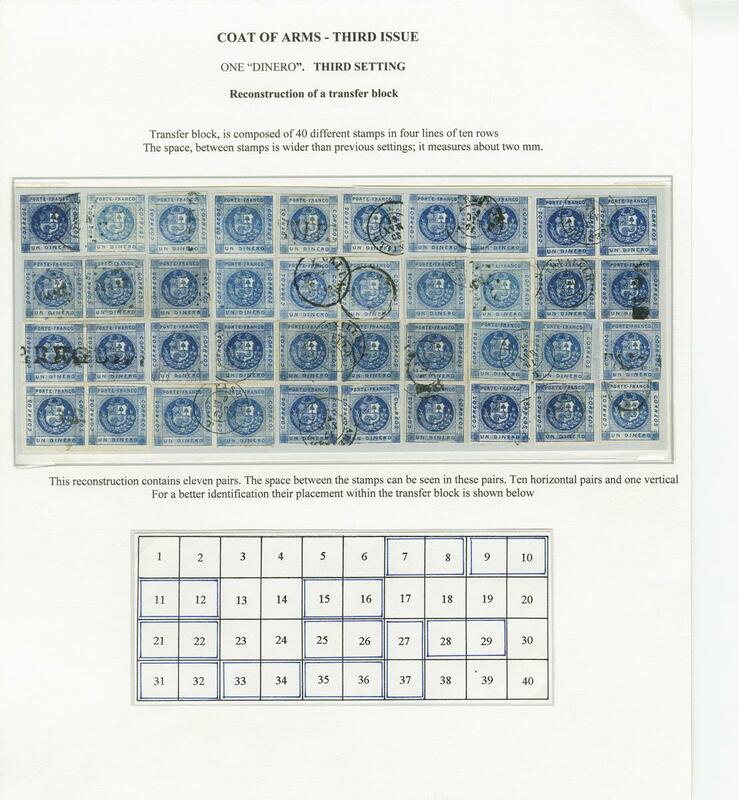 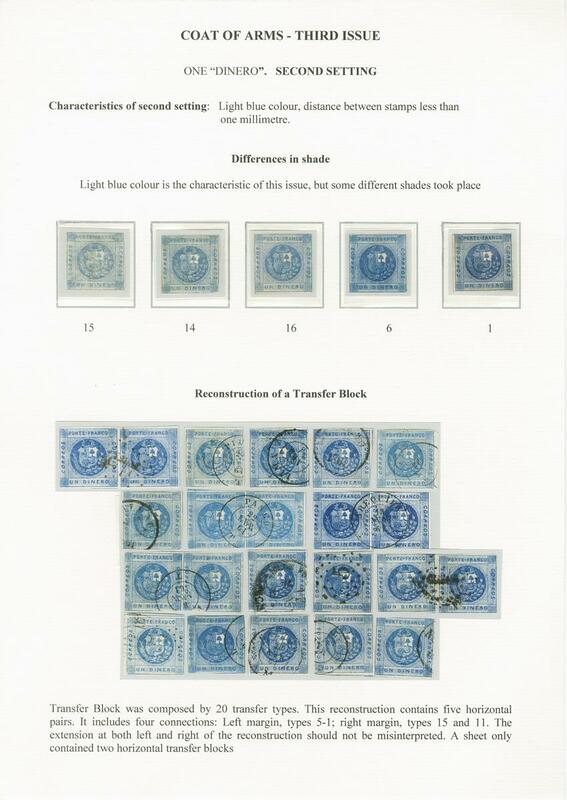 The third issue shows much original specialisation and study of the retouches and settings with the 1 dinero blue in two of the three known mint pairs from the 1st Setting and the spectacular judicial cover bearing no less than 30 examples; the 1st Retouch with a mint block of six and ten examples on cover, four of the ten known unused blocks of ten from the 2nd Retouch, the 1860 1 peseta red with covers bearing 17, 23 and an astonishing cover with 43 examples, 3rd printing with a unique used block of 24. 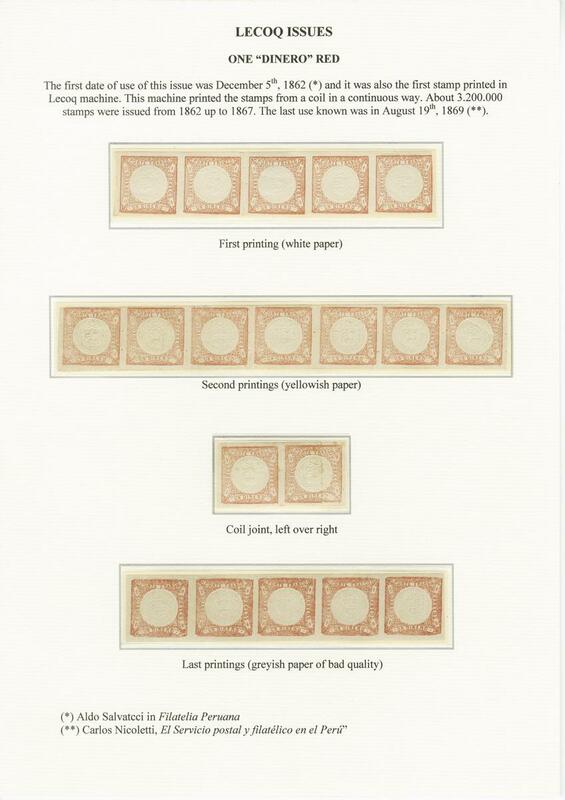 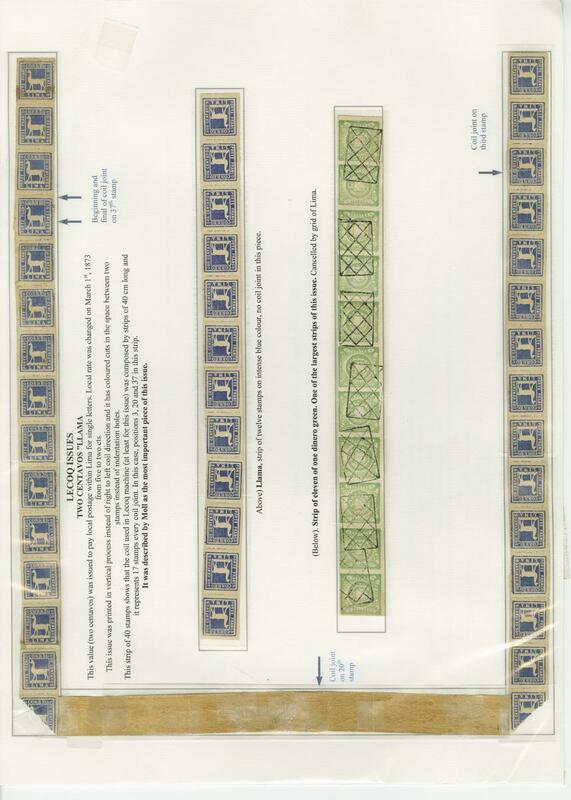 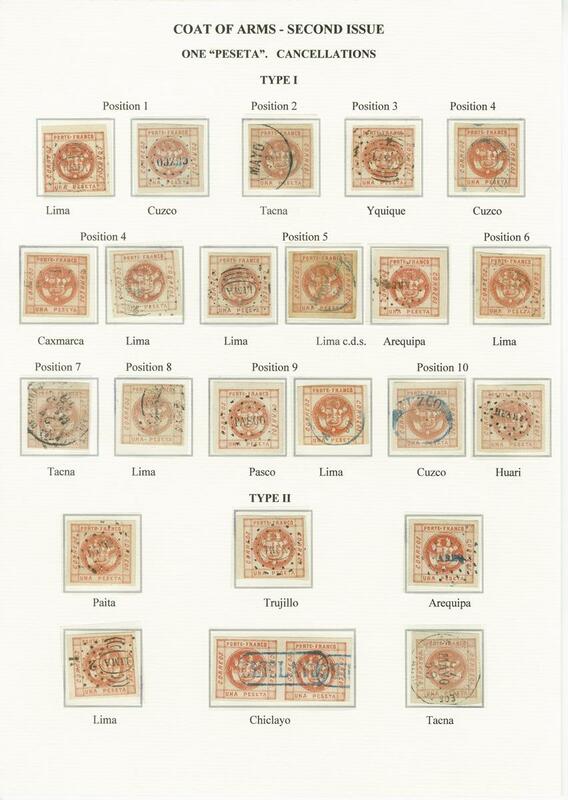 The Le Coq embossed issue continues with the 1 dinero rose in unused strips of five and seven, used strips of seven and eight and usages on registered mail, judicial usages with large frankings of 29 and 34 stamps on letter and an amazing usage in combination with the Great Britain “Paid At Arica” Crown Circle. 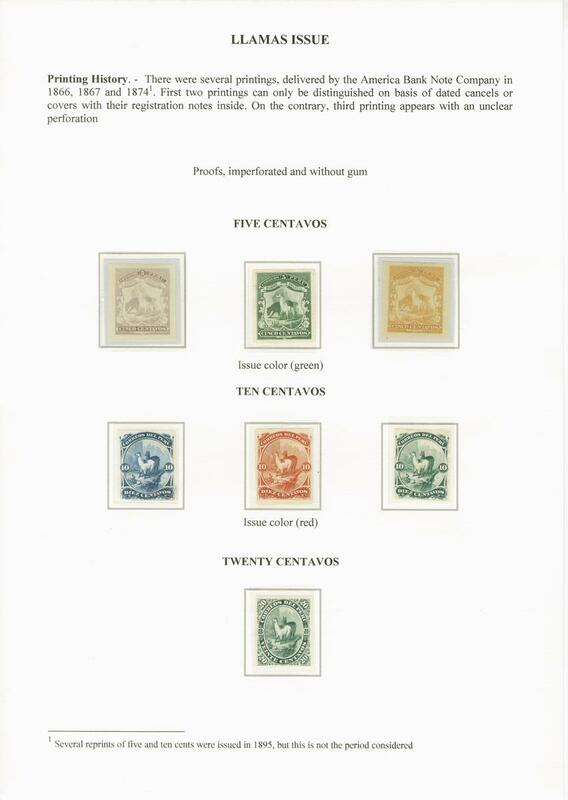 The Llama issue is represented by covers bearing 11 values of the 5c. 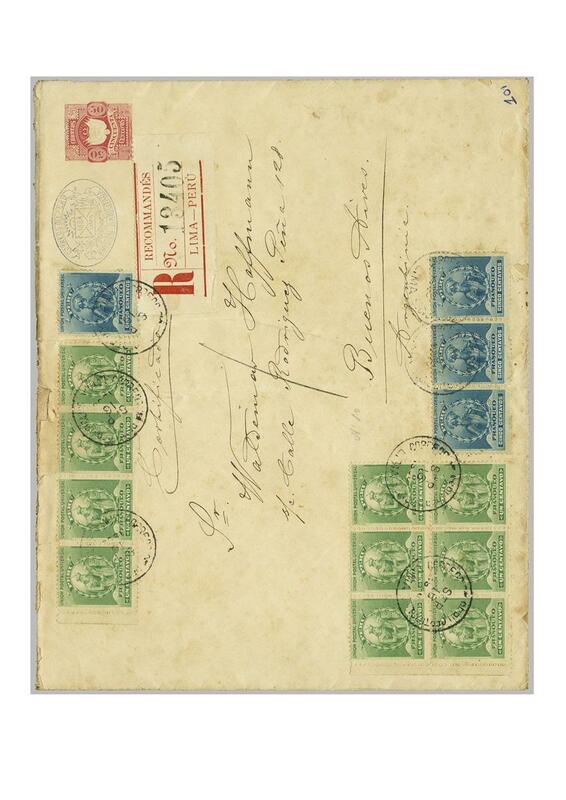 green and a registered cover with 20 examples of the 10c. 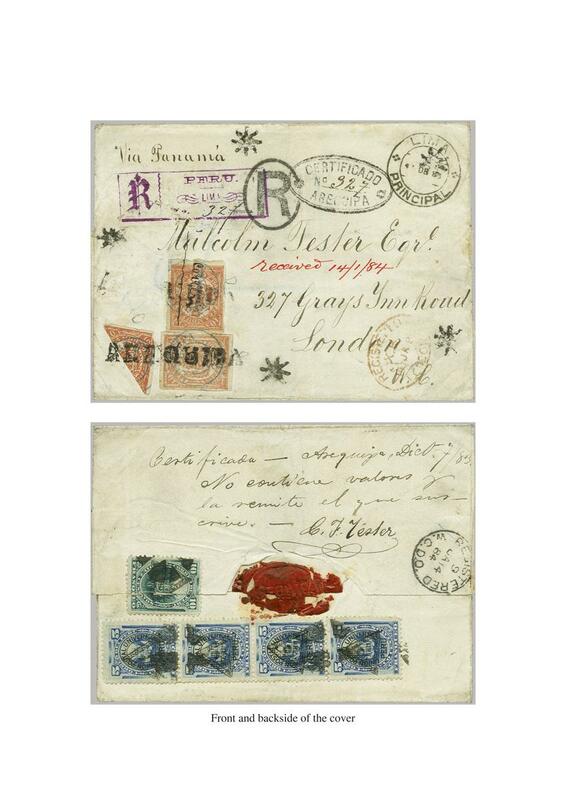 red, combination covers with the British Post Offices, the rare 20c. 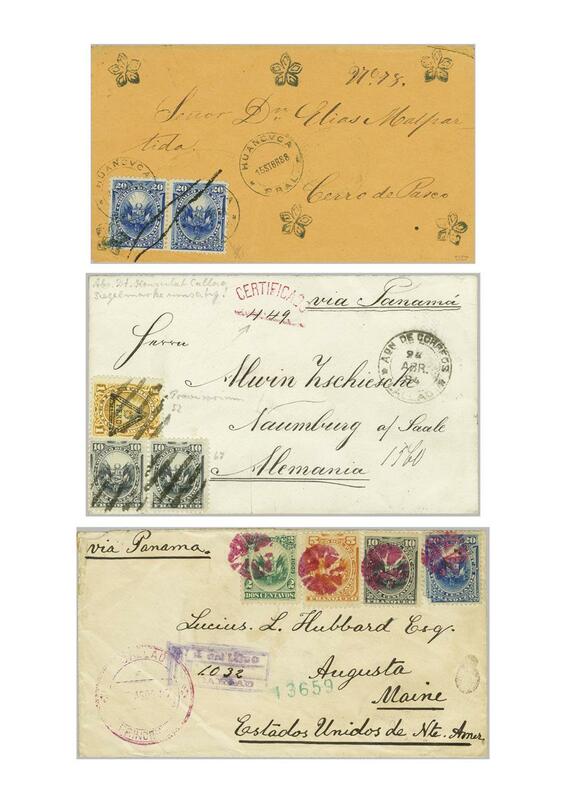 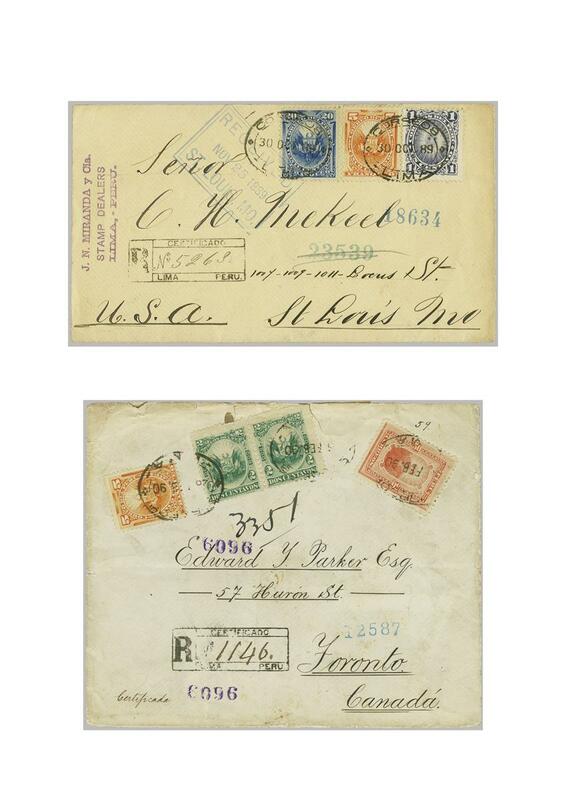 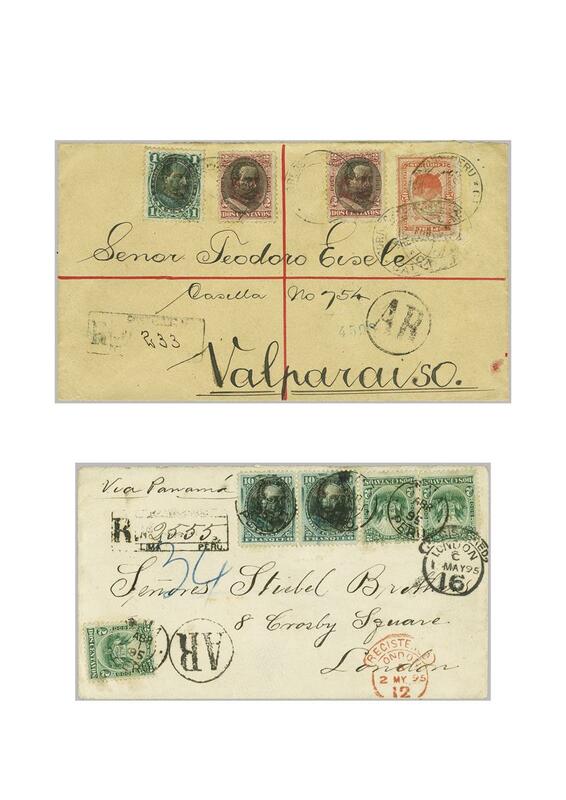 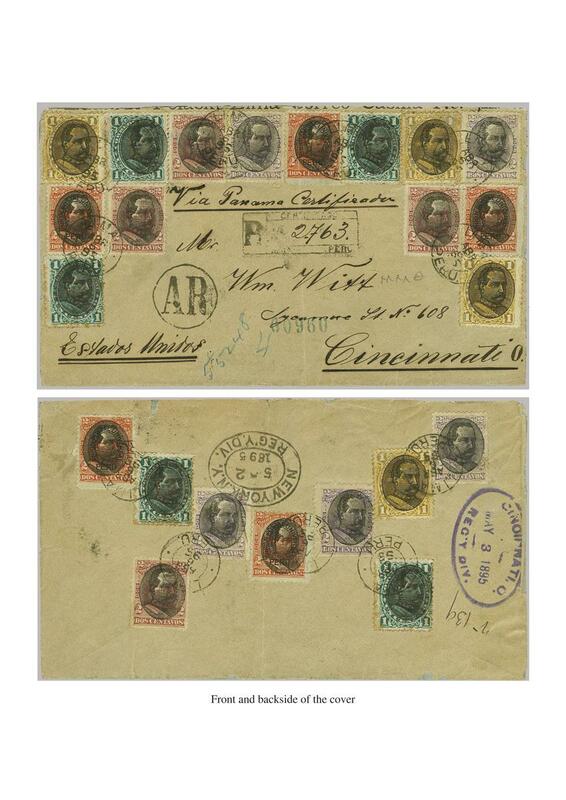 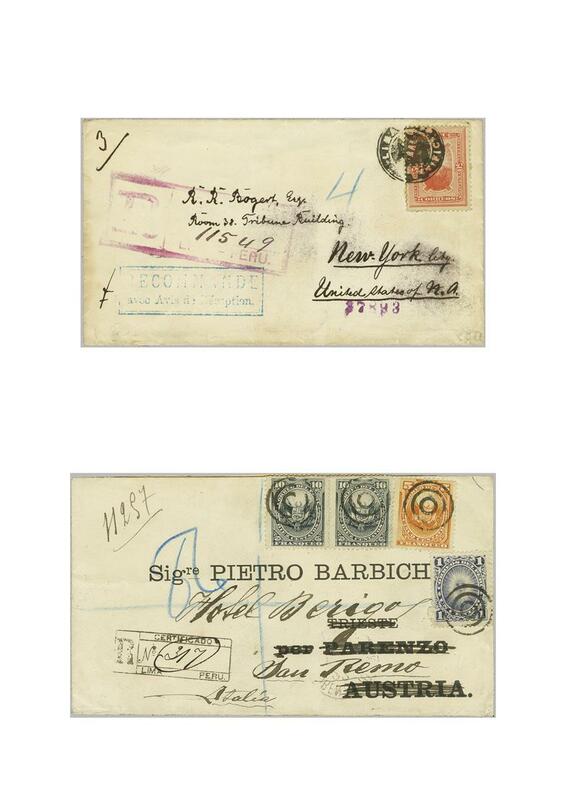 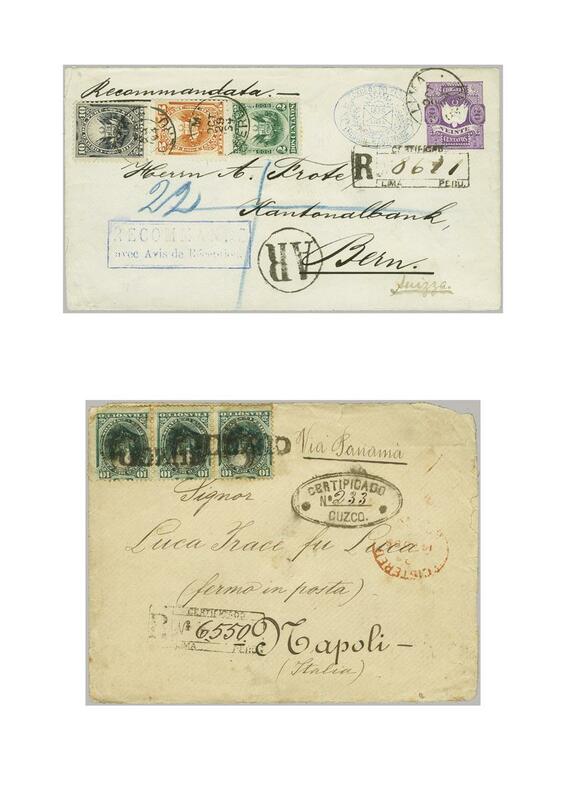 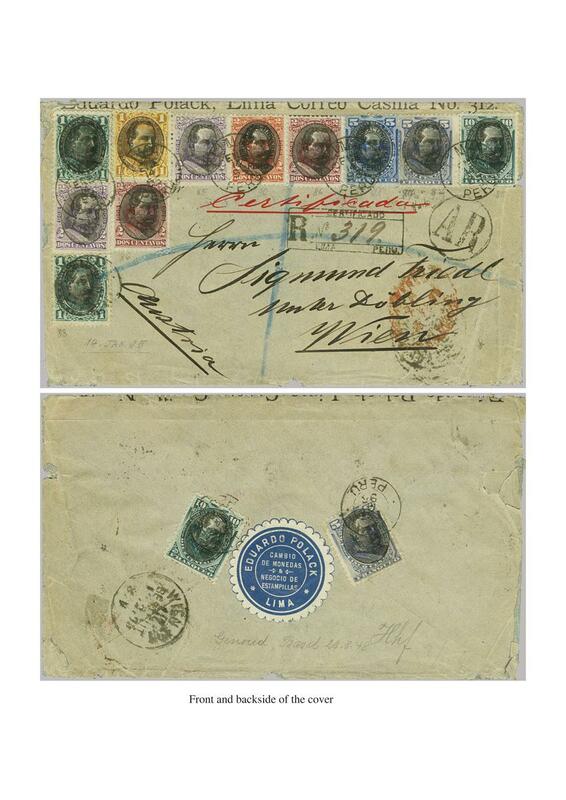 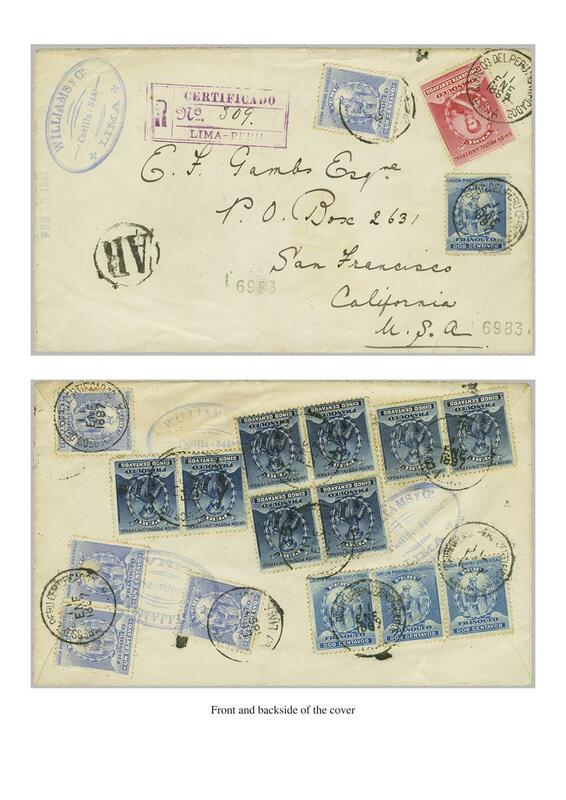 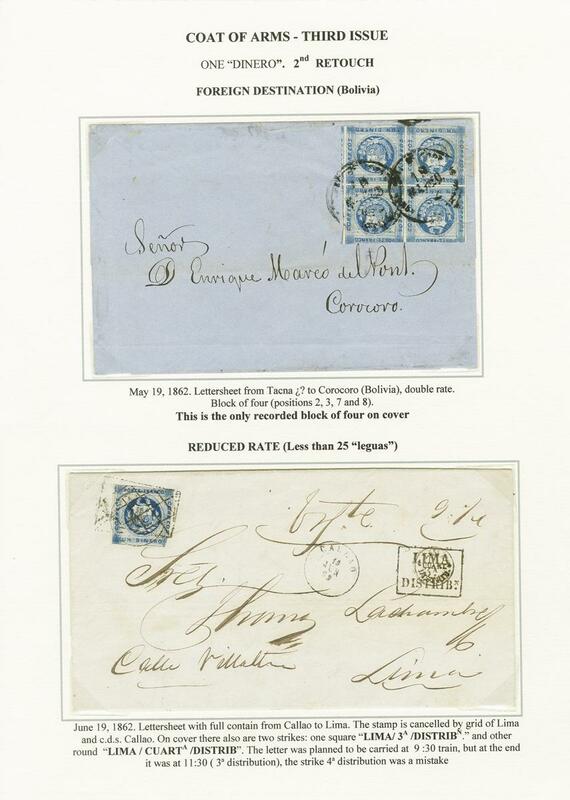 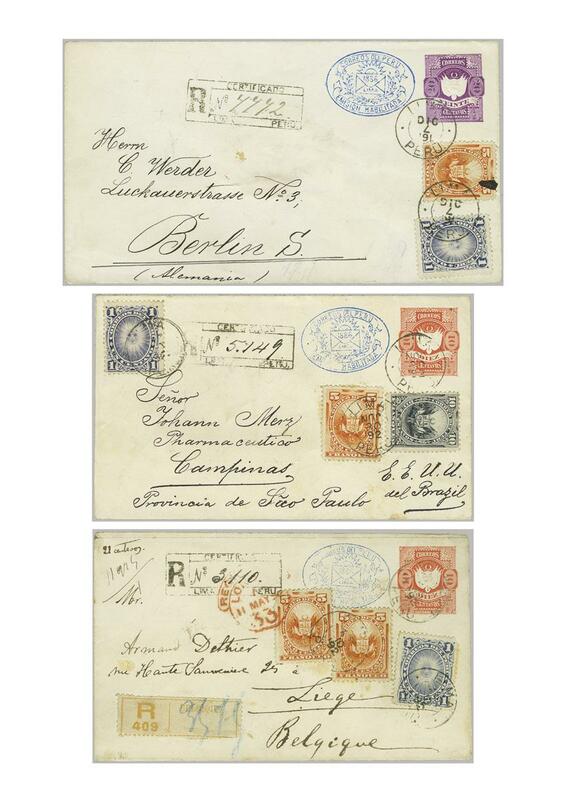 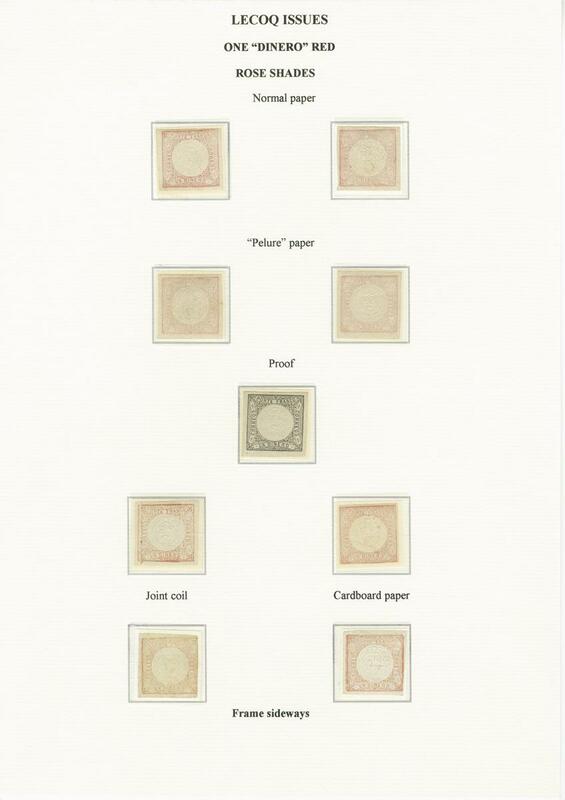 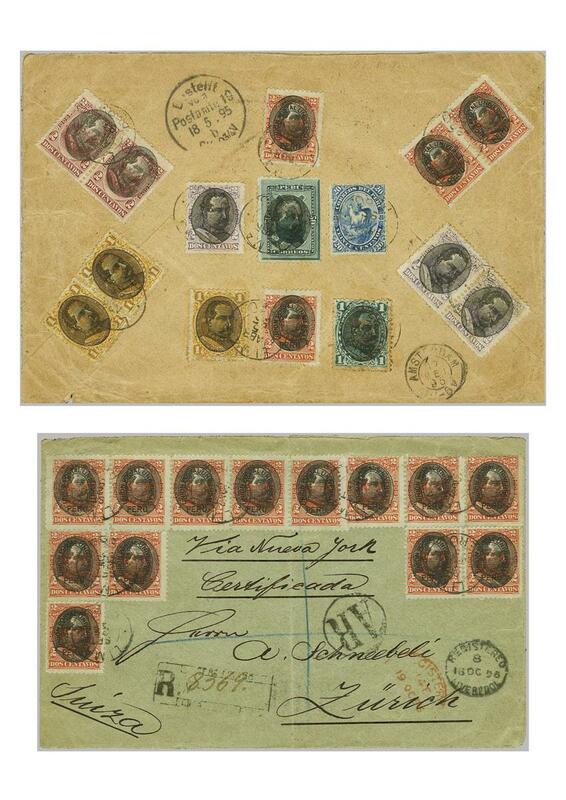 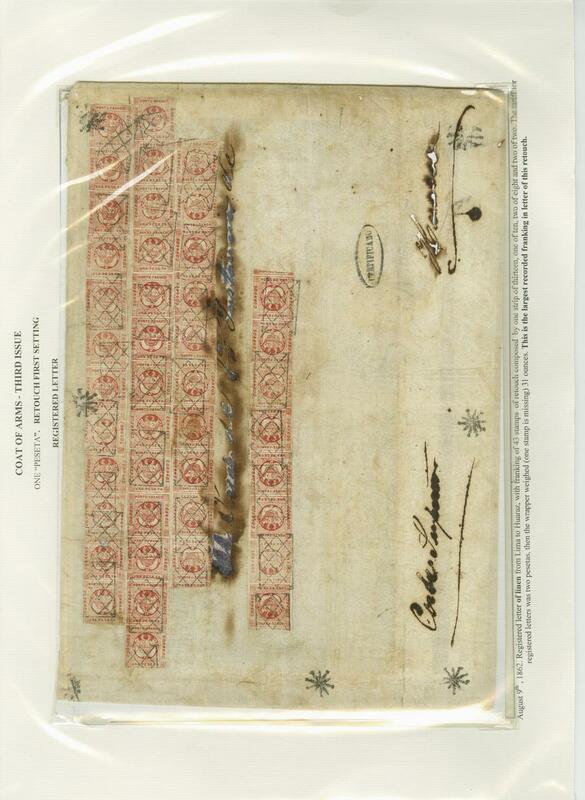 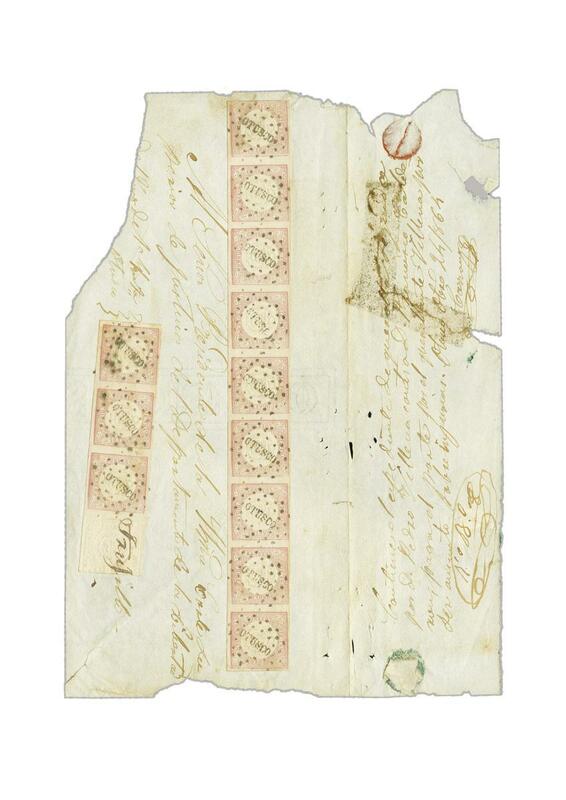 brown with three bisect covers and a registered cover with four examples. 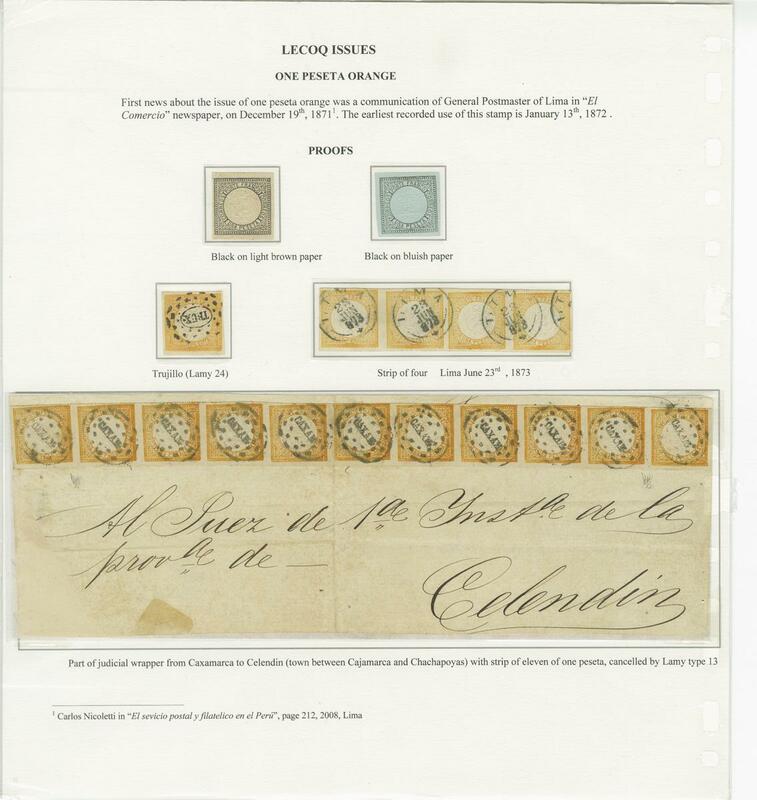 This is followed by the Le Coq 1 dinero green with a used strip of eleven, two covers bearing 9 examples on each, many combination covers with the British Post Offices (including Iquique) or with Italian Postage Dues and a “Triple Country” Peru-GB-USA cover; the Le Coq 1 peseta brown is shown on rare covers (2); the 1870 ‘Trencito’ Railway stamp with a mint strip of five and five usages on cover including one with the British P.O. 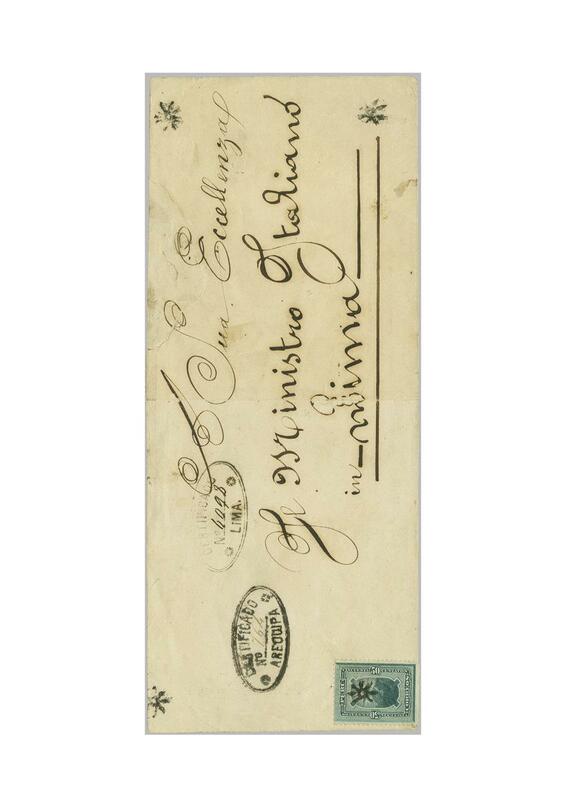 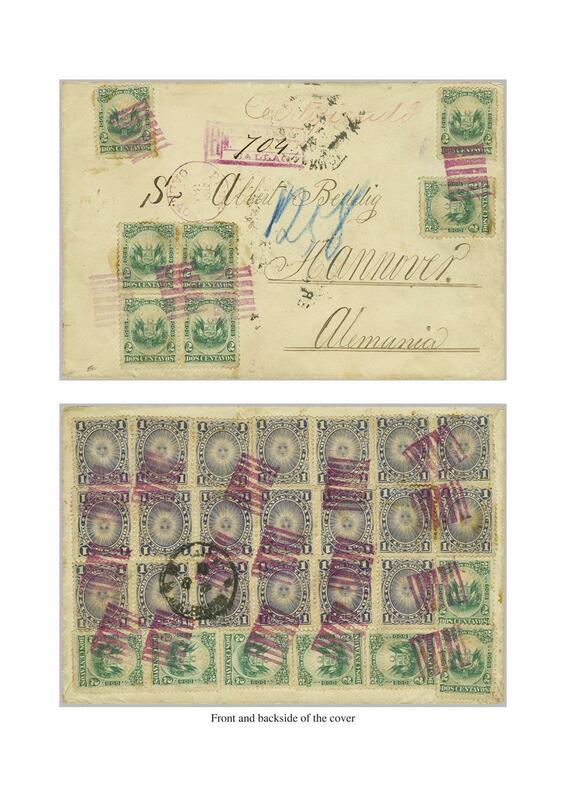 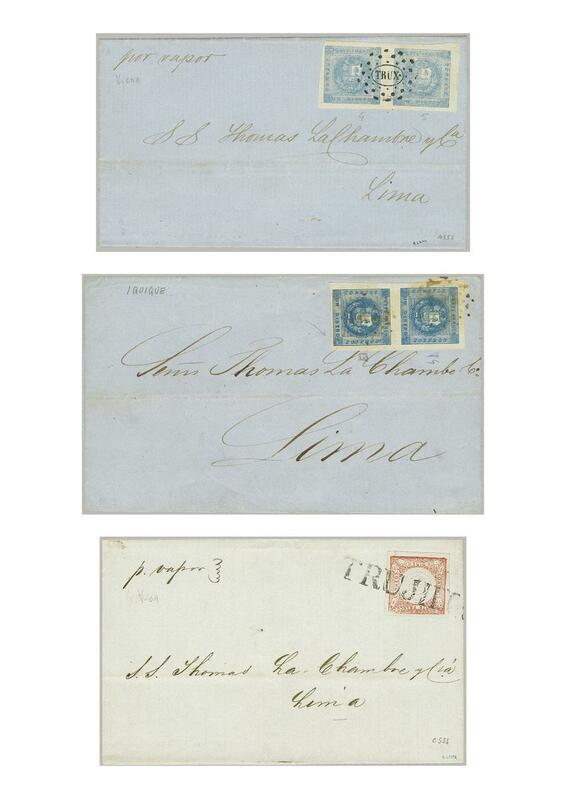 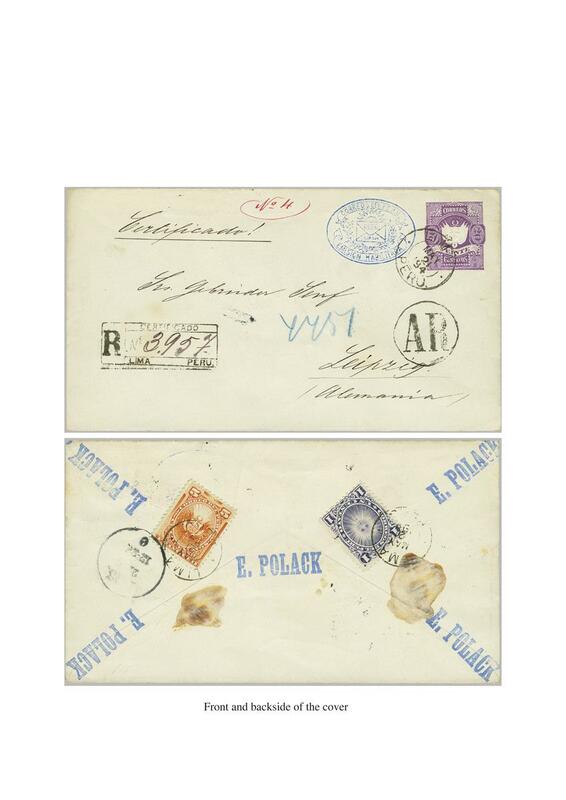 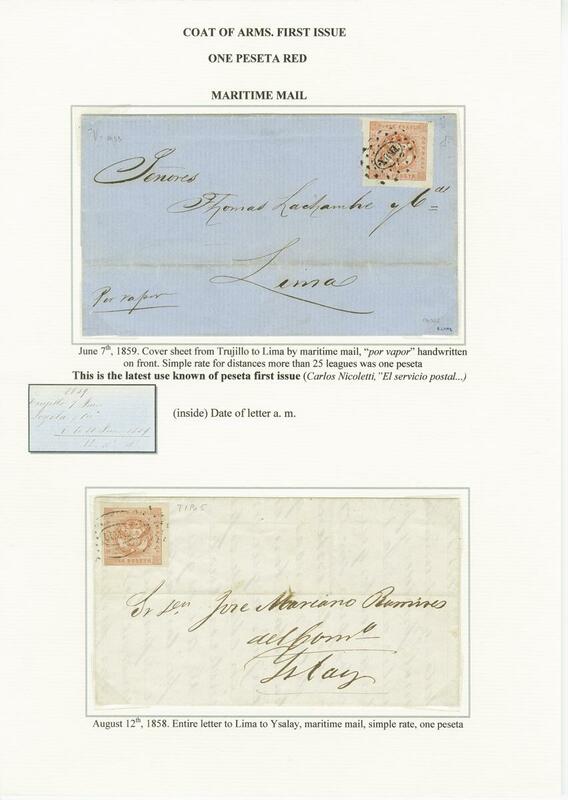 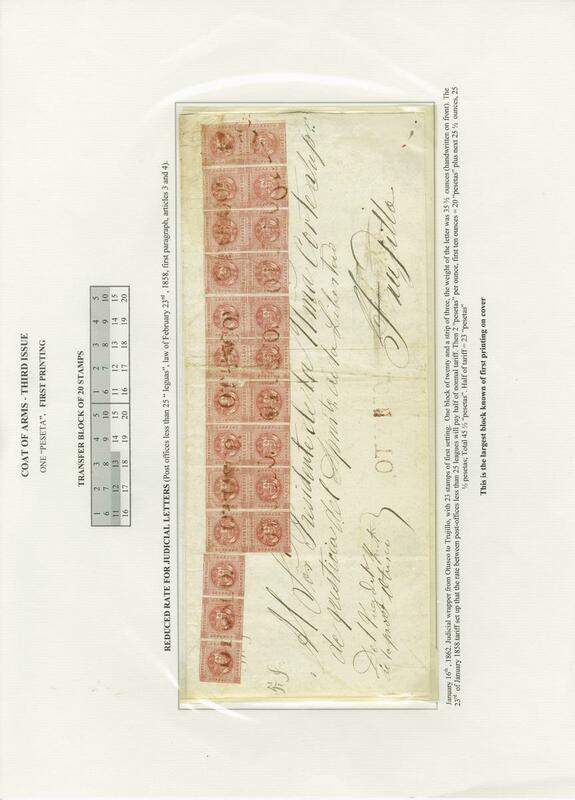 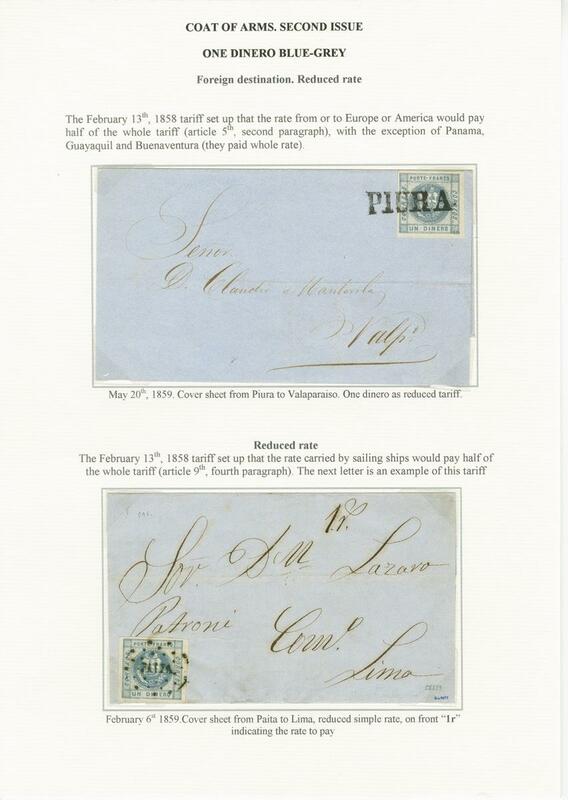 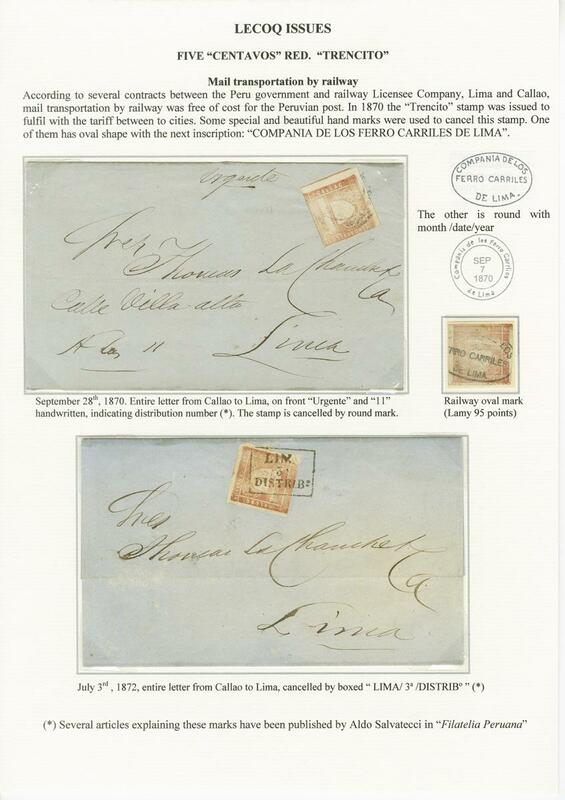 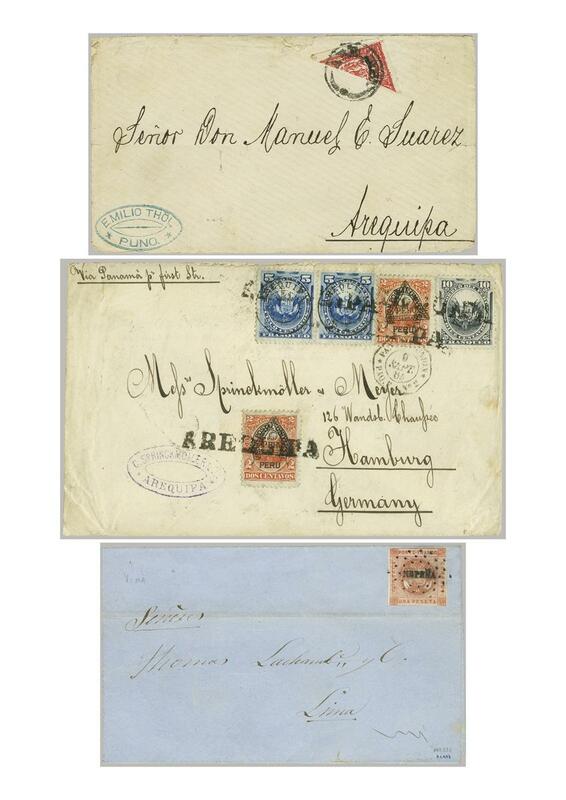 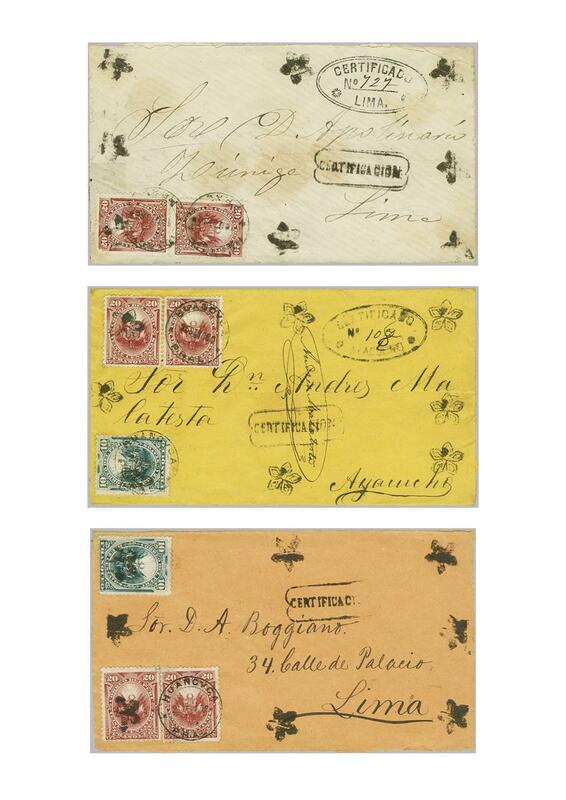 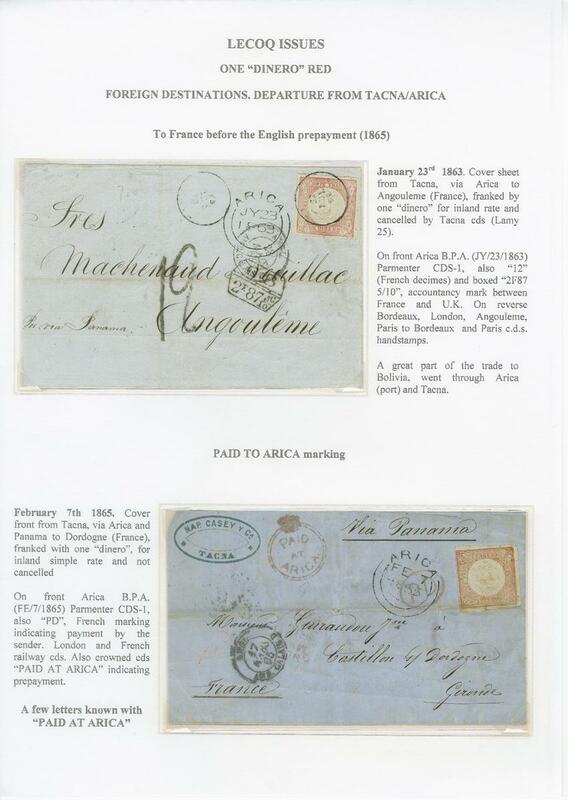 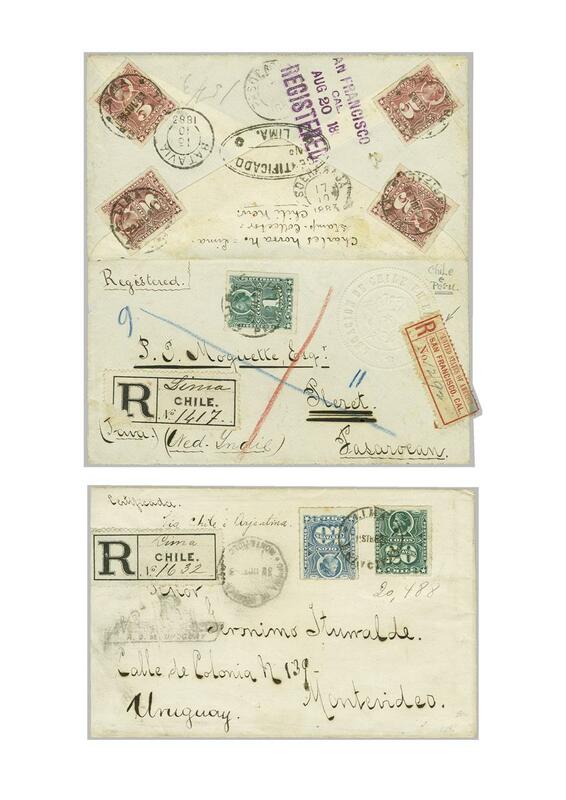 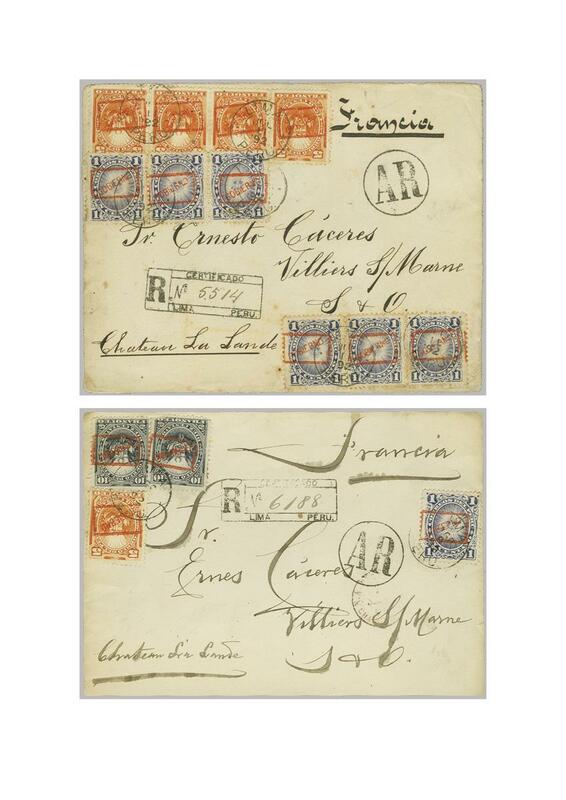 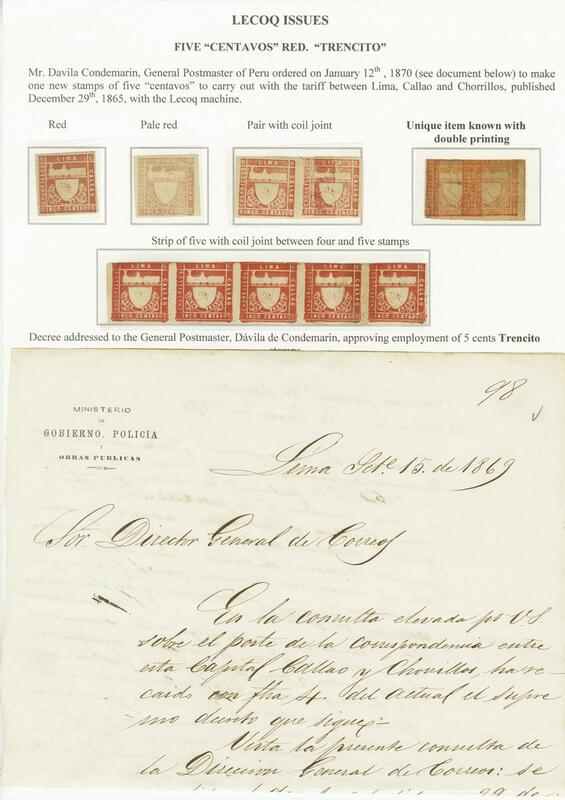 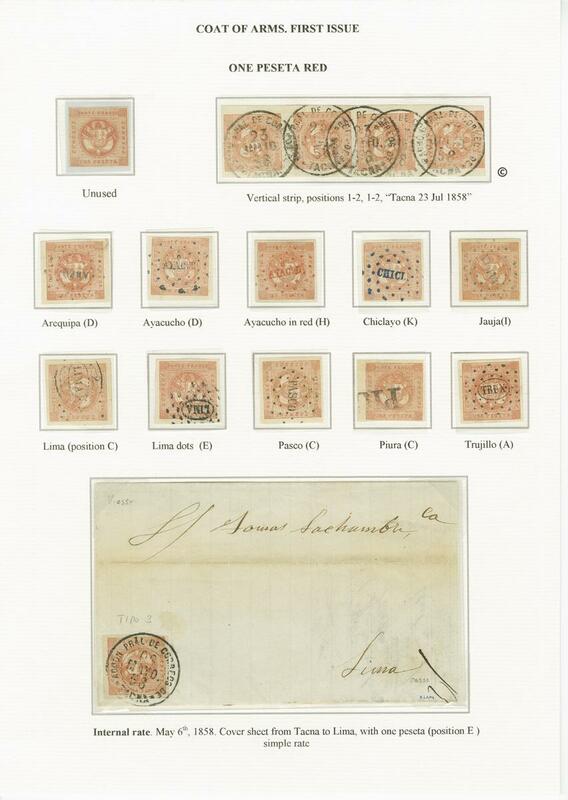 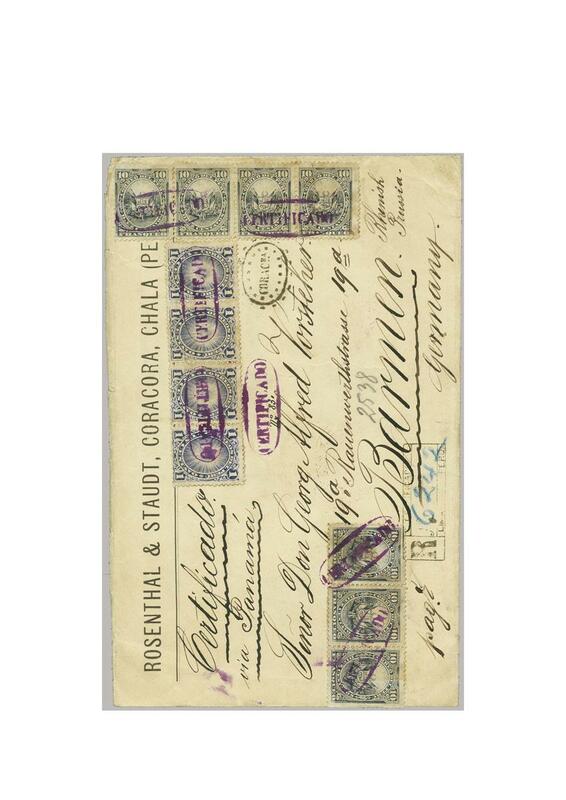 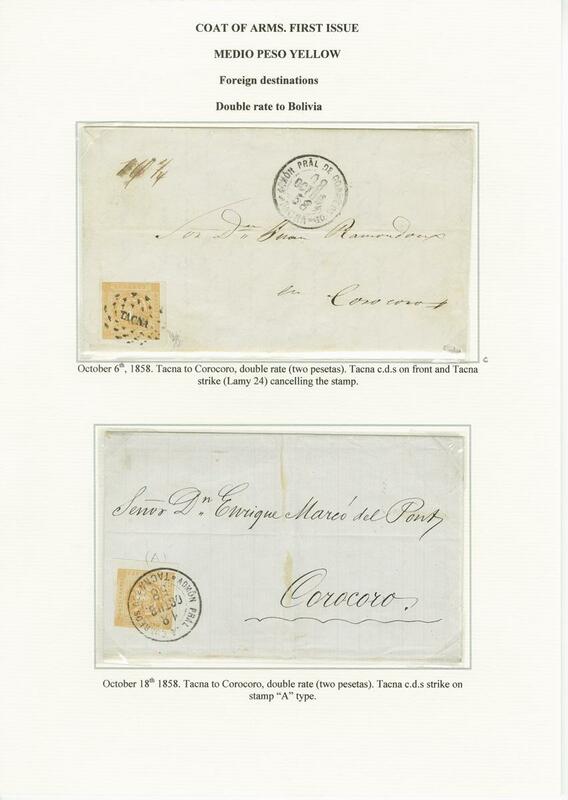 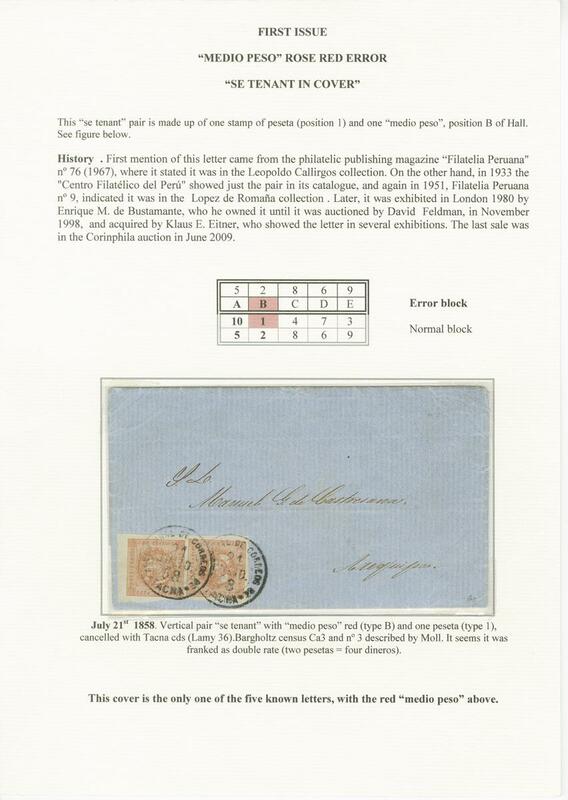 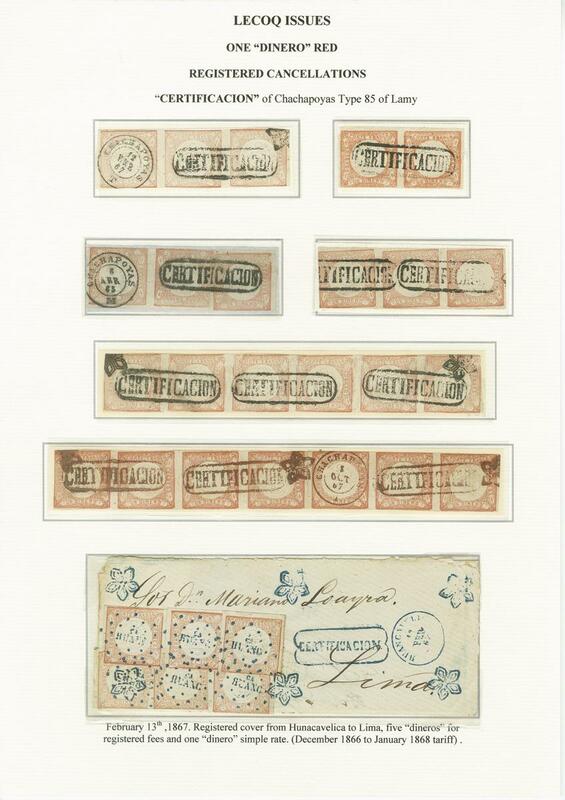 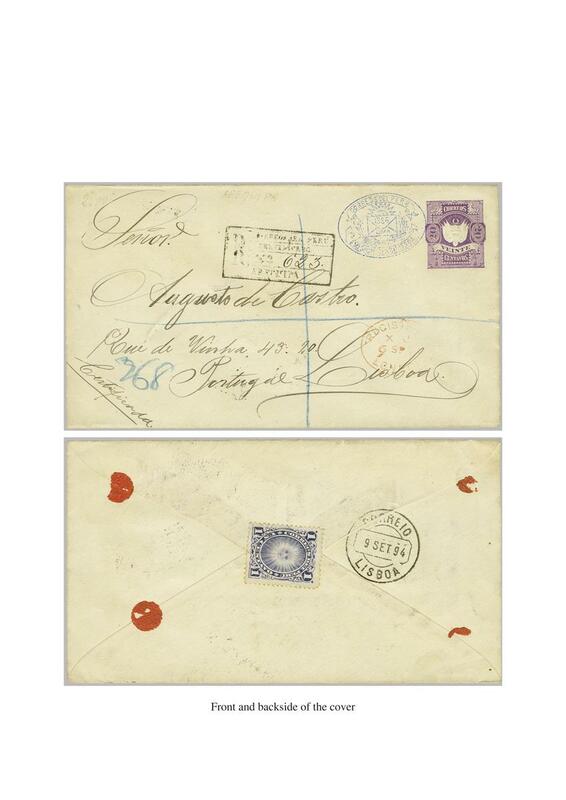 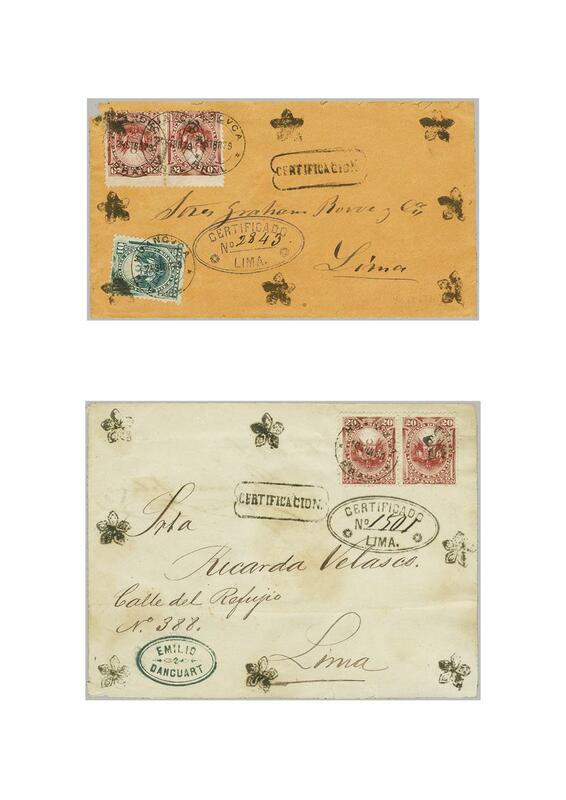 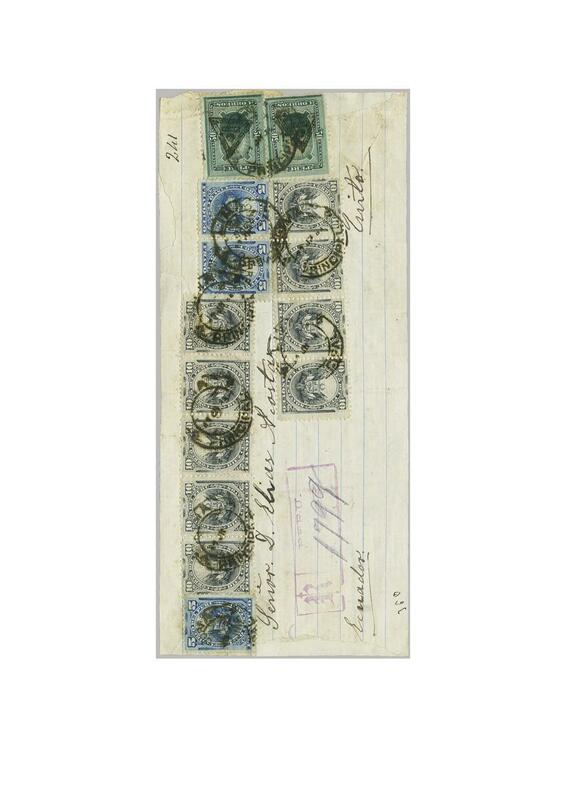 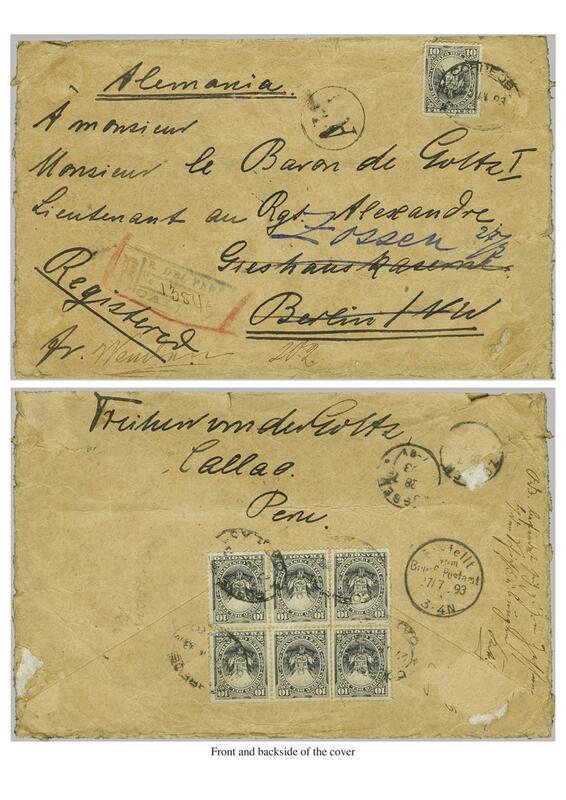 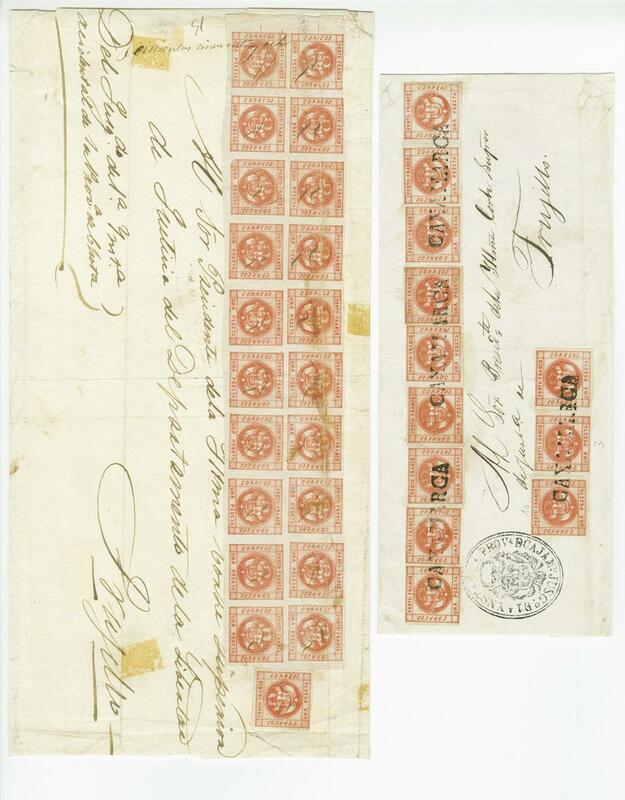 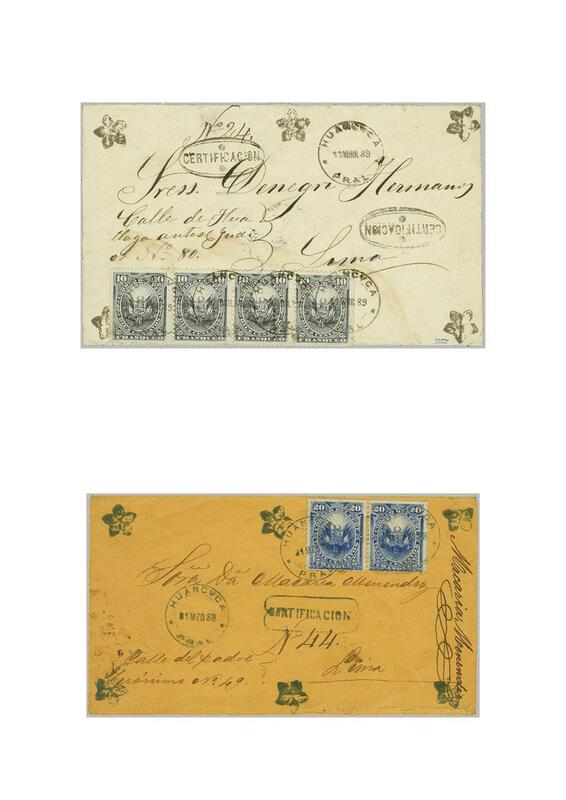 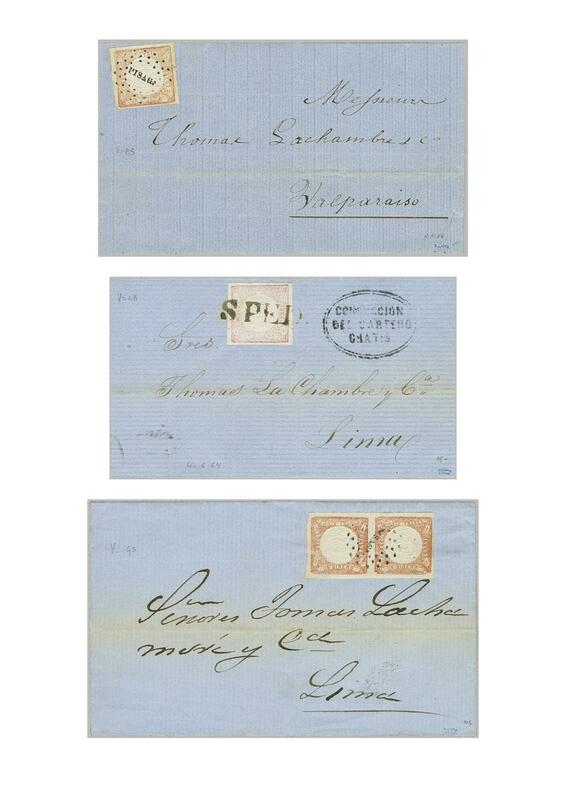 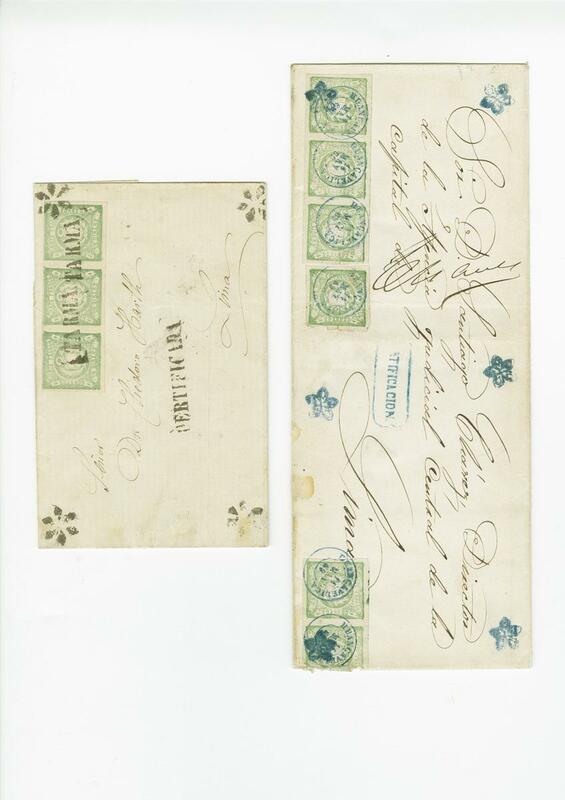 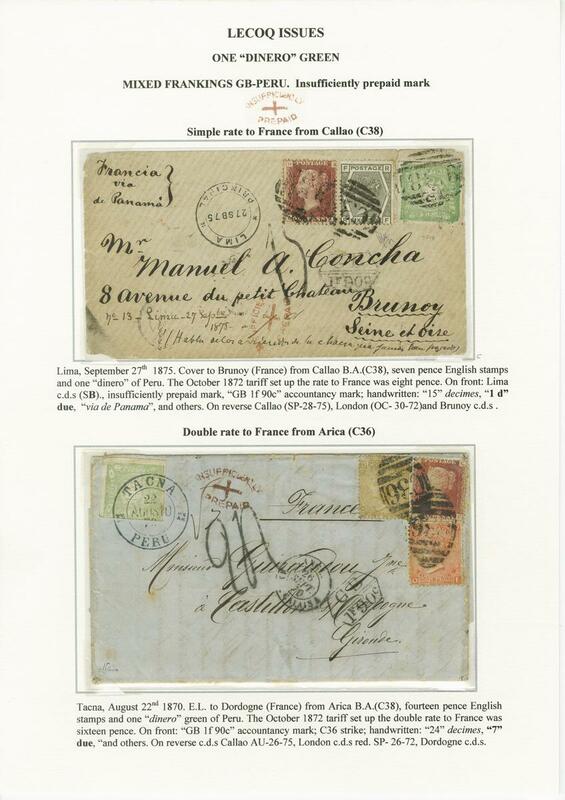 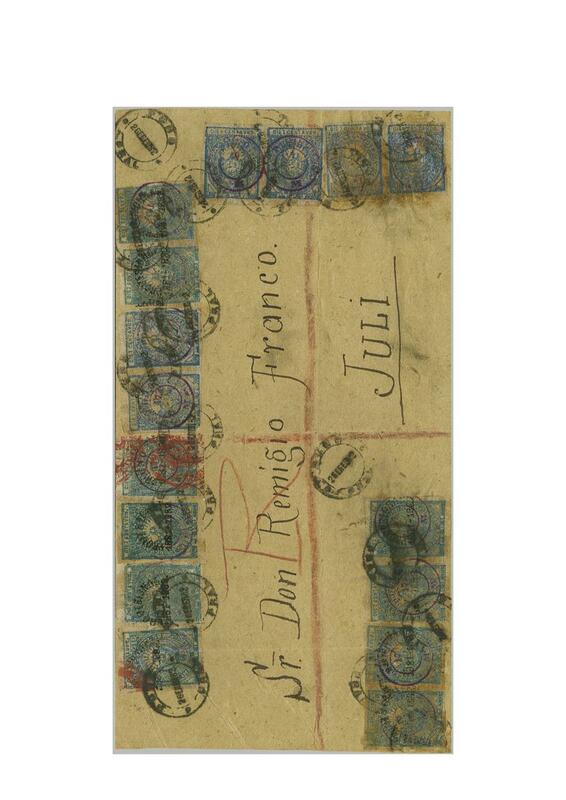 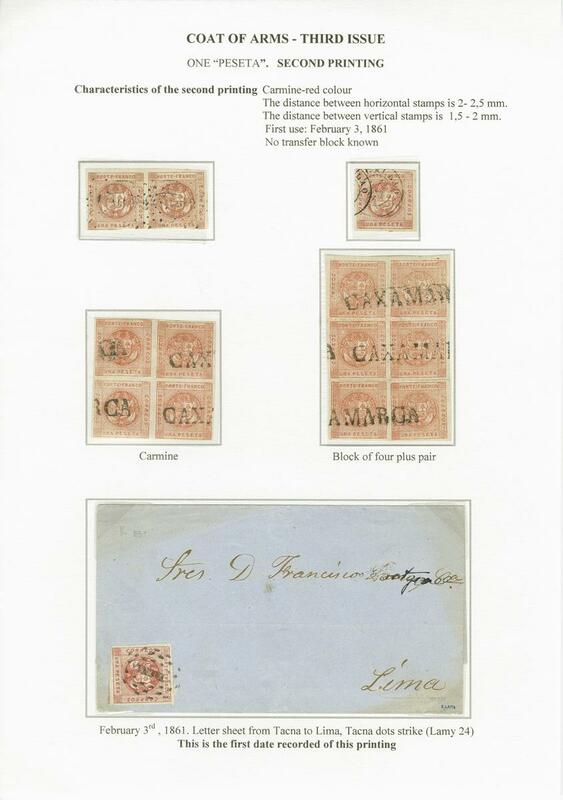 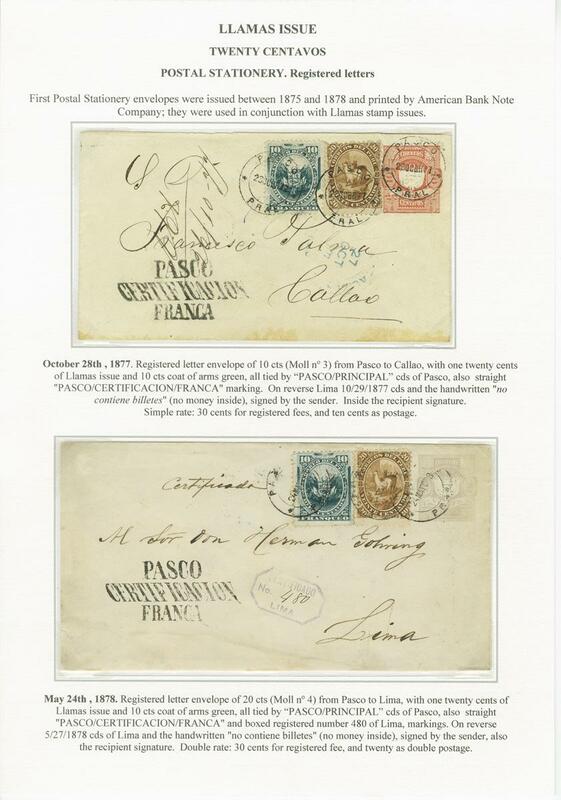 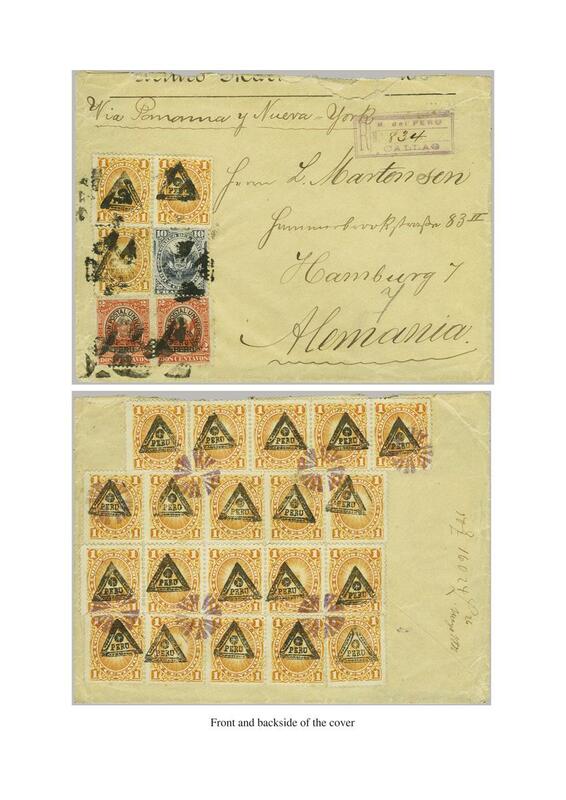 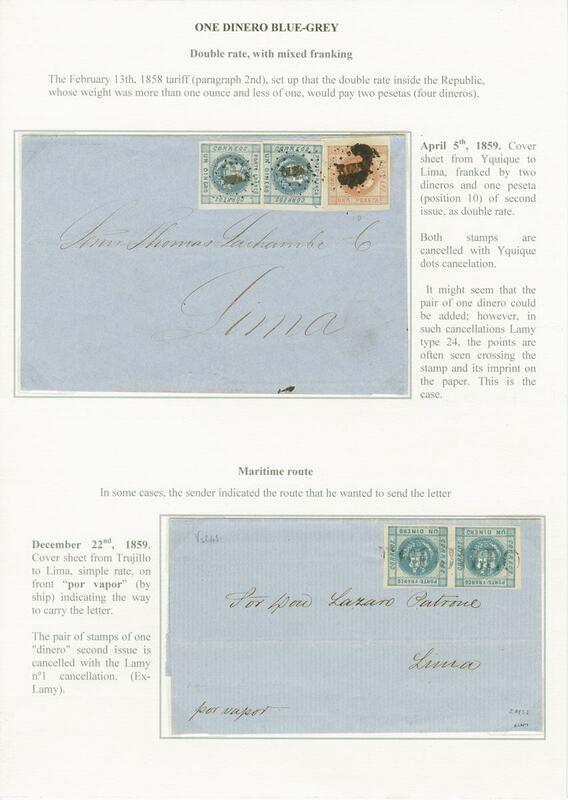 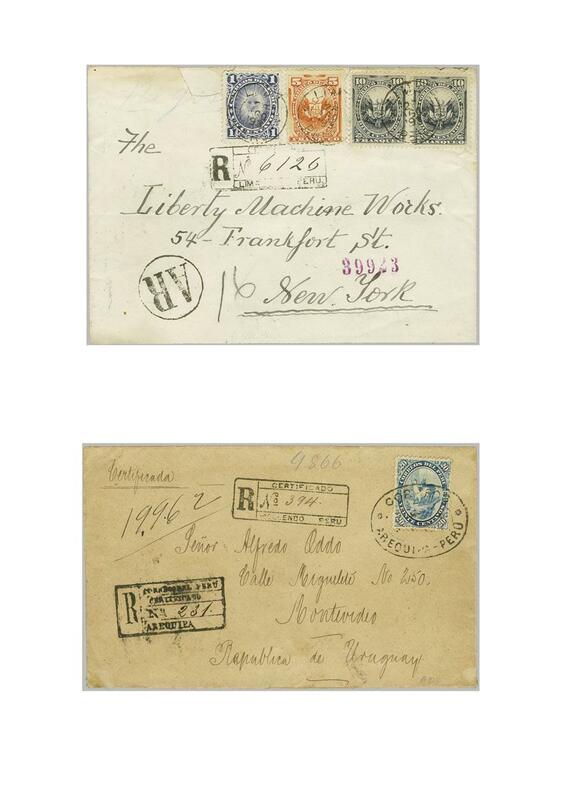 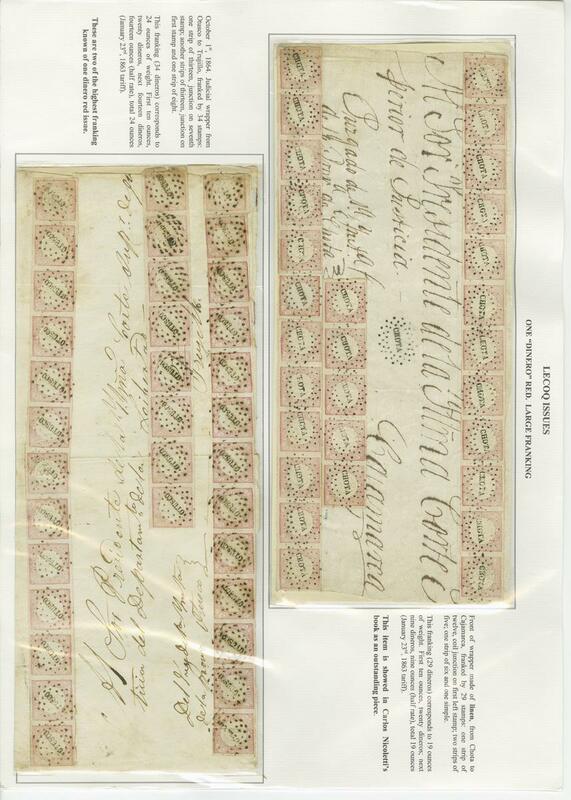 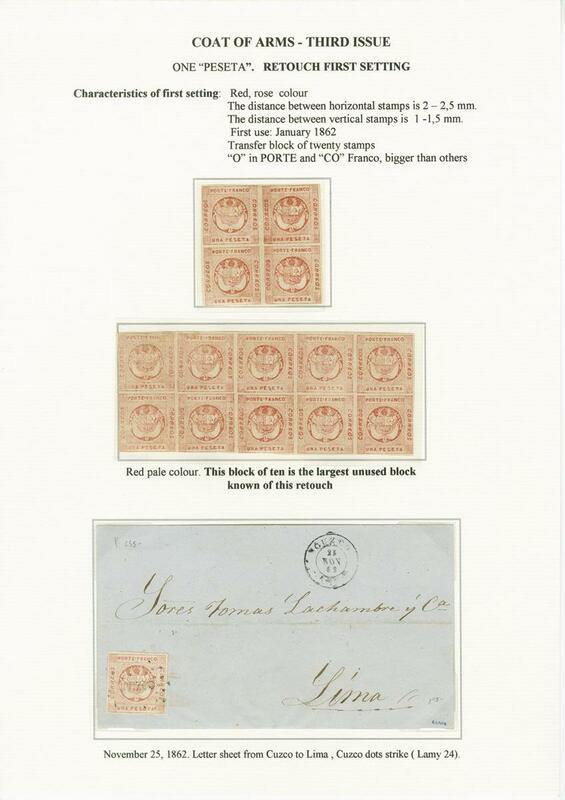 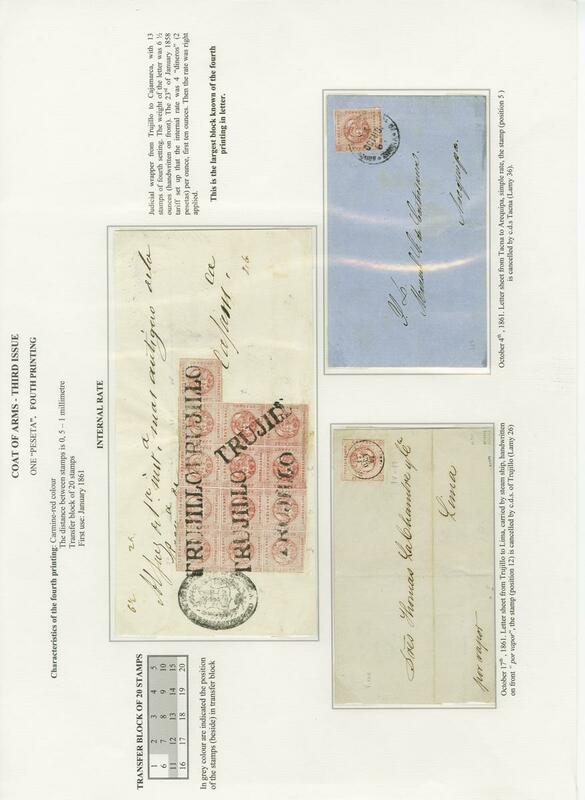 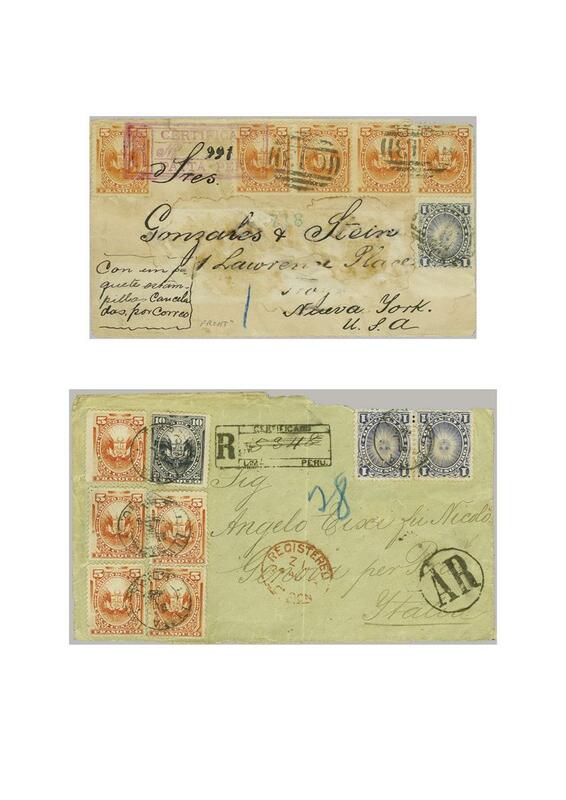 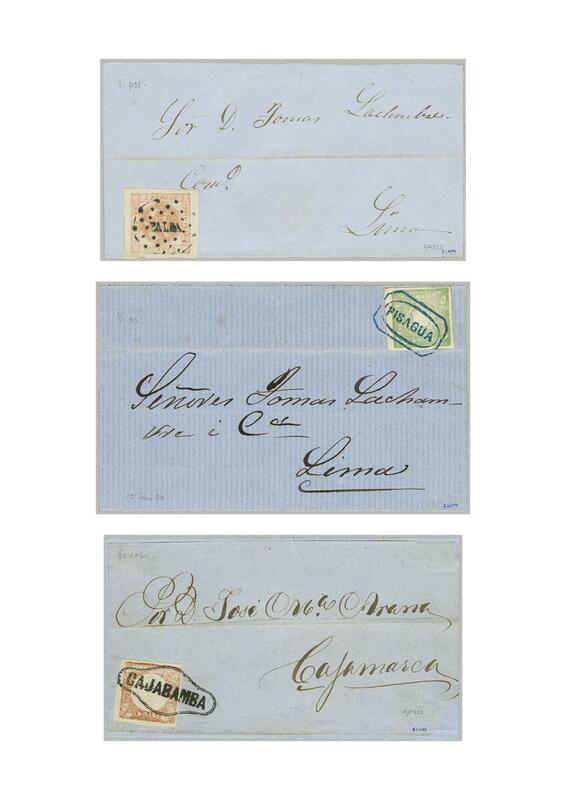 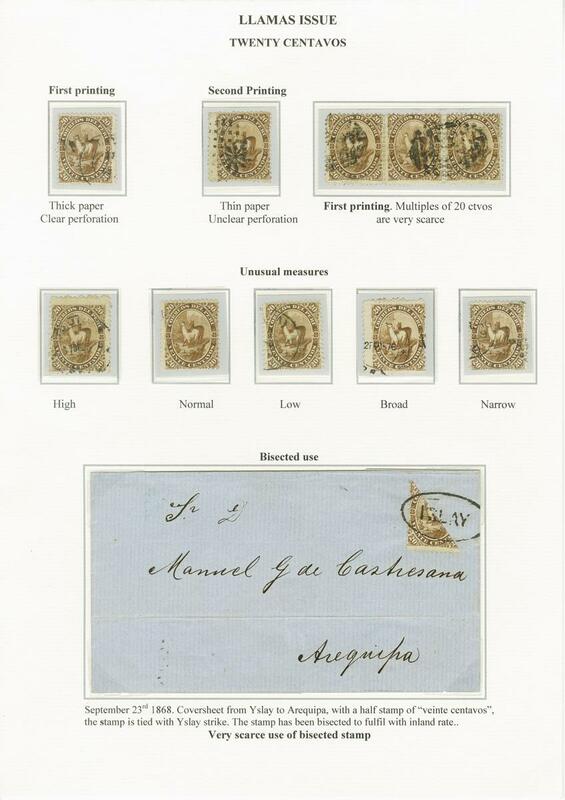 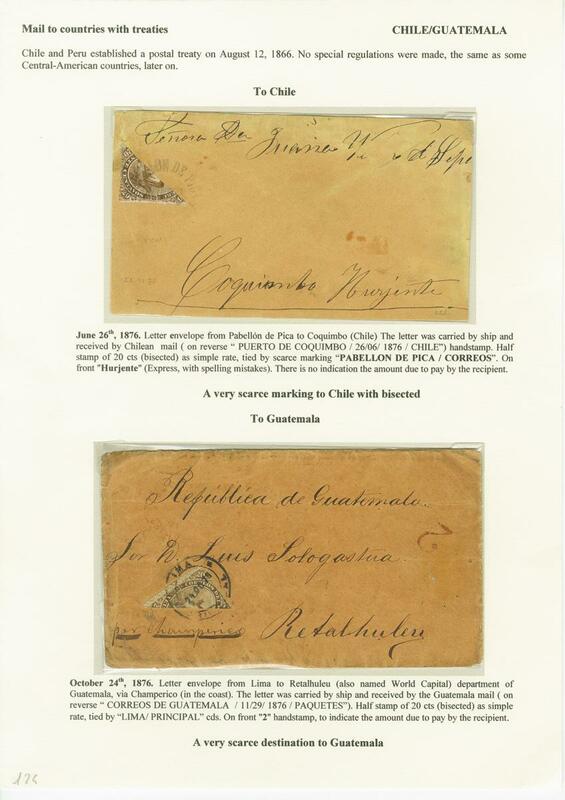 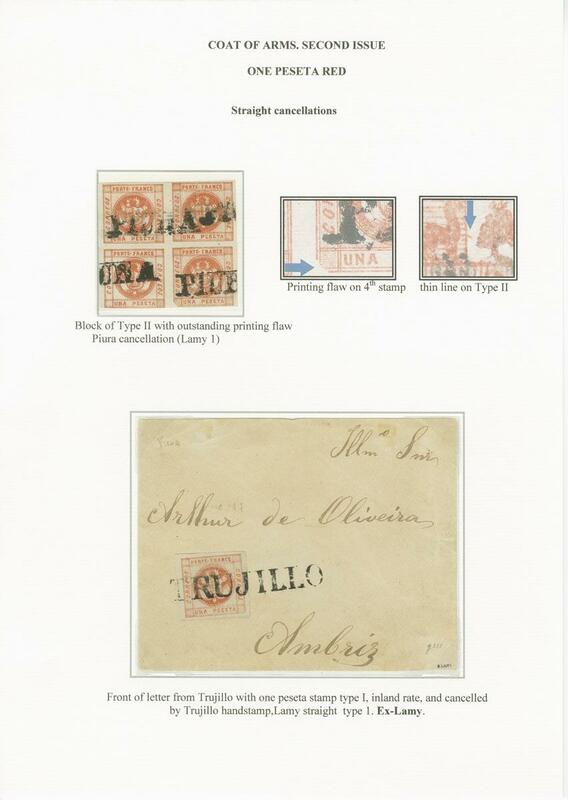 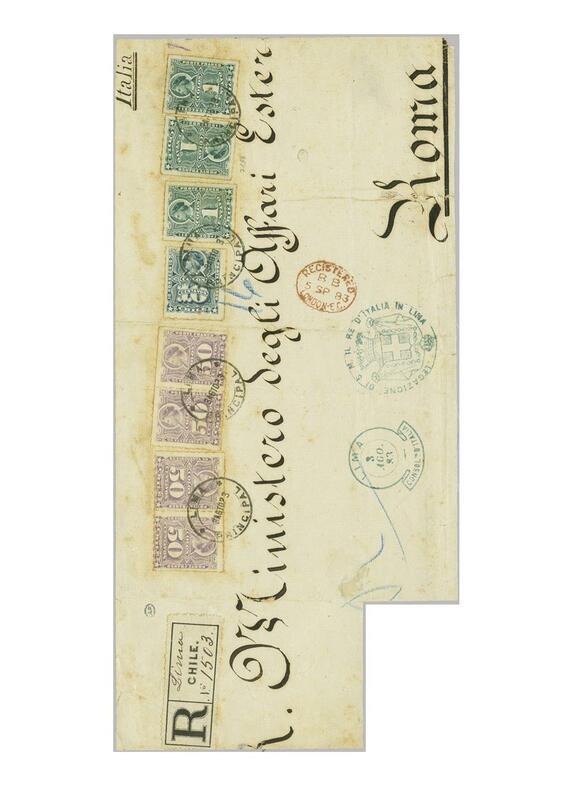 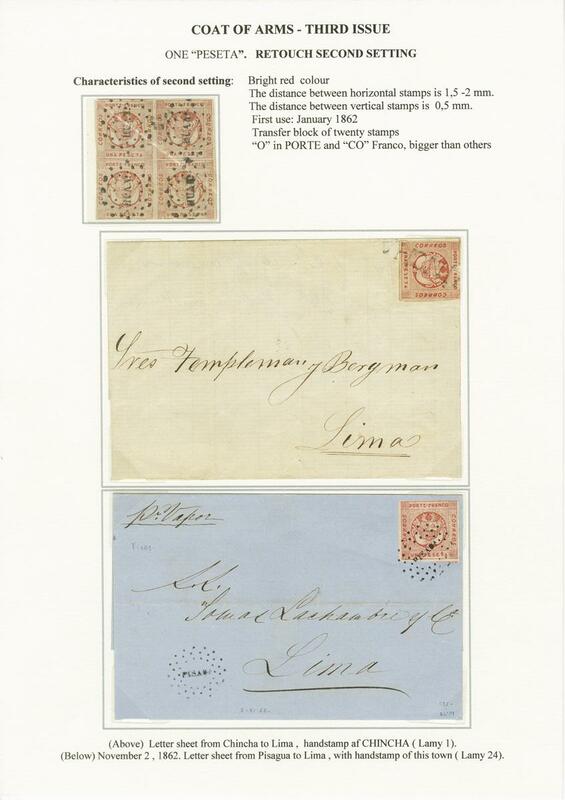 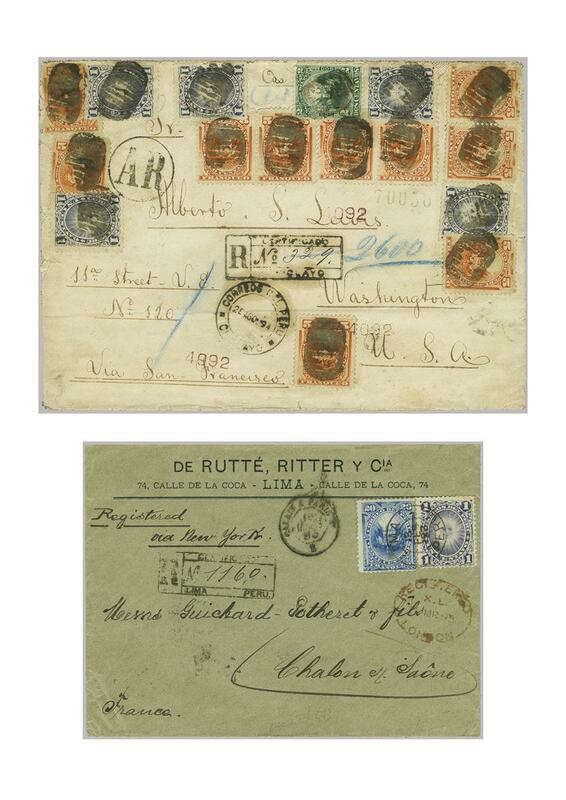 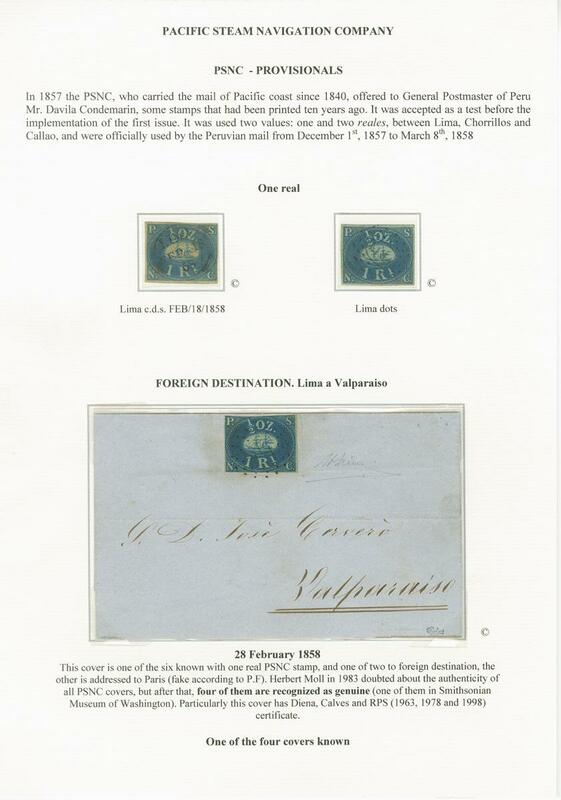 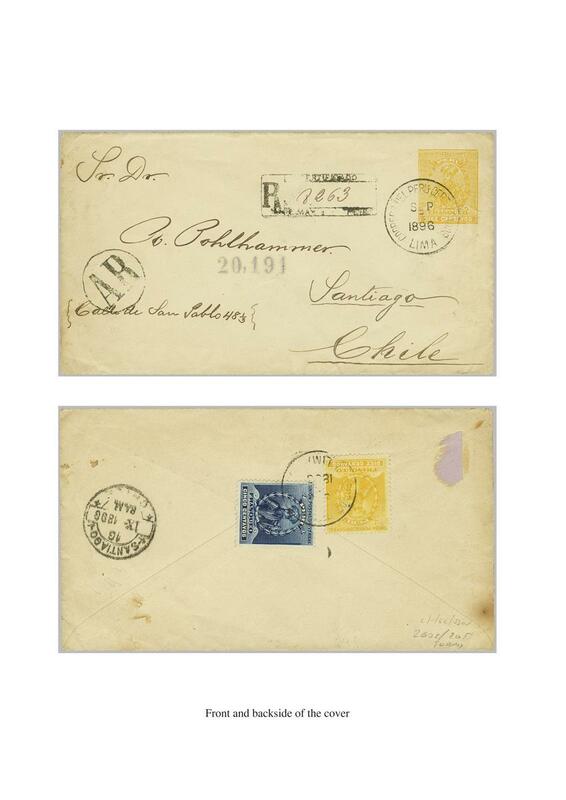 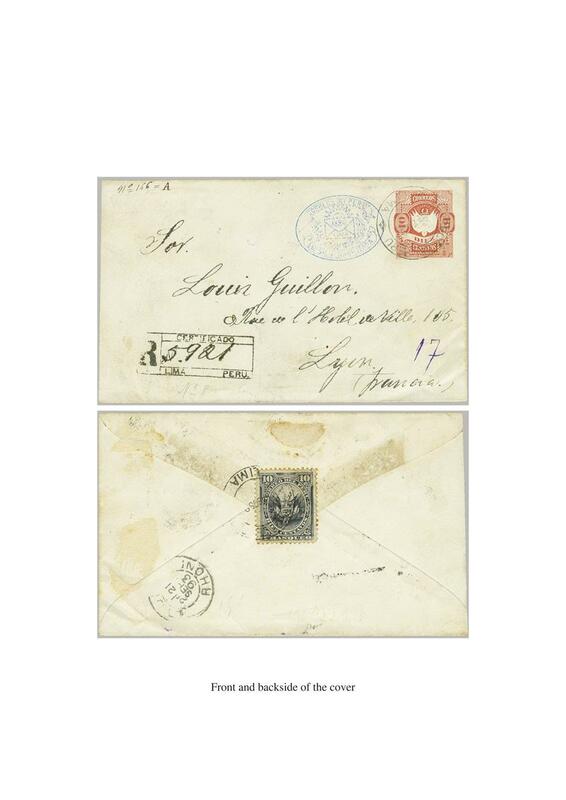 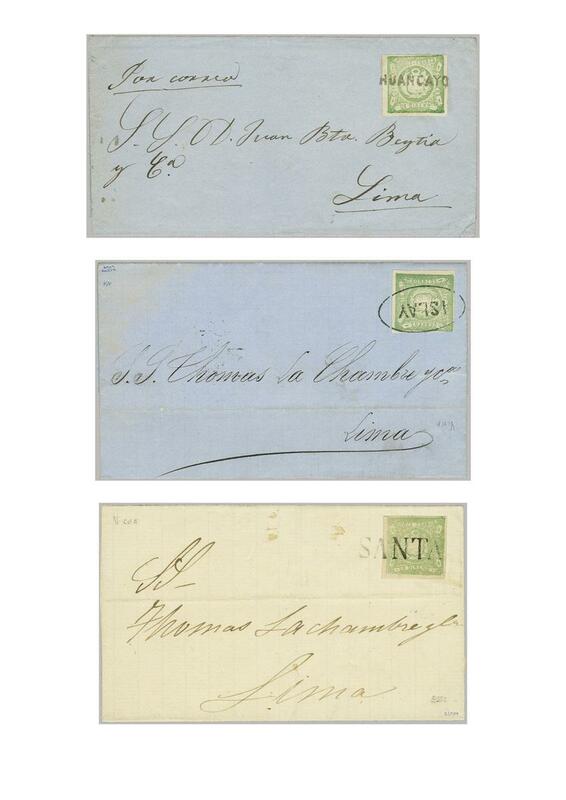 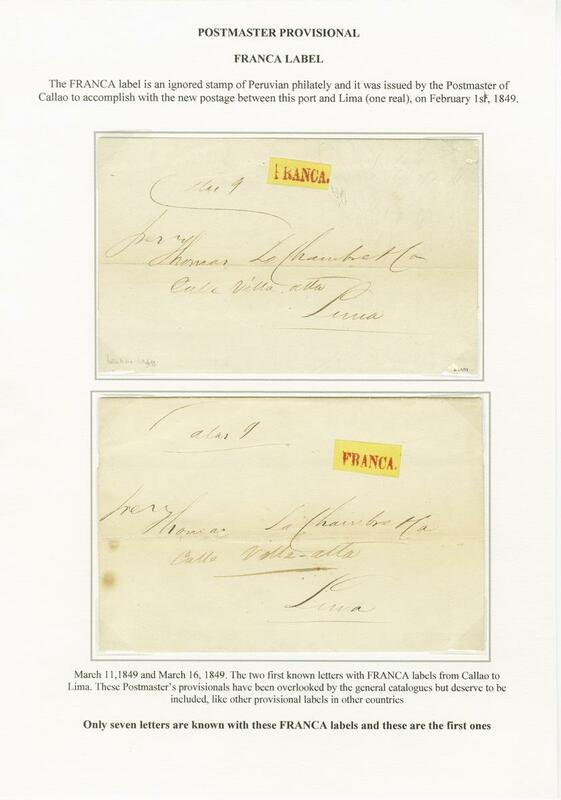 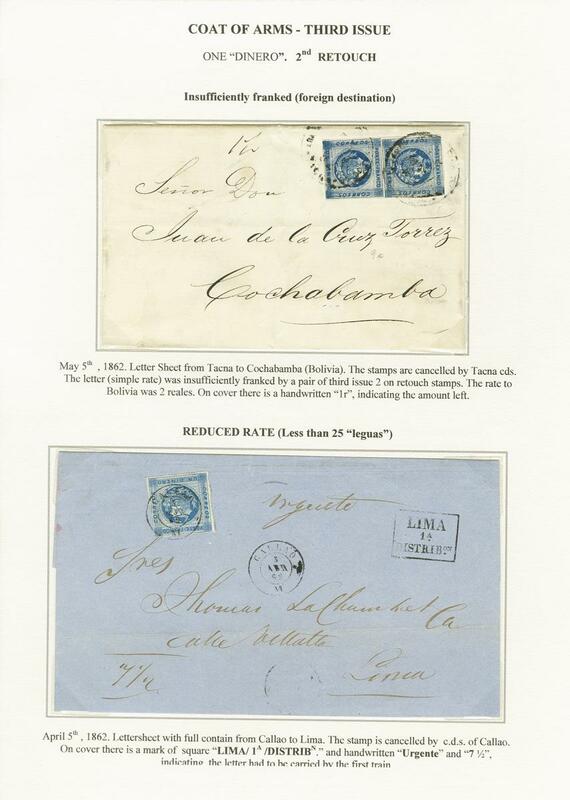 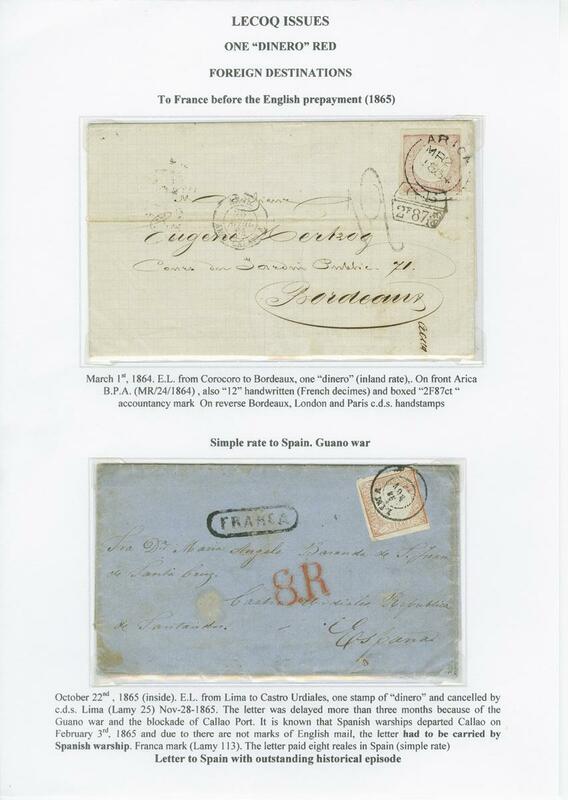 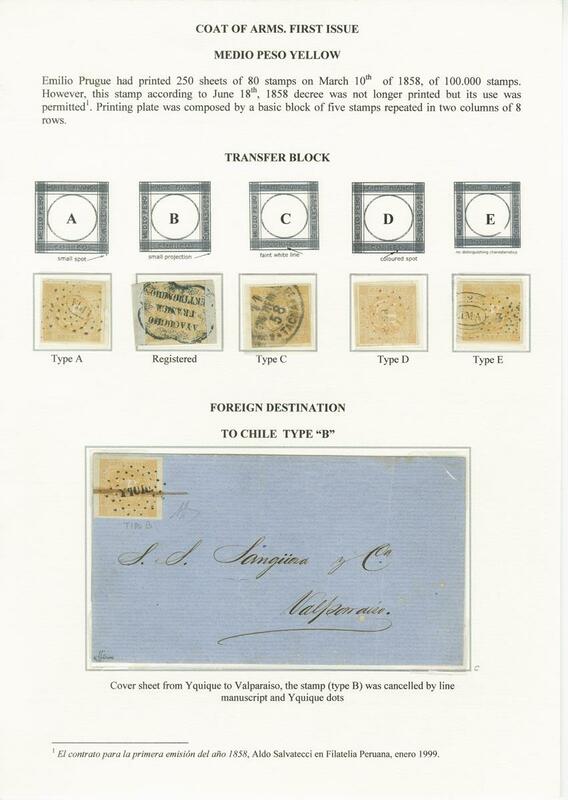 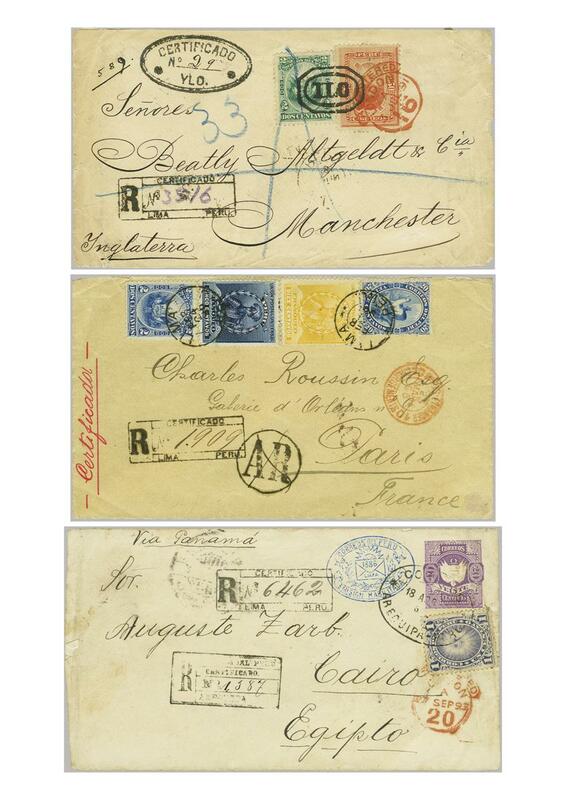 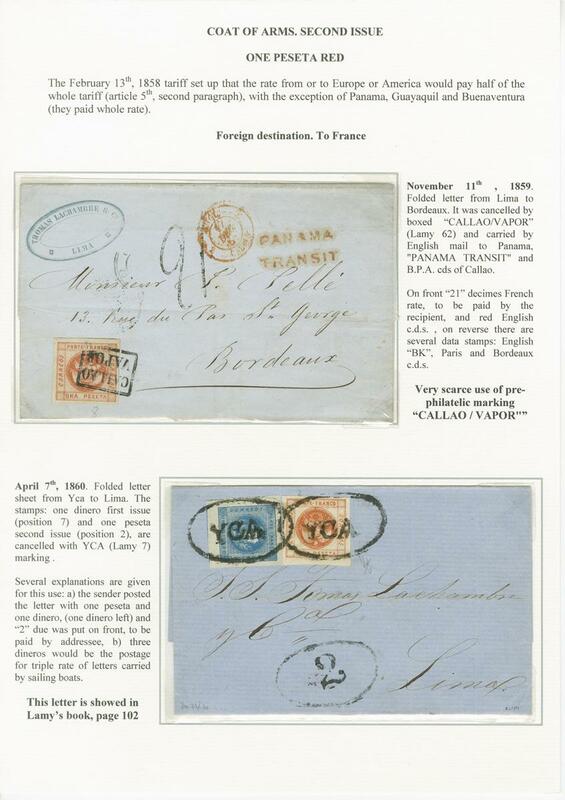 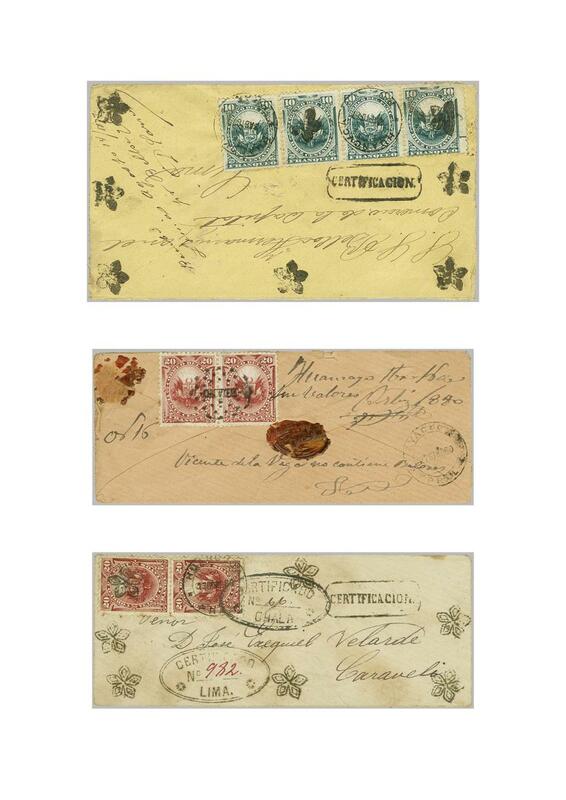 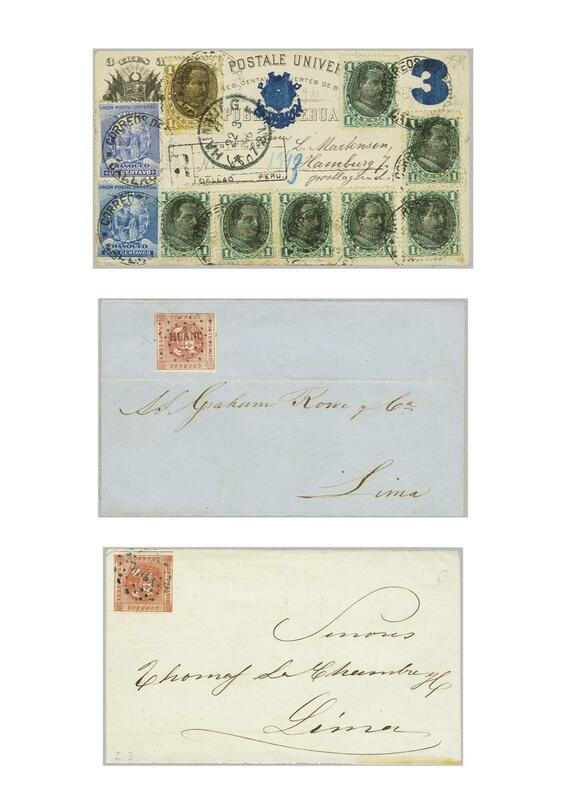 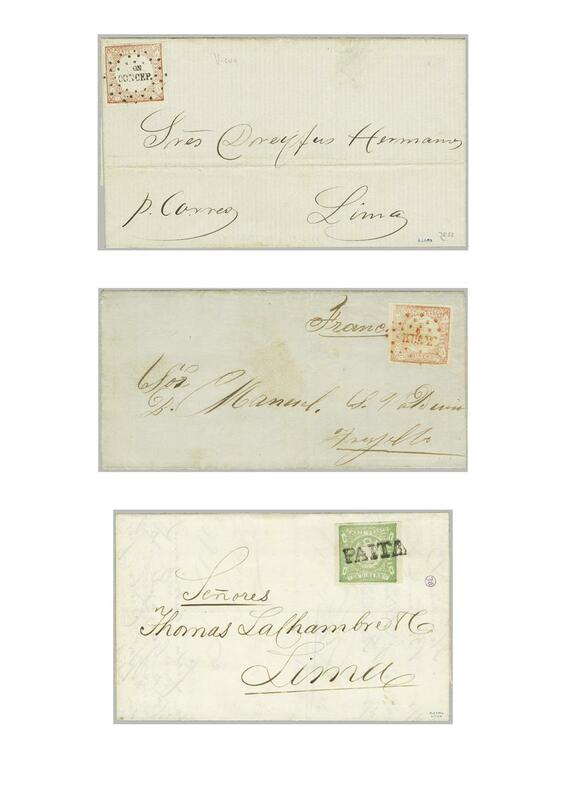 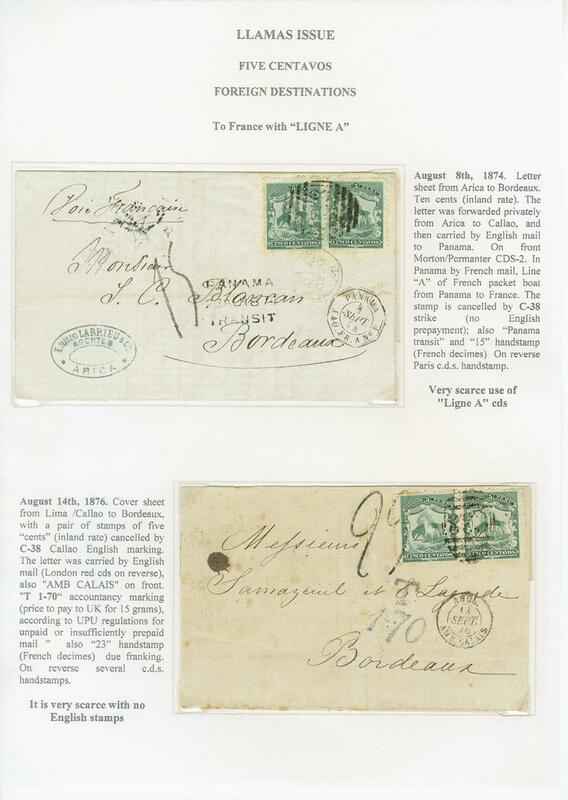 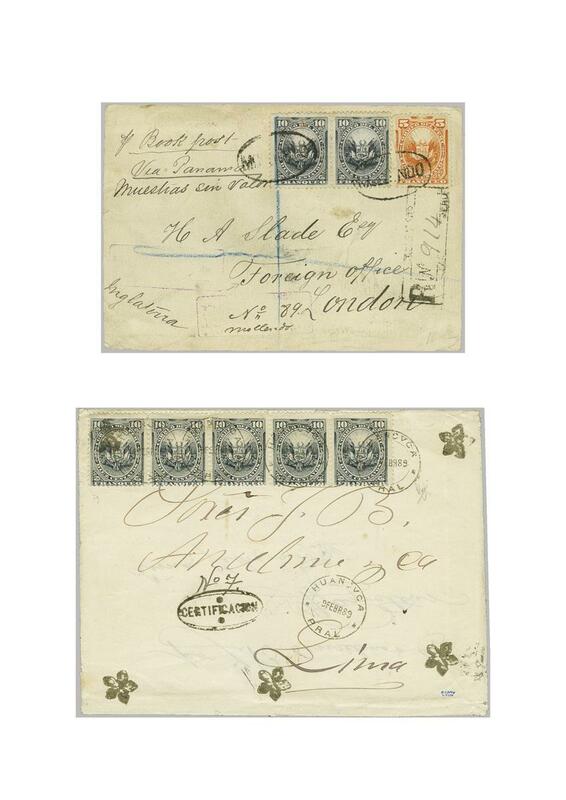 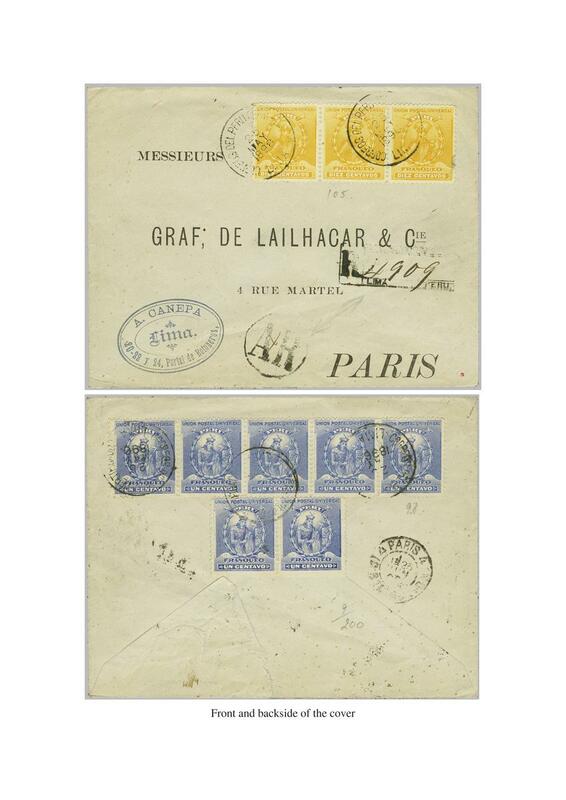 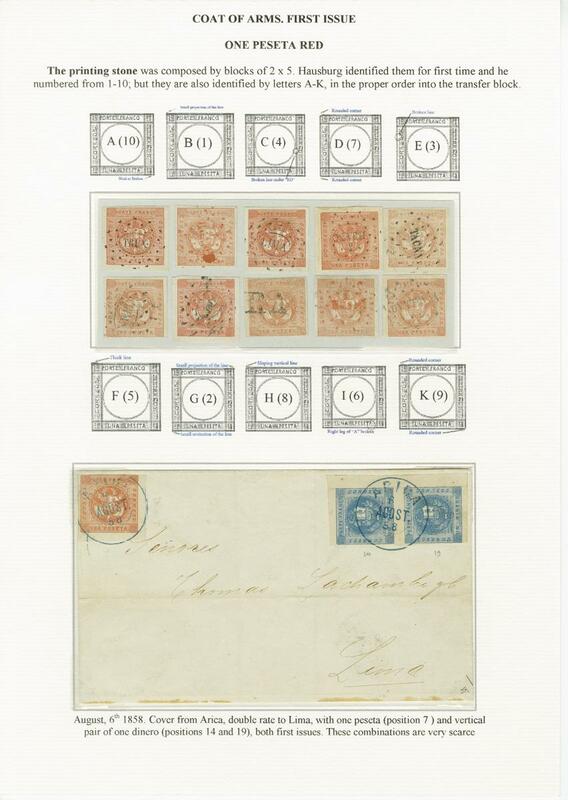 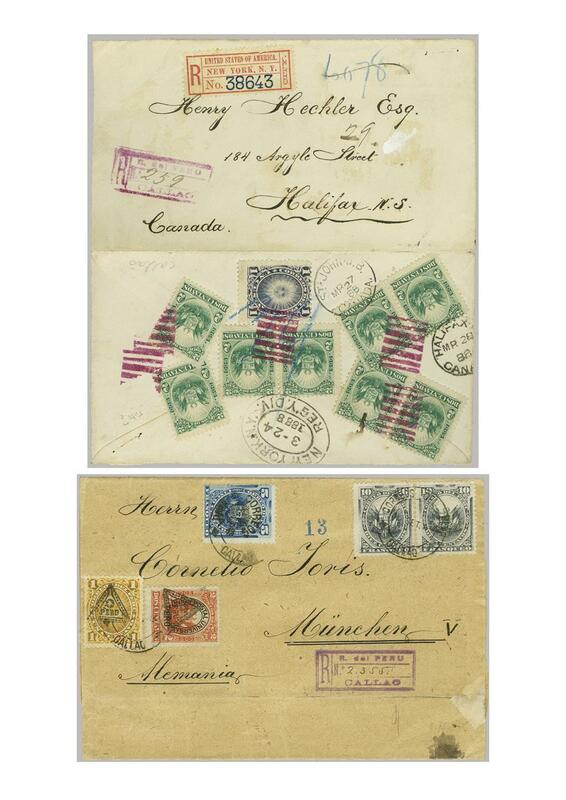 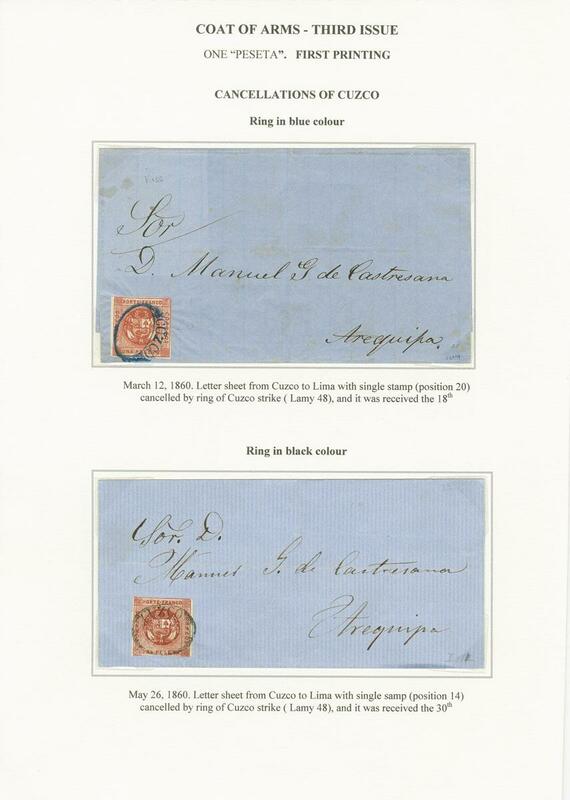 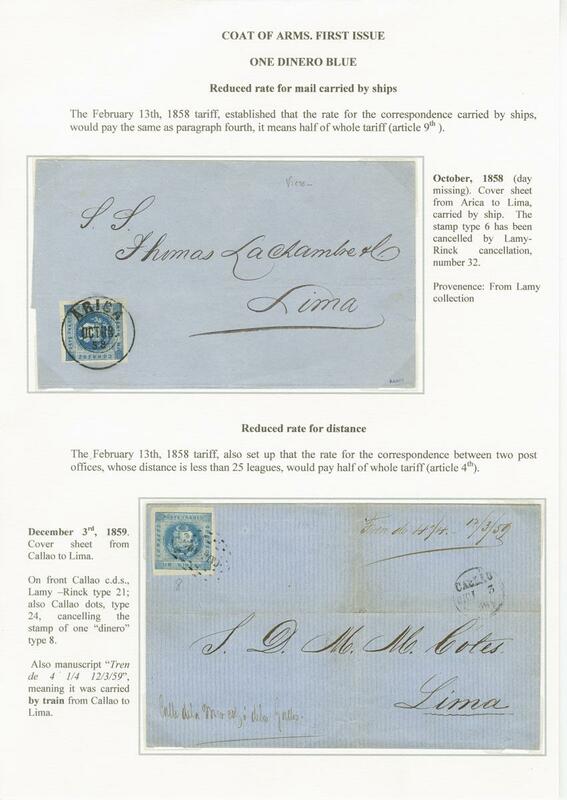 ; the 1871 1 peseta yellow with eleven examples on a cover, a single usage on letter to France, the ‘Llamita’ 2c. 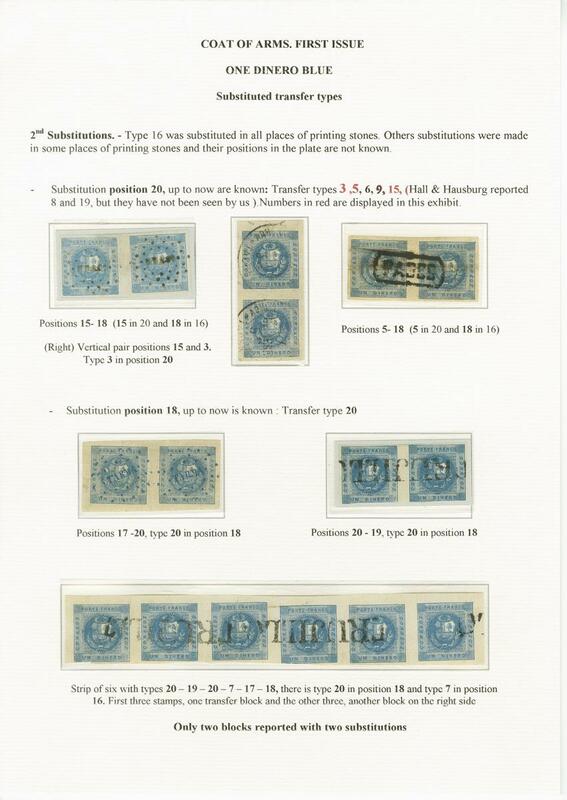 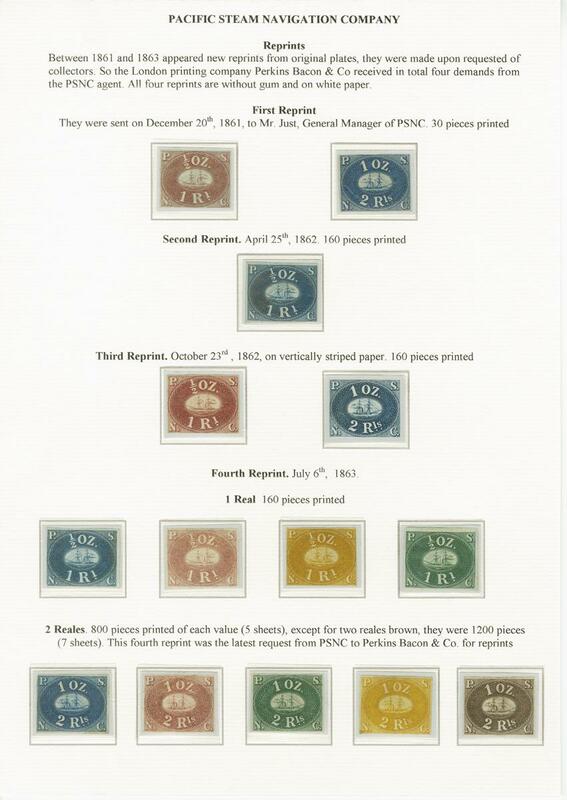 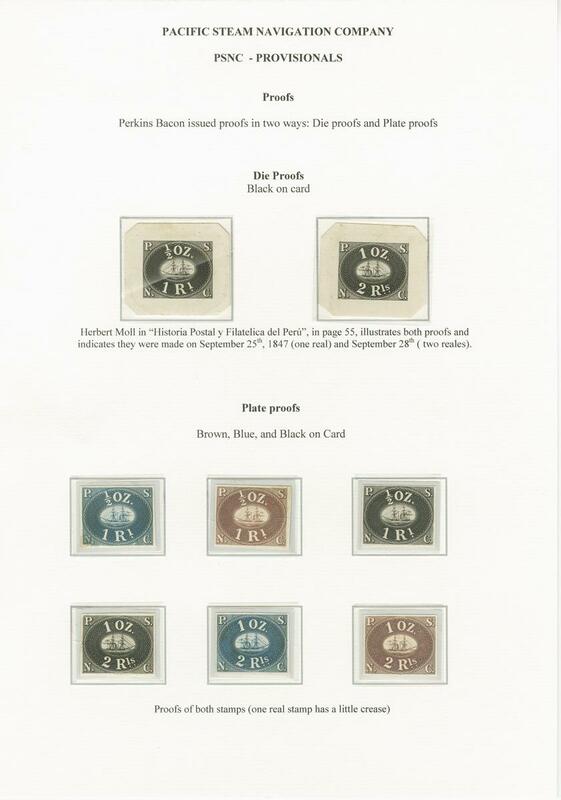 blue with 42 unused examples in multiples (an extraordinary page), and further pages with material yet to be written up, including Llama registered frankings, Chile - Peru ‘Nitrate’ War covers, with all items, as befits this remarkable collection being in the finest quality possible. 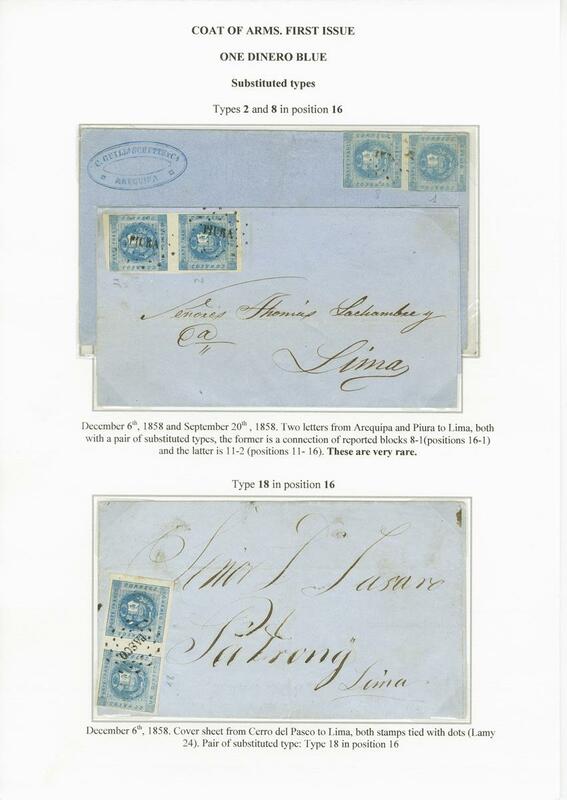 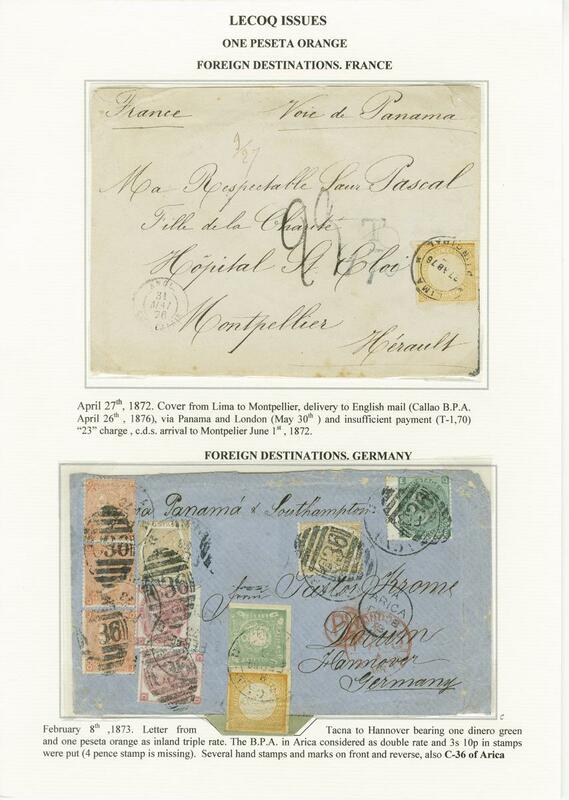 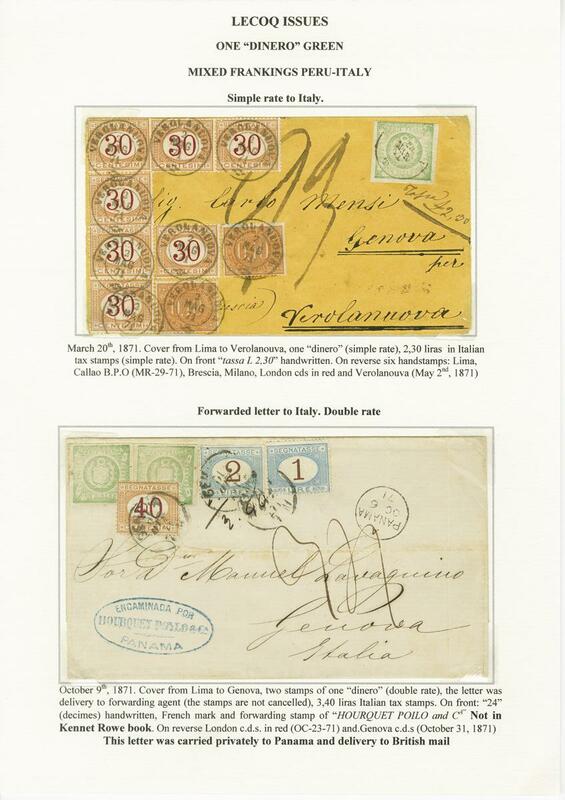 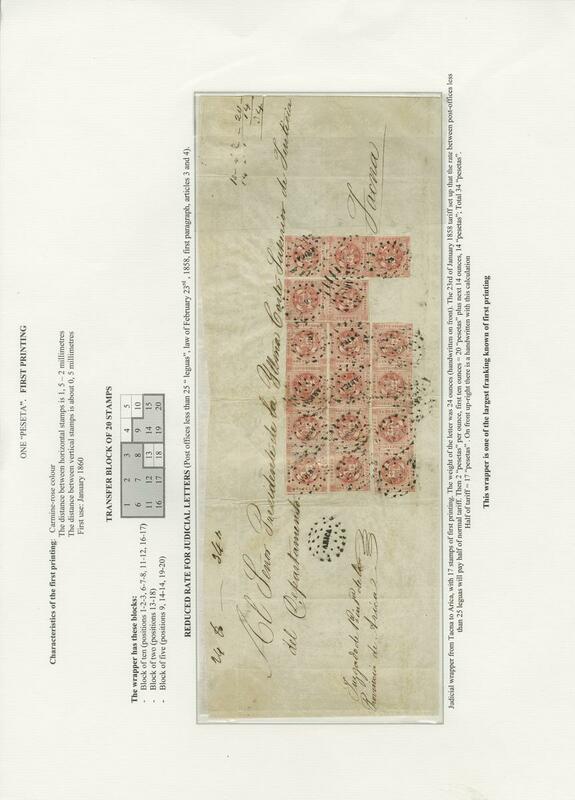 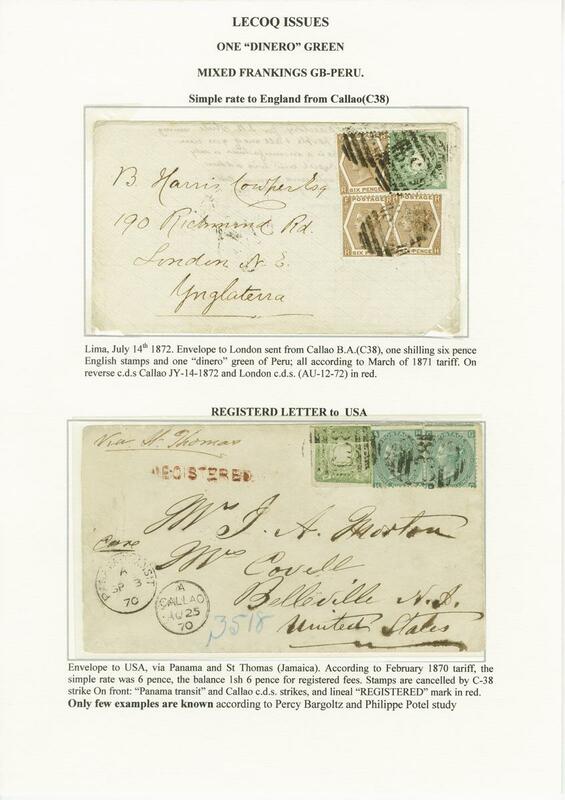 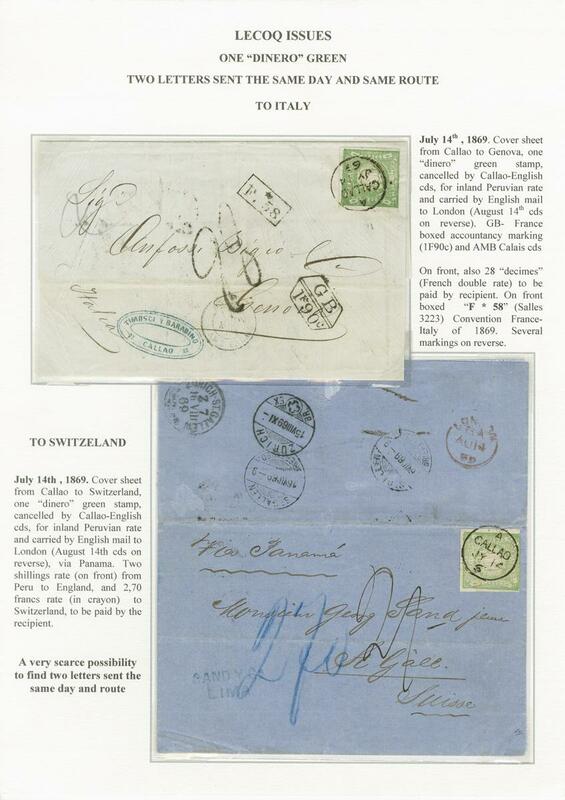 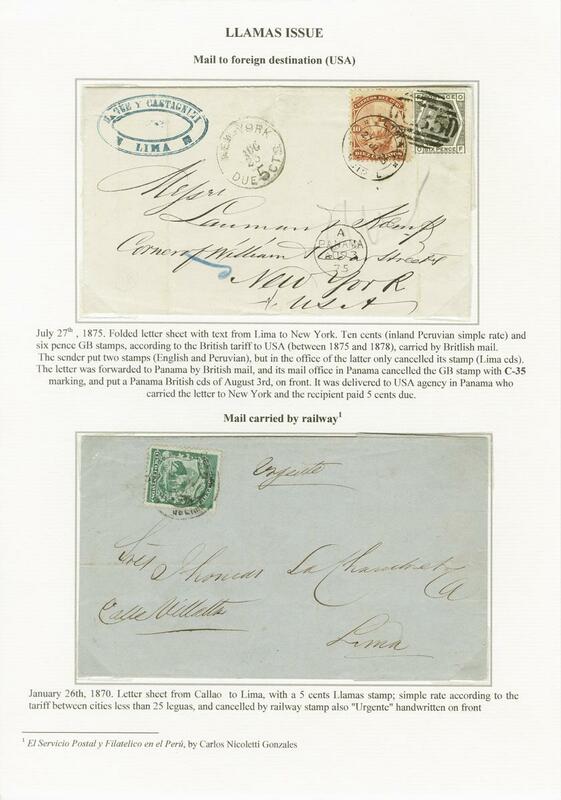 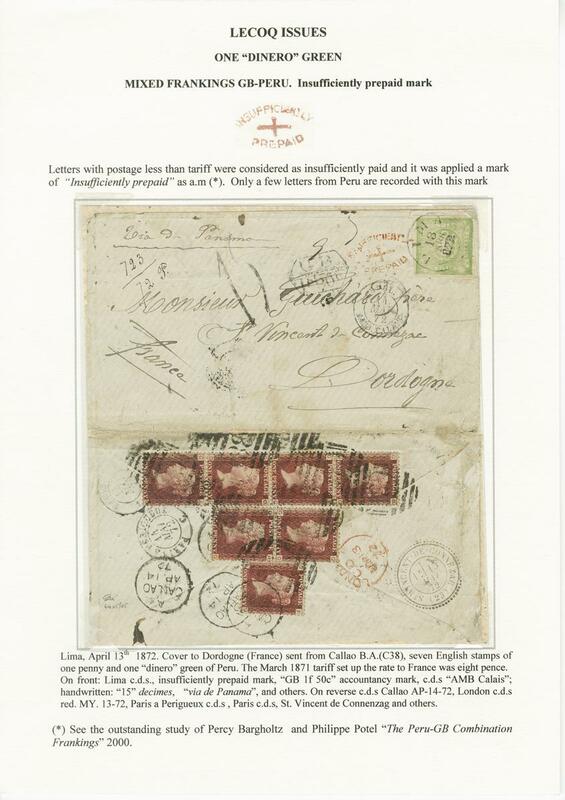 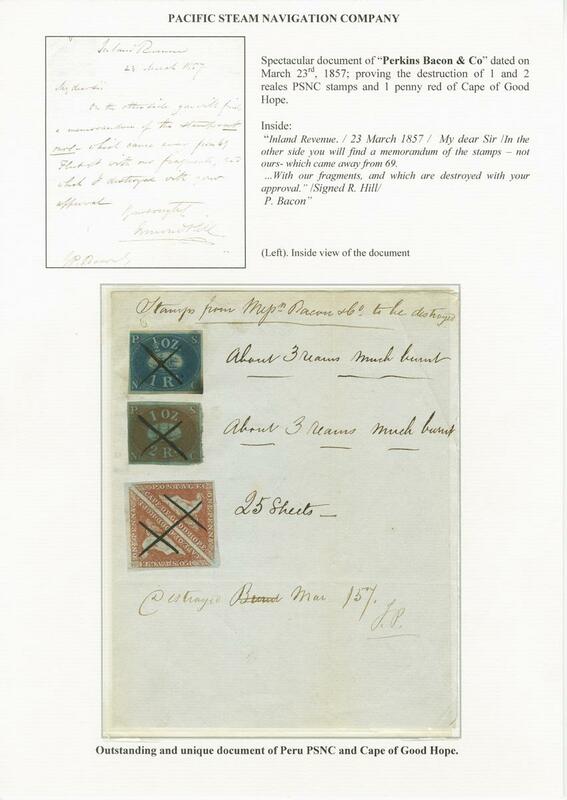 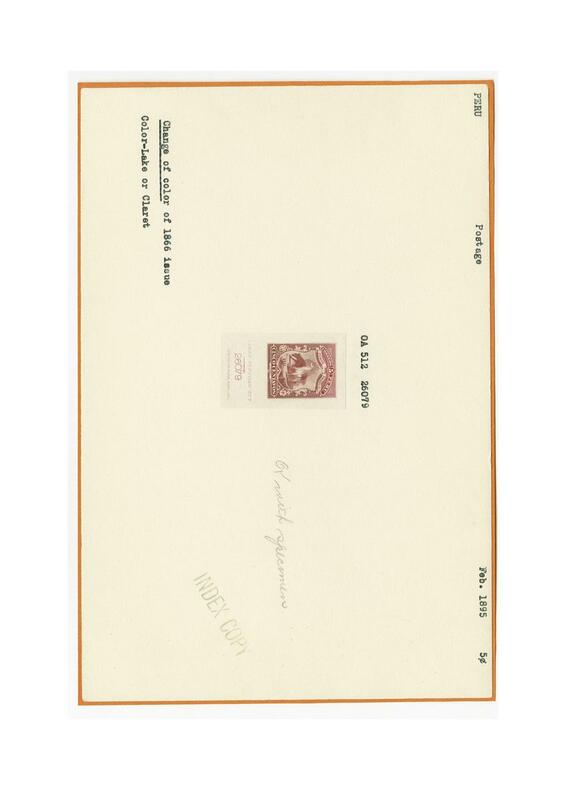 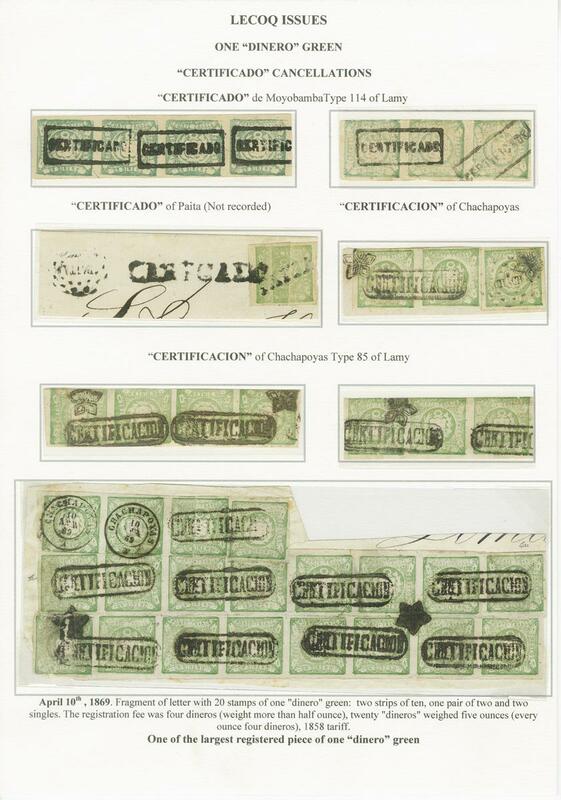 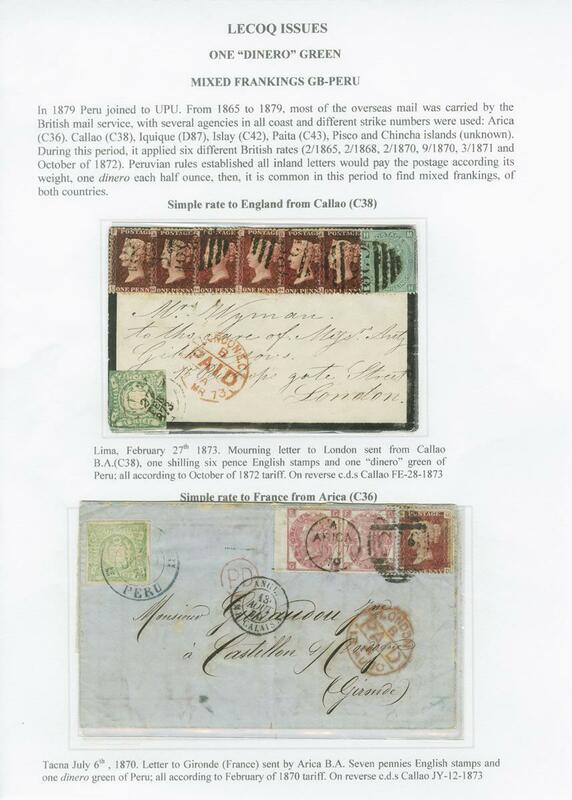 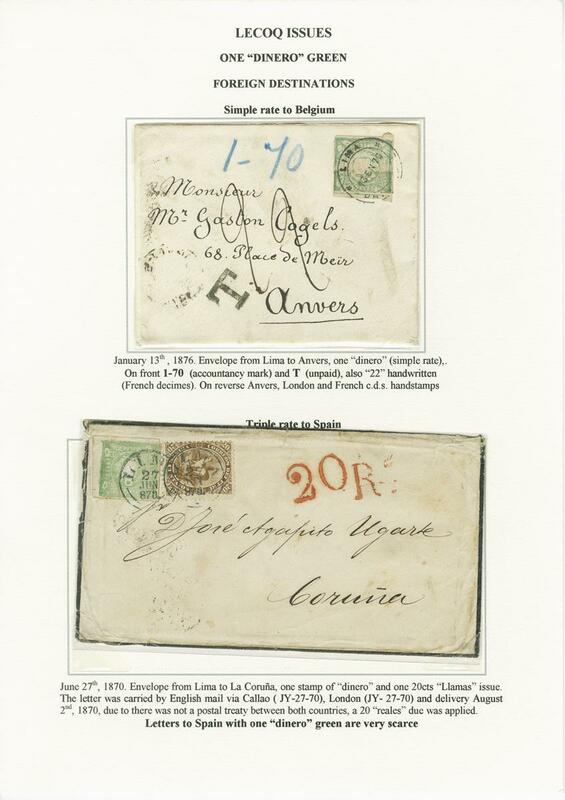 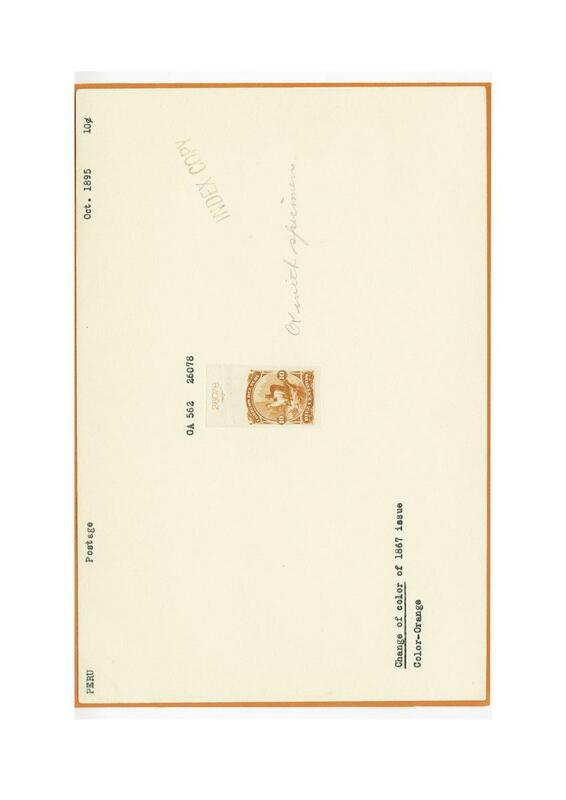 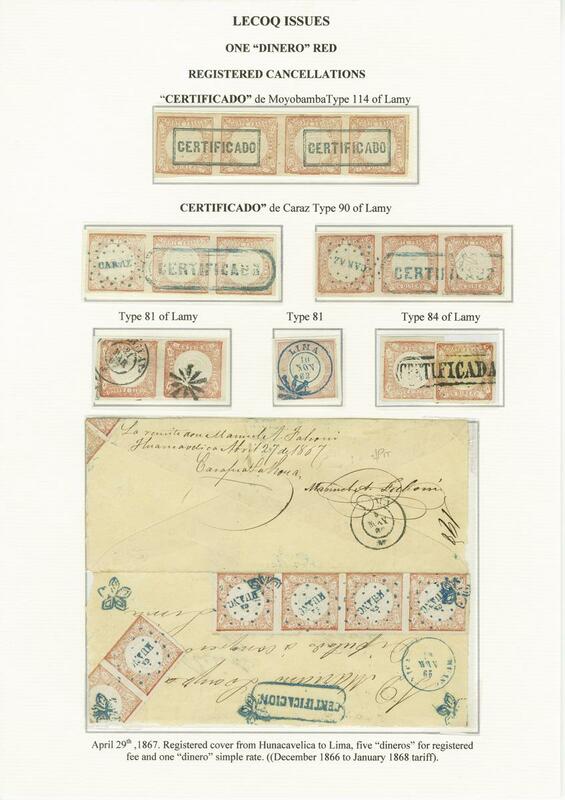 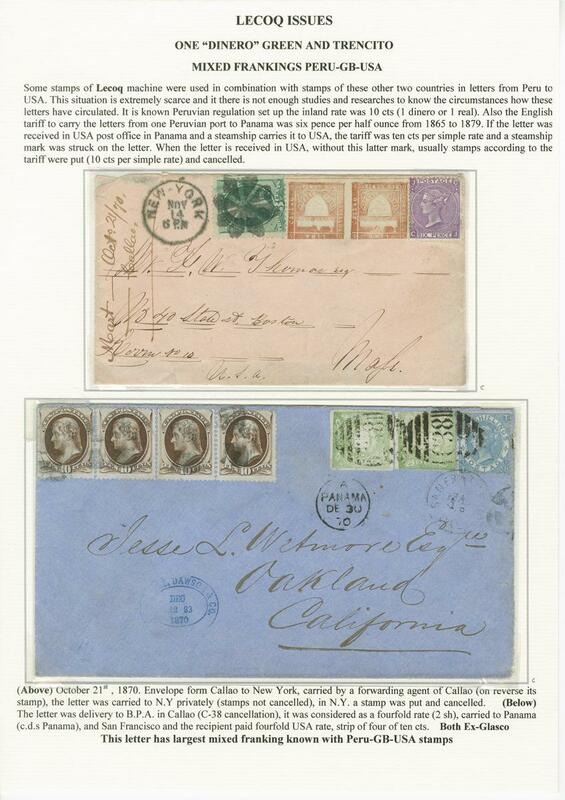 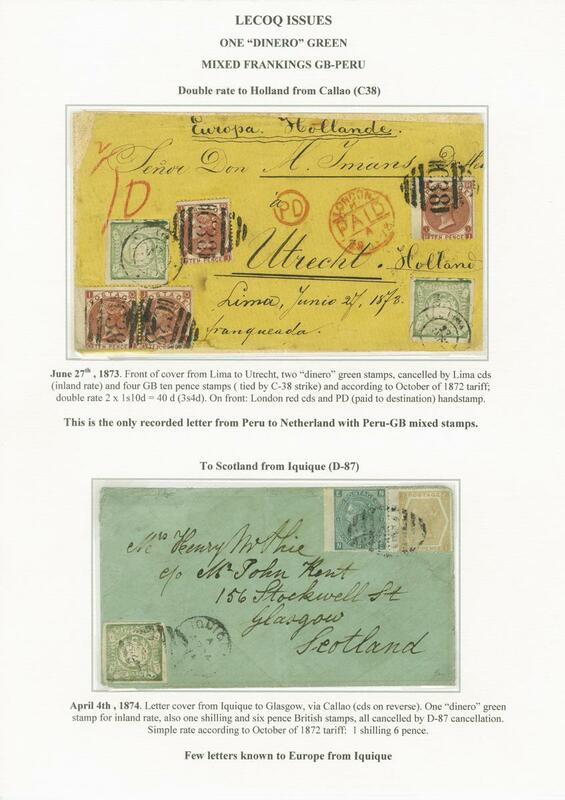 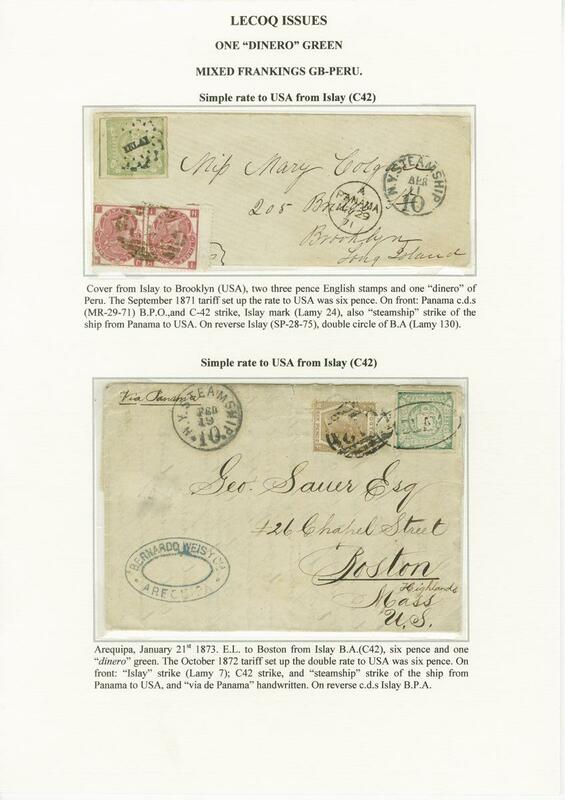 Provenances from Ferrary onwards via Schatzkes, Bustamente, Hubbard, Moll, Le Bow and Eitner, with items from all the famous philatelists of the area. 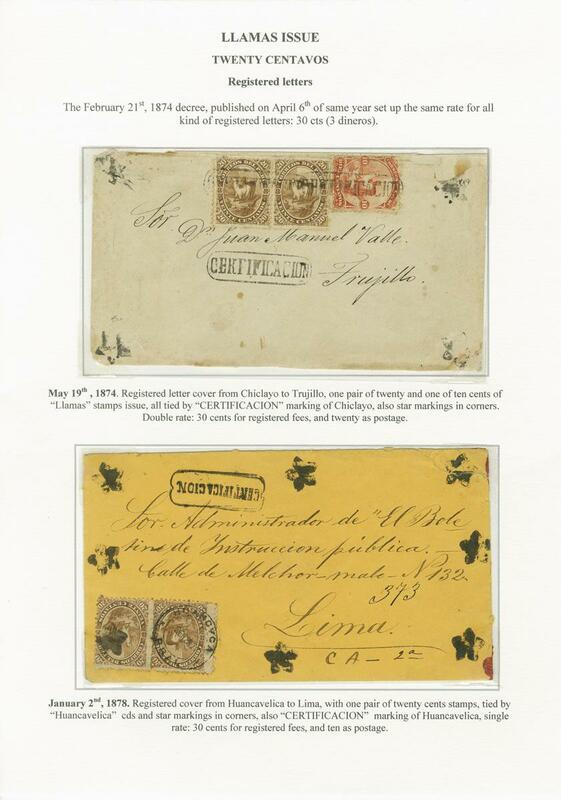 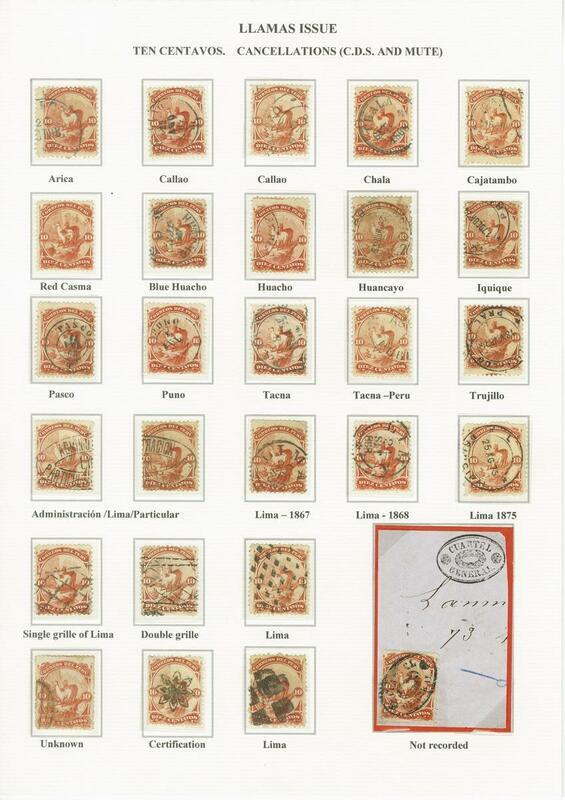 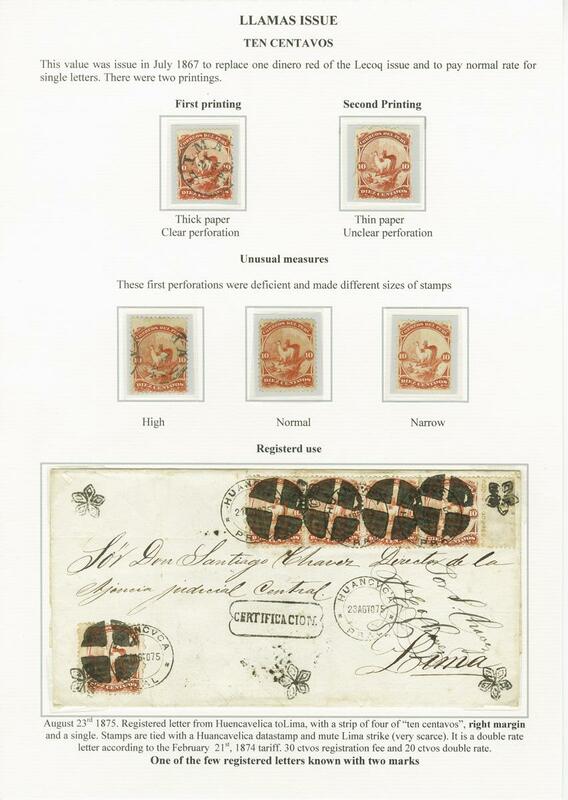 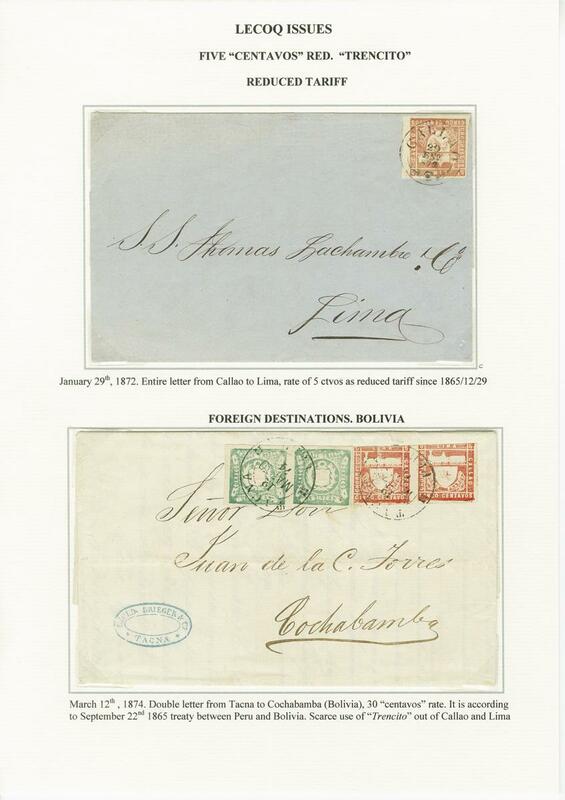 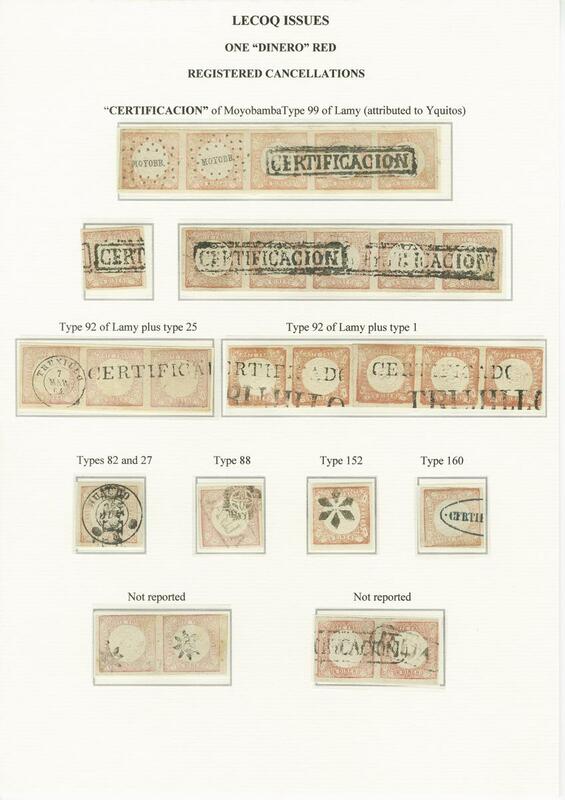 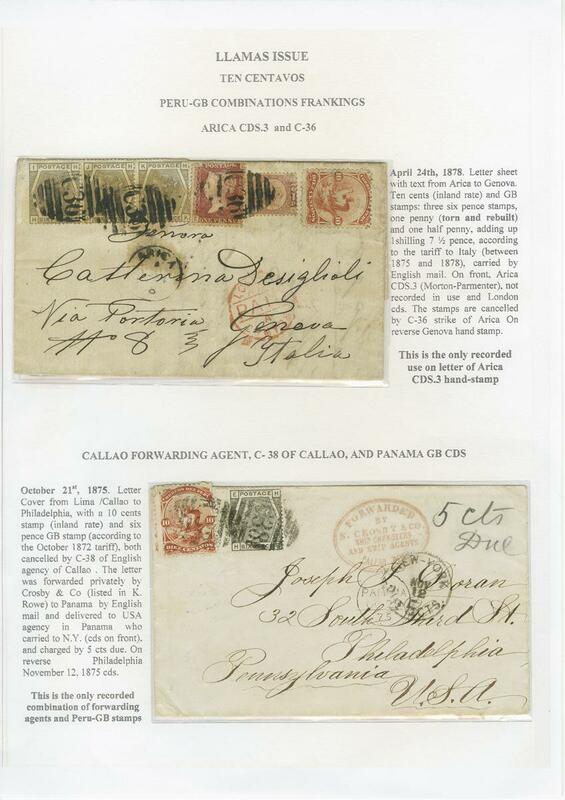 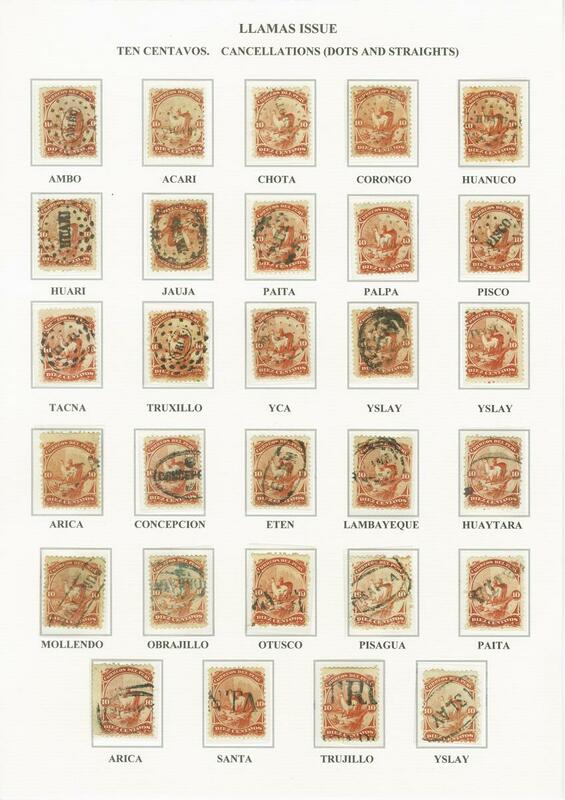 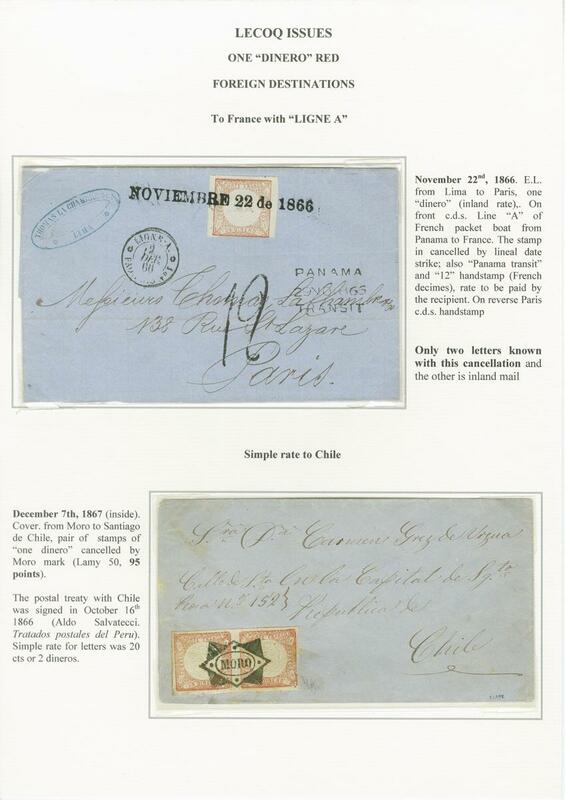 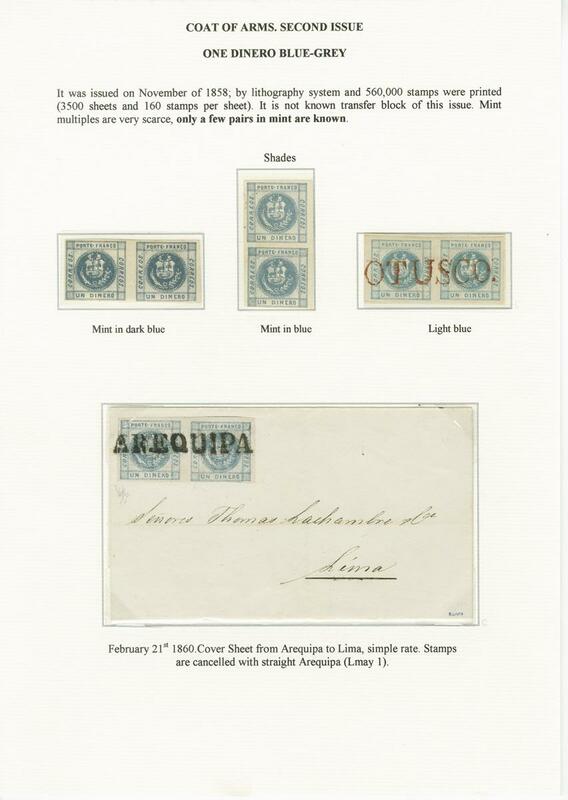 A magnificent collection for the connoisseur of both Peruvian or Classic Philately. 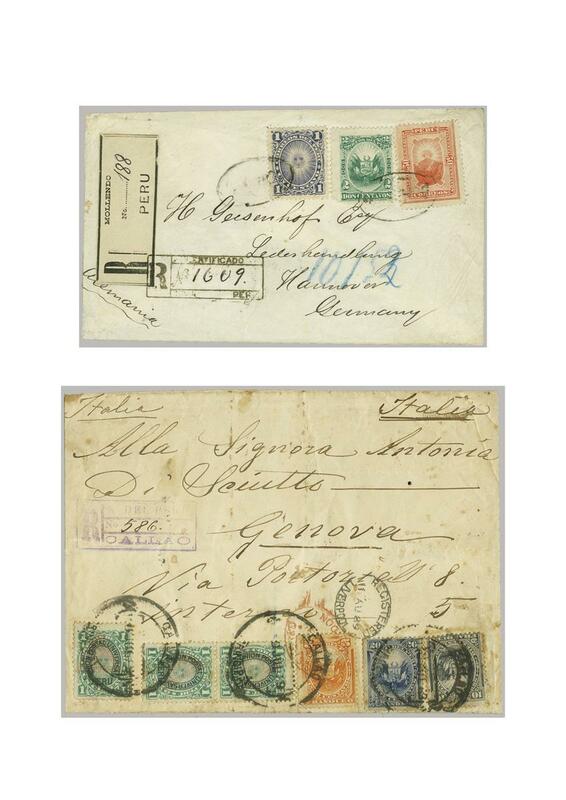 The complete collection can be viewed on request in our Zurich office. 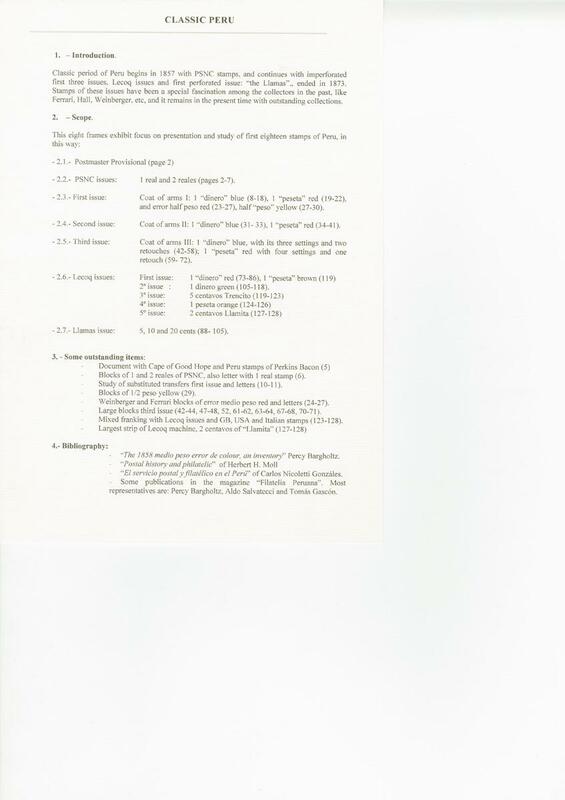 Please send us an EMAIL for further information if needed.